Thursday we left Perth, heading back to Canada. 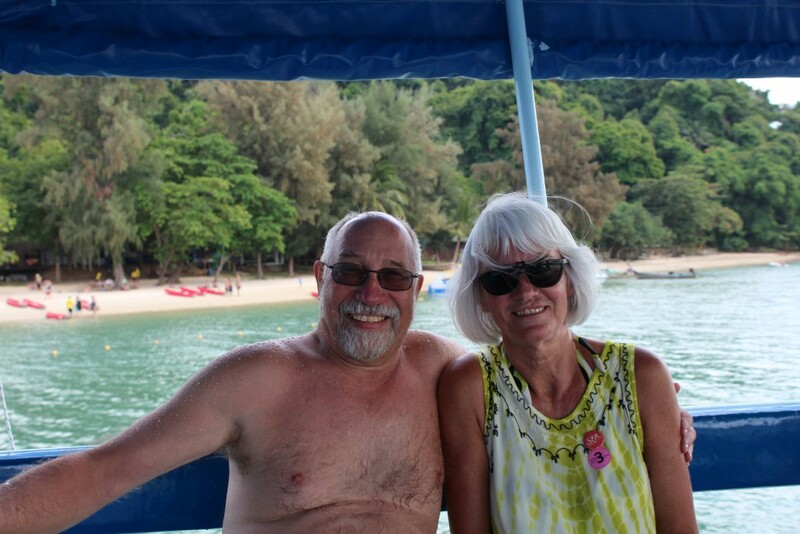 Our flight had two stops – an hour and a half in Kuala Lumpur and almost twelve hours in Tokyo. Not ones to waste a day hanging around an airport, we opted to visit the city. 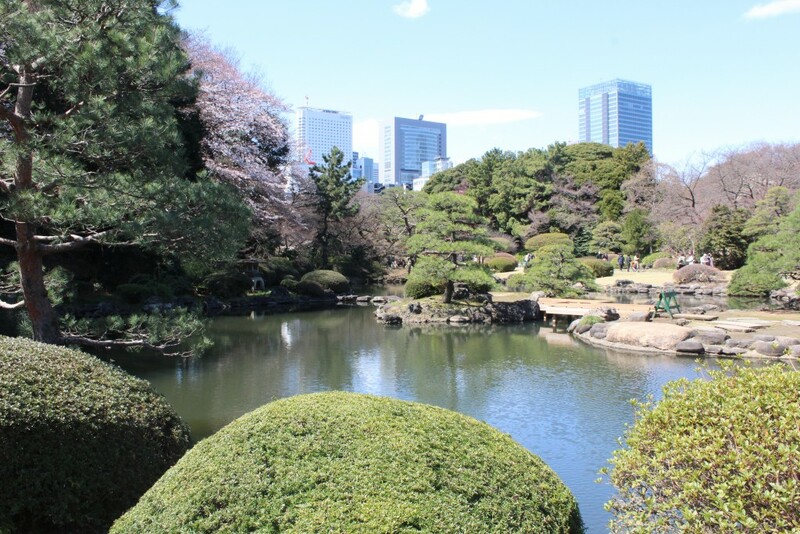 We had read about how beautiful the Shinjuku Gardens were in the Spring so we decided to check it out. 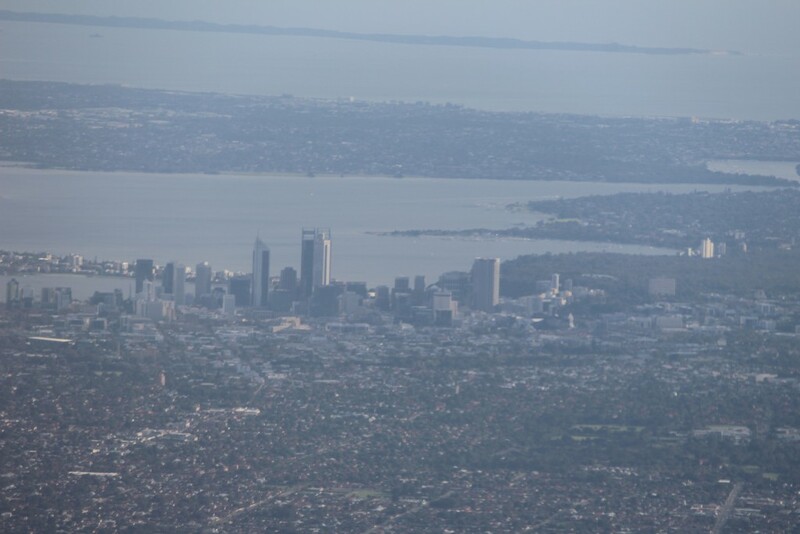 Perth from the air as we leave Australia. Narita Airport, however, is an hour and a half by train from Tokyo, something we did not know. But we had enough time so we took the Narita Express to Shinjuku Station. A return ticket usually costs around 6000 yen but they were having a promotion for tourists, so if you had a foreign passport, you could pick up a return ticket for 4000 yen. (around US$35 or CDN$46.50). Tickets are reserved seating only and for a specified train. Our return tickets were open ended and good for fourteen days but we had to exchange them for specific return tickets before we could go back. The train ride itself is a fun experience. You get to see a lot of the countryside and the city along the way. We passed through several miles of forest, then through a lot of suburban Tokyo – houses and apartments, businesses and pagodas. We also passed through some farmland – rice paddies which lay barren this early in the Spring. 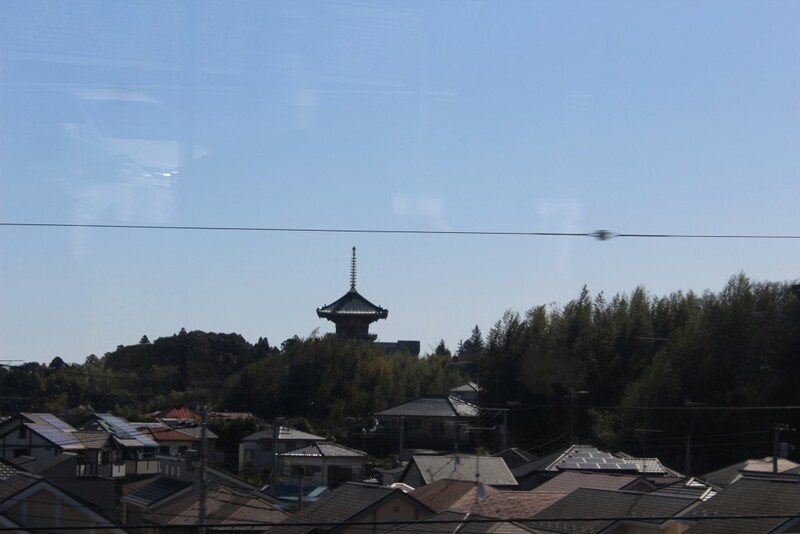 Tokyo suburbs – single family homes and the occasional pagoda. As we got closer to downtown, the buildings changed from single family dwellings to large apartments. We were struck by the penchant for brick in these buildings. 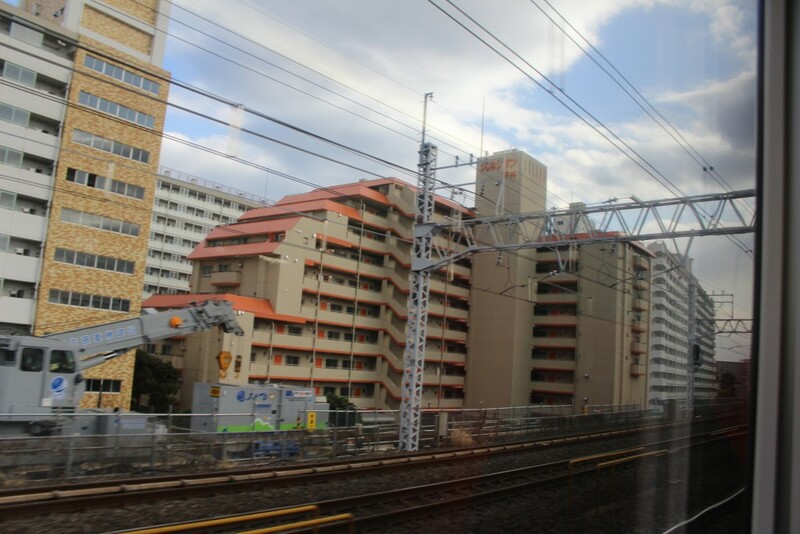 Brick is a very popular building medium in Japan. Brick buildings are popular in Tokyo. 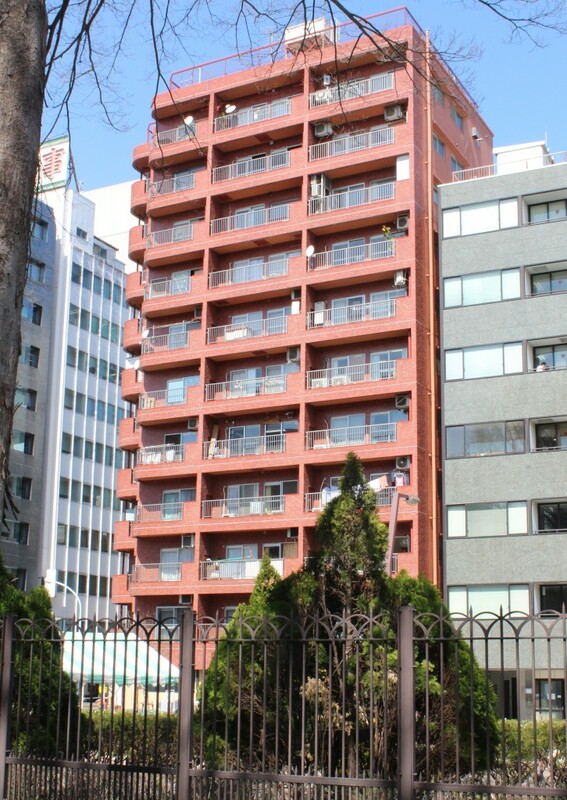 This ten story apartment downtown is across the street from the Shinjuku Gyoen national Garden. At Tokyo’s main train station, different cars were uncoupled and sent in different directions. Our car, number 7, went on to Shinjuku. On the way we passed through Shibuya Station and district. 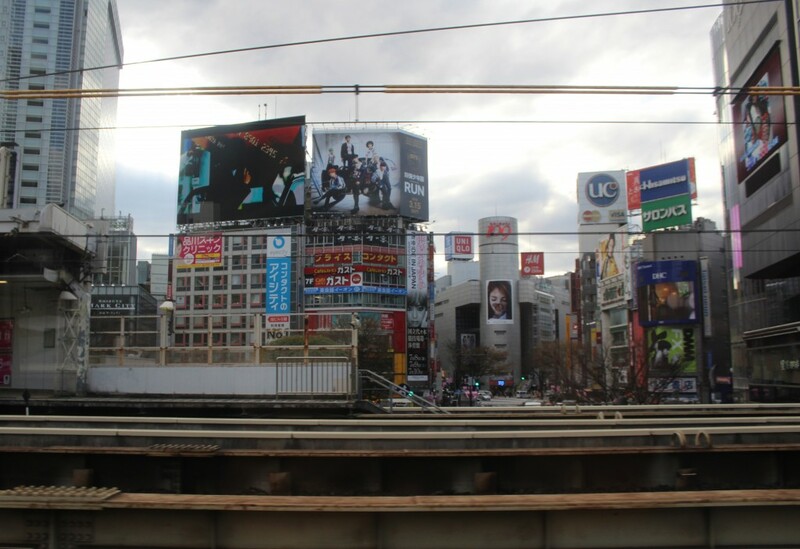 One busy intersection has been called the Times Square of Tokyo and we passed right by it. But if you blink, you’ll miss it. 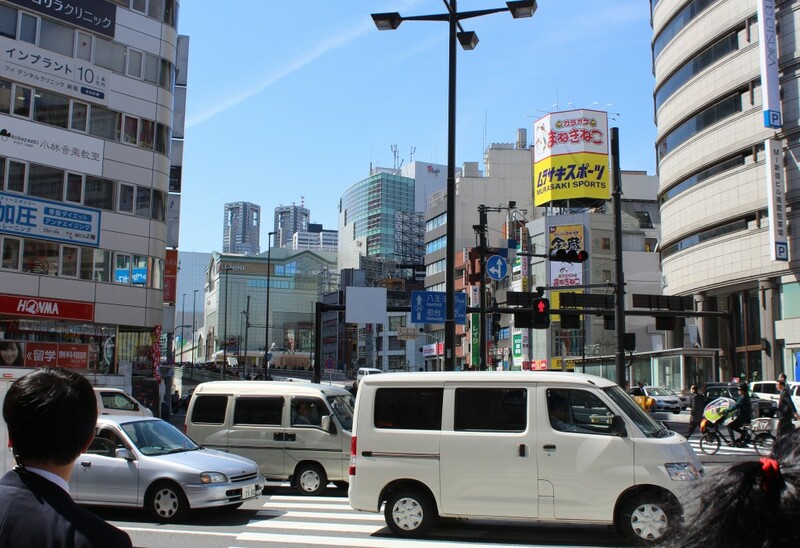 This area of Shibuya has been called the Times Square of Tokyo. I took the picture on the return trip to the airport as it went by too fast the first time. We were there on March 25th so it was just getting into Spring. When our plane landed at 7:30 AM it was just two degrees C outside. The high of the day was fourteen. 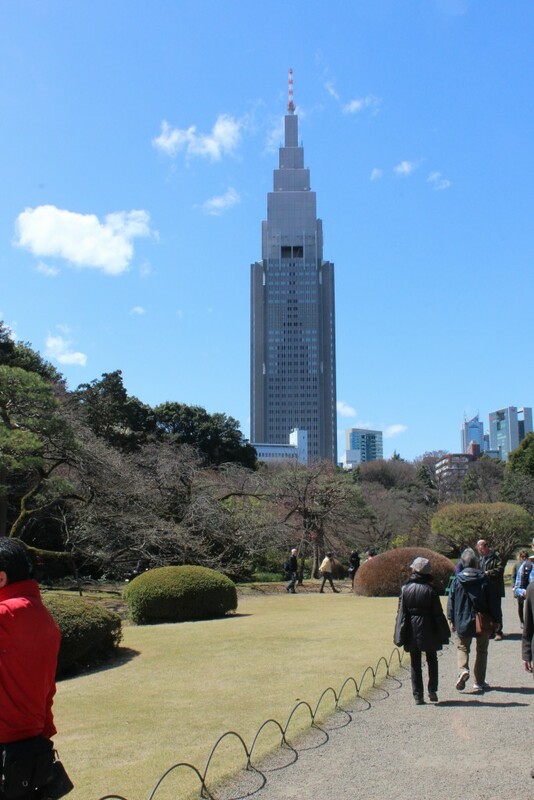 We thought it might be chilly but by the time we got to Shinjuku the sun was out and it was a beautiful day. 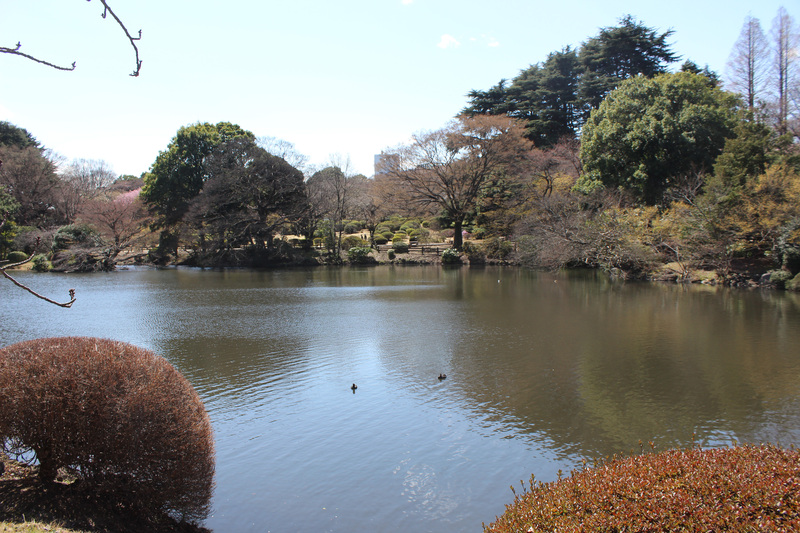 We had picked up a guide and map at the airport and after getting our return tickets, we walked a few blocks to the Shinjuku Gyoen National Garden. This beautiful park in the middle of the city covers 58.3 hectares or 144 acres. It dates from 1772 and took its current shape in 1906. Destroyed by Allied bombers during the war, it was rebuilt afterwards. 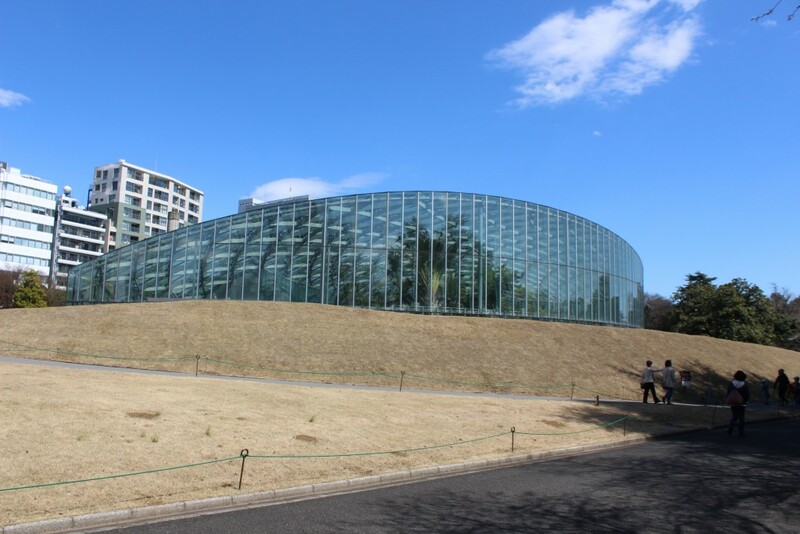 There is an admission of 200 yen to get in (US$1.77, CDN$2.33). And there is no alcohol allowed in the park. You have to submit to a security check before entering. But those are formalities. The park is stunning and worth the admission. 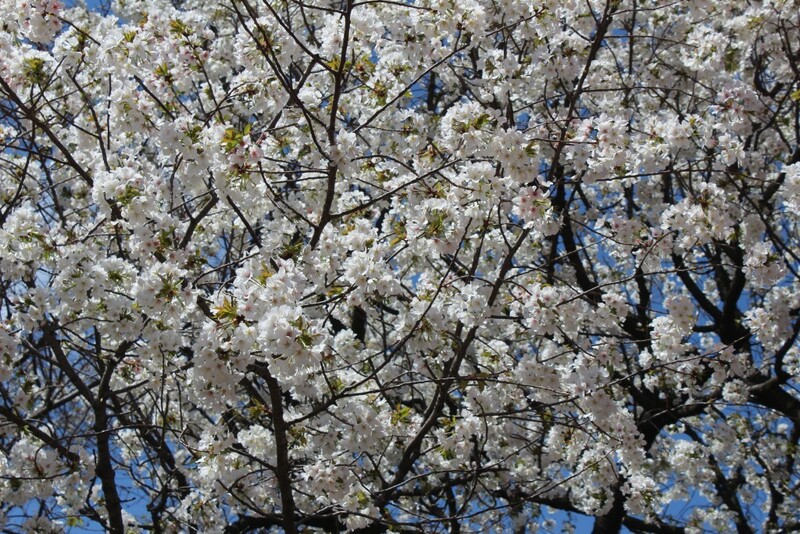 Only a few of the 1500 cherry trees were in full bloom yet, but they were stunning. 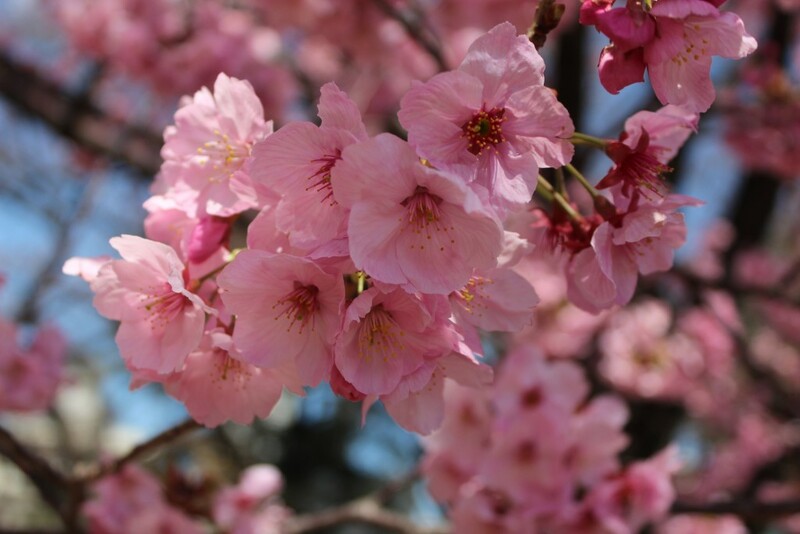 Because it was so early in the Spring, only a few of the 1500 cherry trees were in full bloom. But that was enough to get vast crowds of people out to enjoy the day. 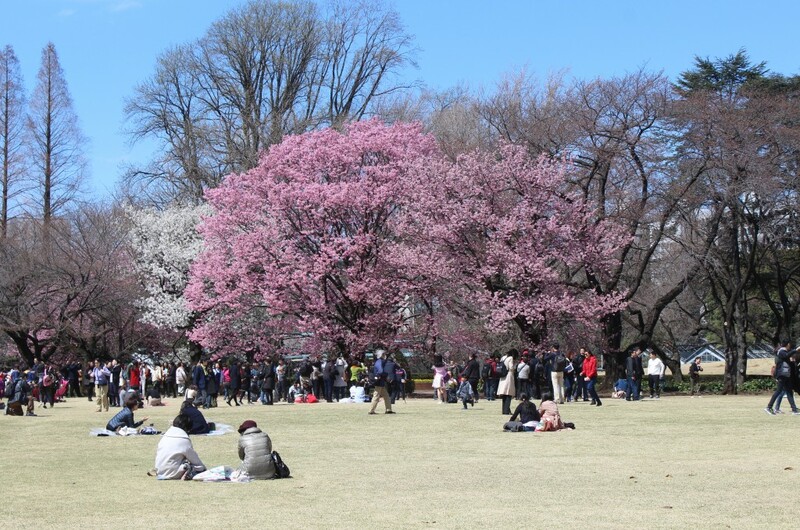 Cherry blossoms are a rite of Spring in Japan and everyone is keen to see them. And Japan is a nation of shutterbugs. Cameras were everywhere. There are a number of different themed gardens within the park. 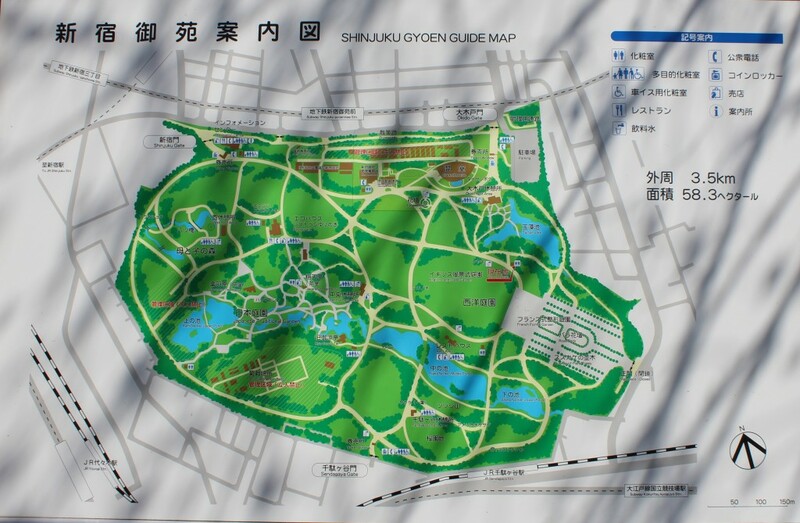 We wandered through the park and came to a map that explained the layout. 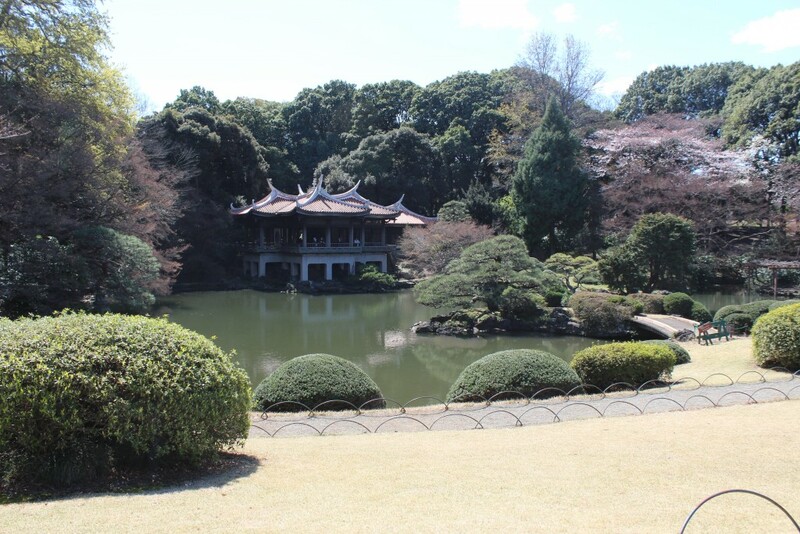 There are different styles of garden throughout and we decided to check out the Japanese Garden. 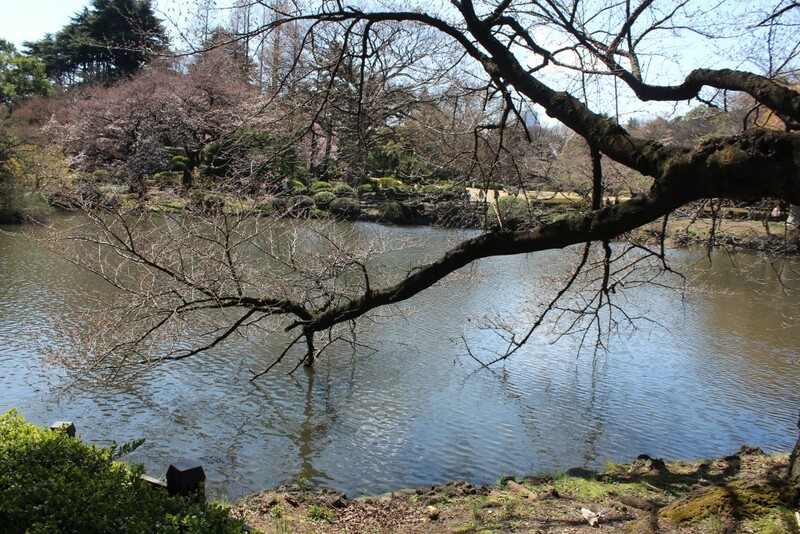 It featured many sculpted trees as well as a lake with koi and a tea house on the far side. 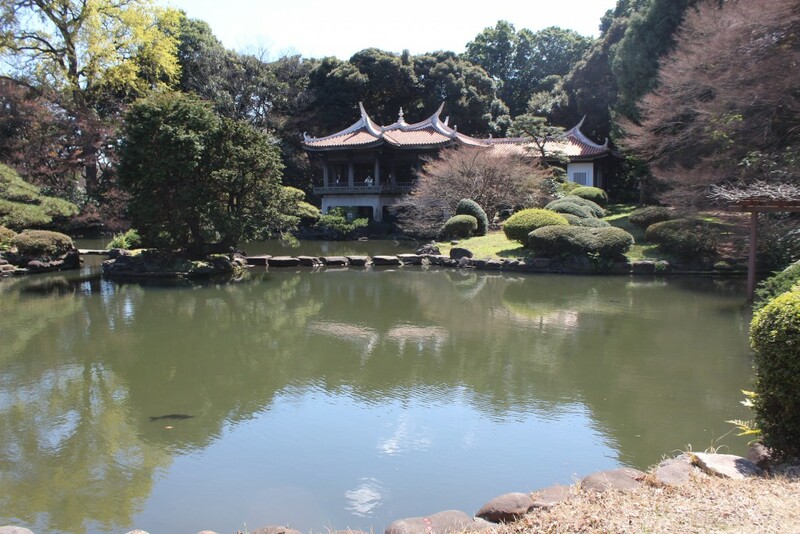 A beautiful Taiwan Pavillion borders a pond in the Japanese Garden. It was the only building in the park not destroyed in World War II. 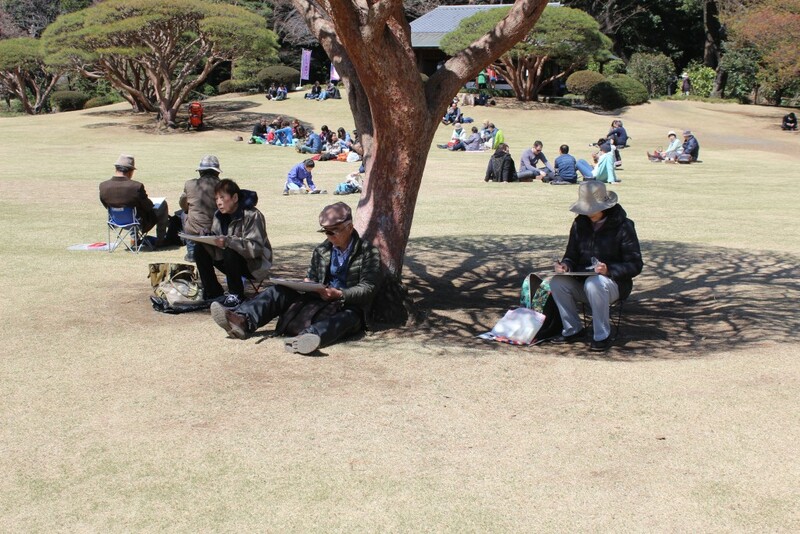 A good number of artists were out drawing and painting. Some sketching in black and white and some painting in colour. 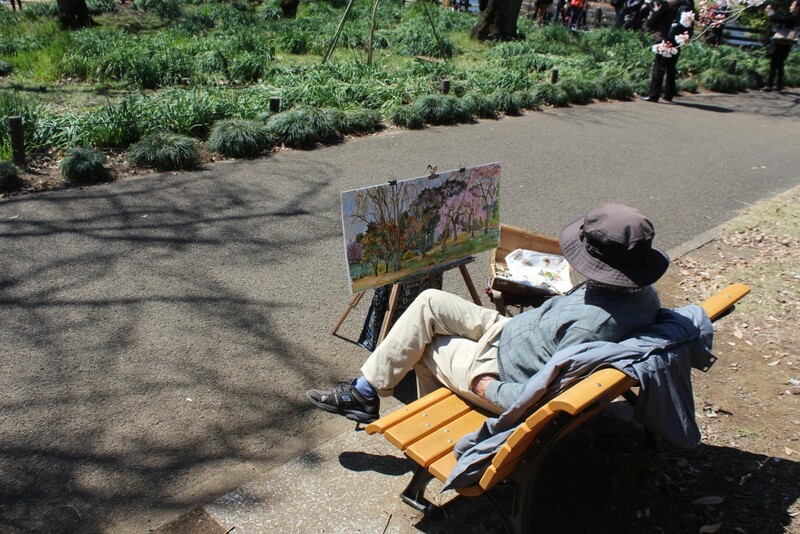 Artists capturing different aspects of the park on their canvases. After the Japanese Garden we walked along a lake and spotted some more trees in full bloom. One of the things that struck me was the age of the trees. 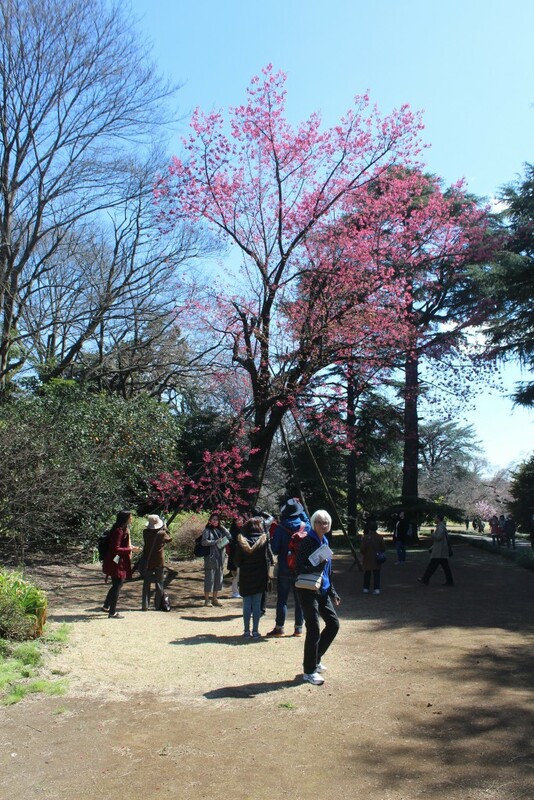 The cherry trees were large and had intriguingly shaped trunks and branches, usually covered with a dark moss. Often the branches would dip right to the ground. We saw one branch hovering just over the water of the lake. One of several lake surrounded by trees and shrubs. We hiked a bit further and saw a large group of bare trees. This was the Avenue of the Plane Trees. 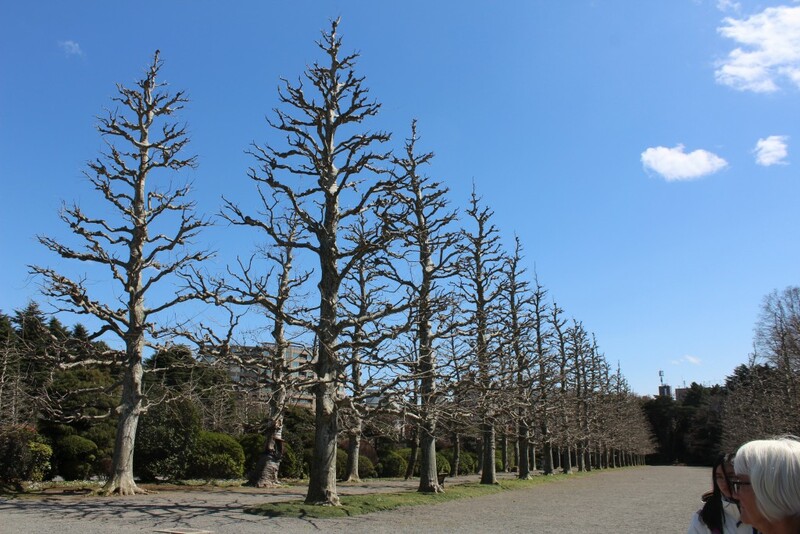 The foliage appears later in the year and the trees are quite stark in their leafless state. They are related to a type of North American sycamore. A double row of plane trees flanks each side of the French formal garden. Between two double rows of plane tree lie a French formal garden lined with rose bushes. They were just coming into bud. 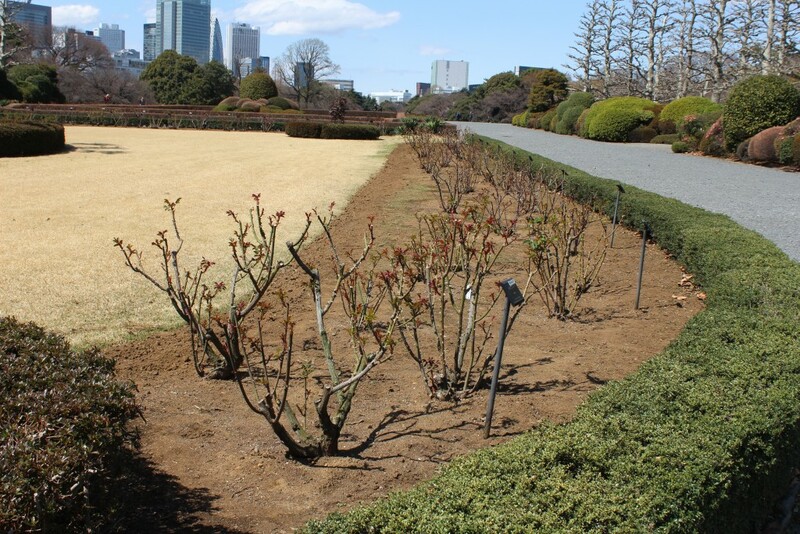 Rows of roses border the French formal garden. They were just starting to bud when we were there. We walked around the French garden and looked over the vast English landscape garden, mostly a huge open field. The grass was brown at this time of year, but later turns into a lush green. It is truly huge – larger than a soccer field, surrounded by trees along its borders. The size and scope of the park is immense. The English landscape garden is larger than a football field. The gravel plaza in front is itself quite large. As we walked back along the path, we noticed a large conservatory, so we headed over there. 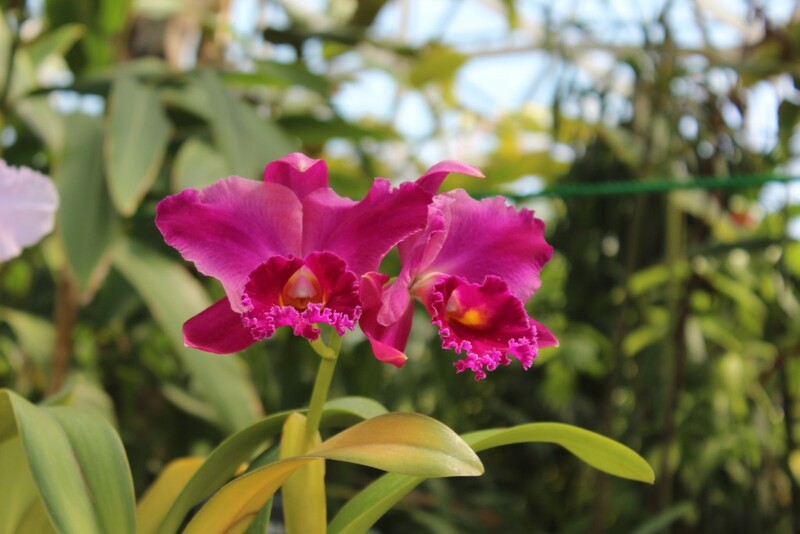 Inside we found a good collection of tropical plants including many orchids. The conservatory doesn’t compare in size or scope to the ones we saw in Singapore, but it was an enjoyable visit all the same. 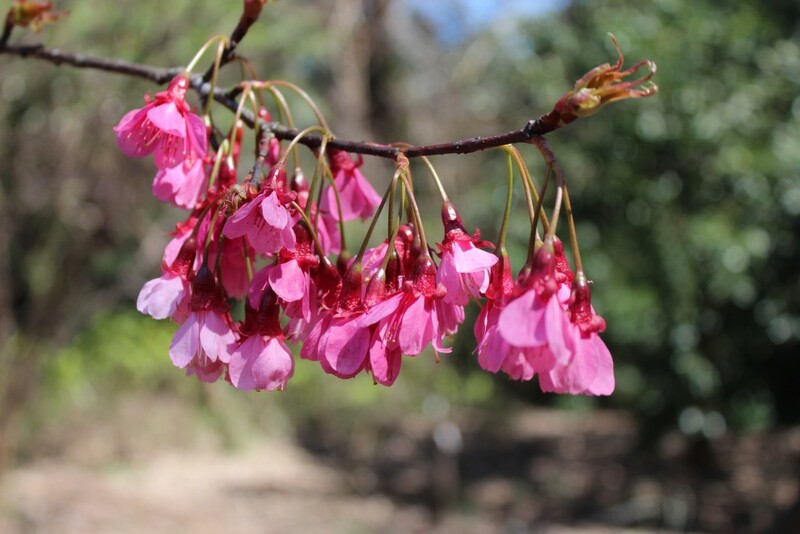 Leaving the conservatory we came across two huge cherry trees in full bloom. There was a large crowd surrounding the trees, cameras out. We took some pictures ourselves, of course. 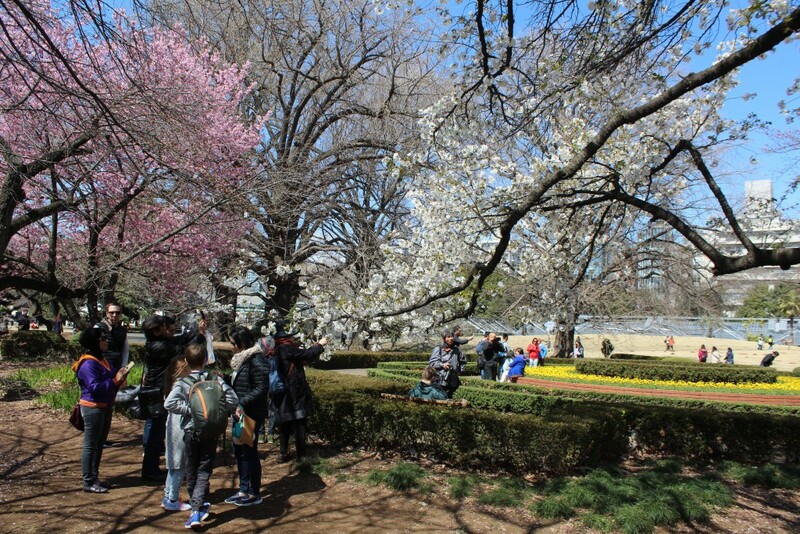 Large cherry trees in full bloom attracted a large crowd. 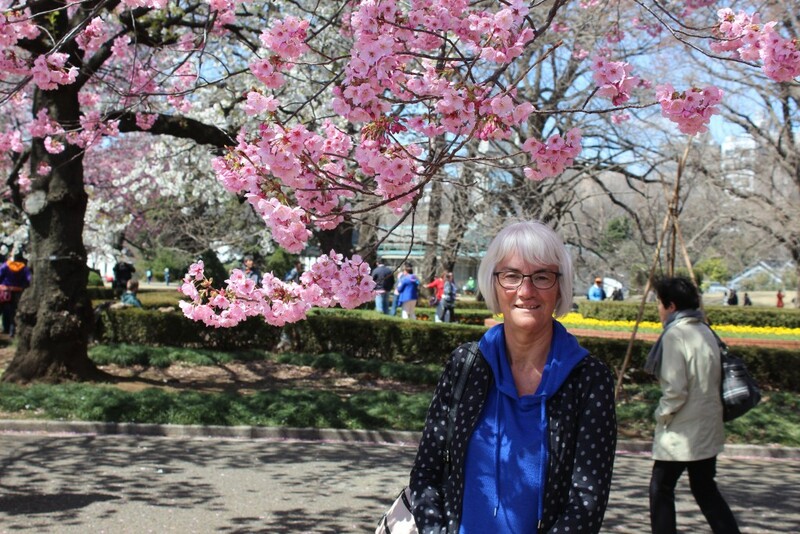 Janis and some cherry blossoms. 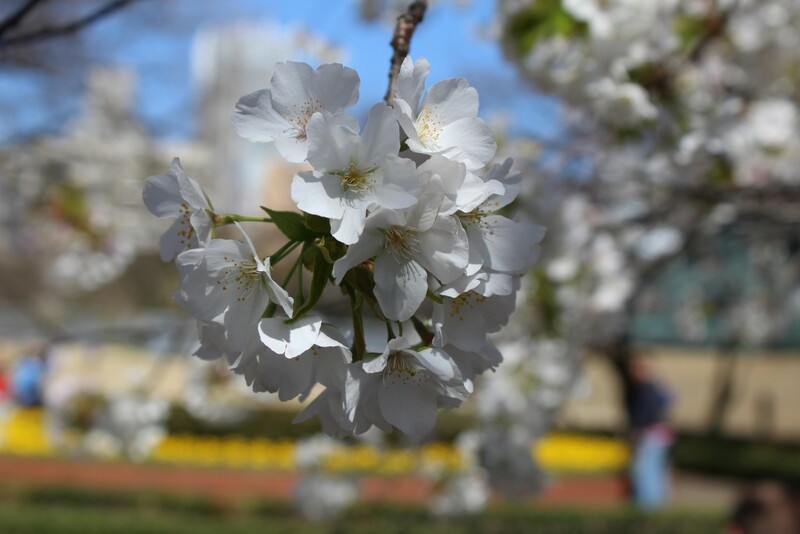 The cherry blossoms are amazing. 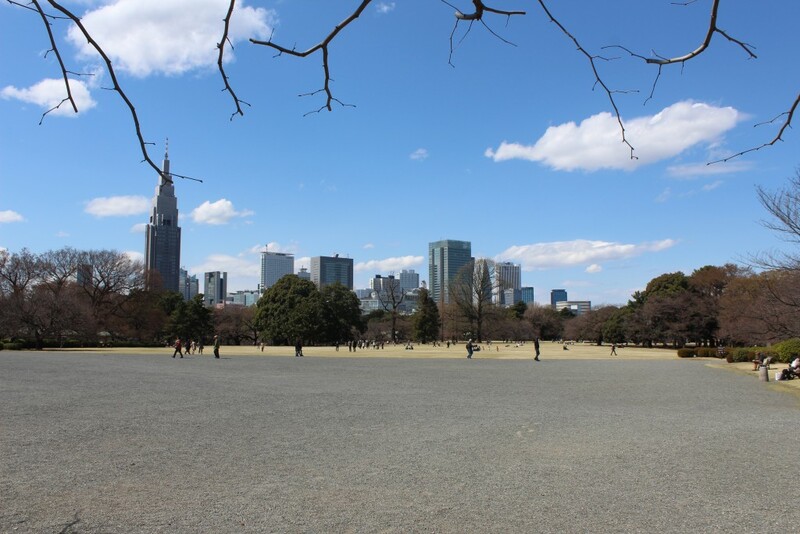 The city in the background had some iconic structures including the interestingly shaped Mode Gakuen Cocoon Tower. This 50 story building houses three educational institutes and is the second tallest educational building in the world. 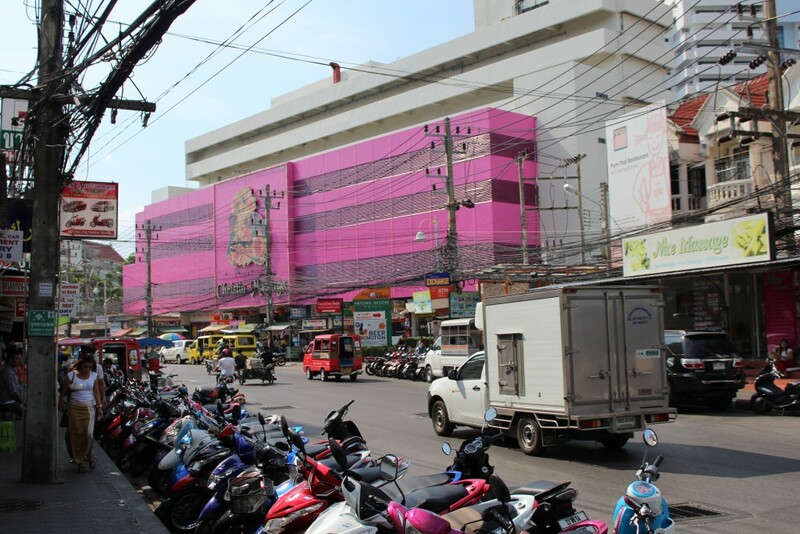 When it was planned, a competition was held to find an architect with the stipulation that the building could not be rectangular. It won the Skyscraper of the Year award in 2008. 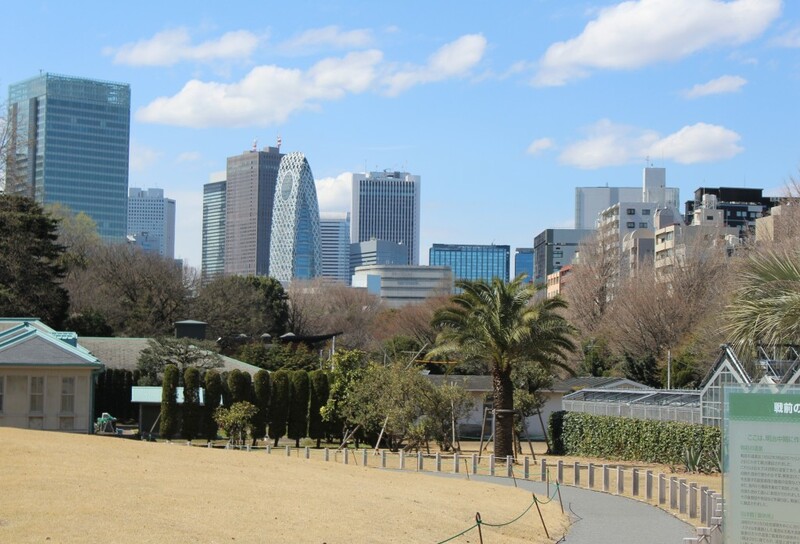 The differently-shaped building in the picture is the Mode Gakuen Cocoon Tower. After leaving the park, we spotted a rickshaw. 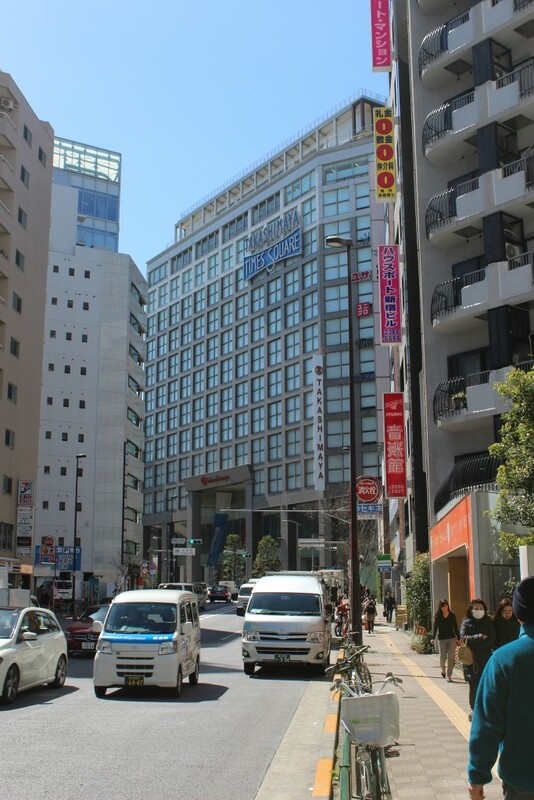 We discovered later that the giant Takashimaya Times Square Department Store adjacent to the park and the railway station was offering free rickshaw rides that day to customers spending 10,000 yen or more. (About US$88 or CDN$116). A rickshaw driver pauses to chat with his passenger while waiting for a red light. We dropped by the store to have lunch at one of the many restaurants there. The top three floors of the fourteen story building are all restaurants with varied menus. We opted for a Japanese restaurant and had a delicious tempura meal. 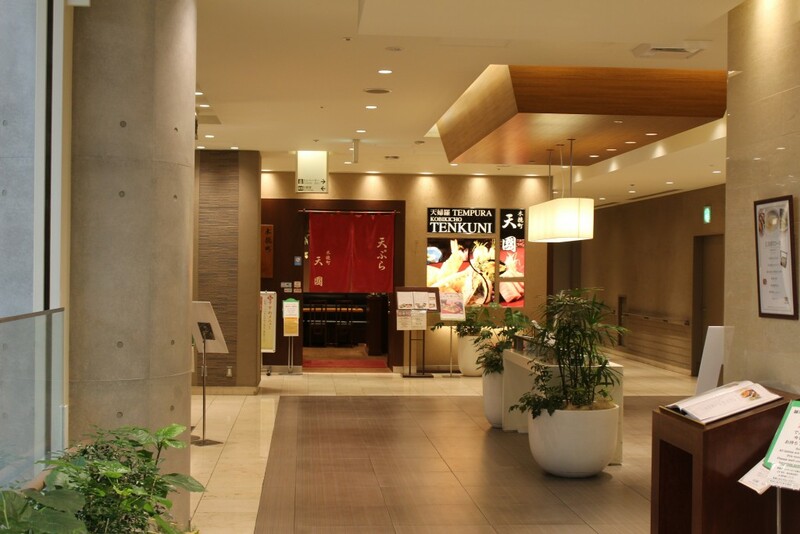 The Tenkuni Restaurant on the 14th floor of the Takashimaya Times Square Department Store features delicious tempura. Afterwards we shopped around a while. The store is comparable to Nordstrom – on the upscale side of things. 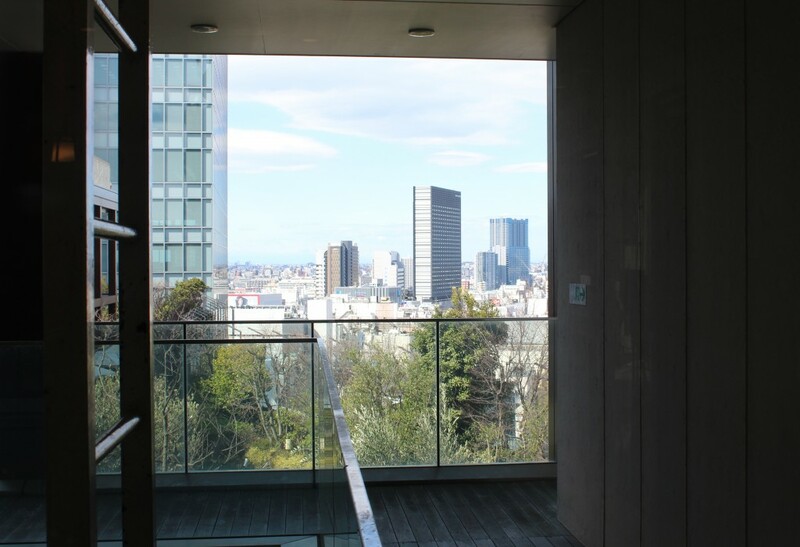 We checked out the 10th and 11th floor which featured crafts and things as we were shopping for a souvenir for our son who loves Japanese culture. Costumes are popular in the fabric department. 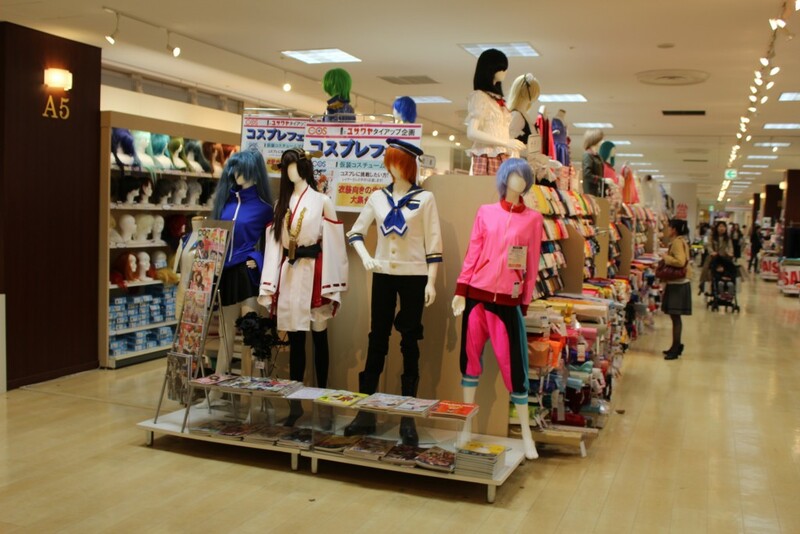 Our son tells us they are for cosplay, a popular activity in Japan. Among the departments we found a fabric department that included costumes (for cosplay according to our son), a section where traditional Japanese clothing was hand made to order, a school uniform boutique (all Japanese school children wear uniforms), a bakery and deli foods section, a variety of craft and souvenir shops and one that sold very elaborate and expensive samurai shrines featuring hand-made dolls in detailed costumes. 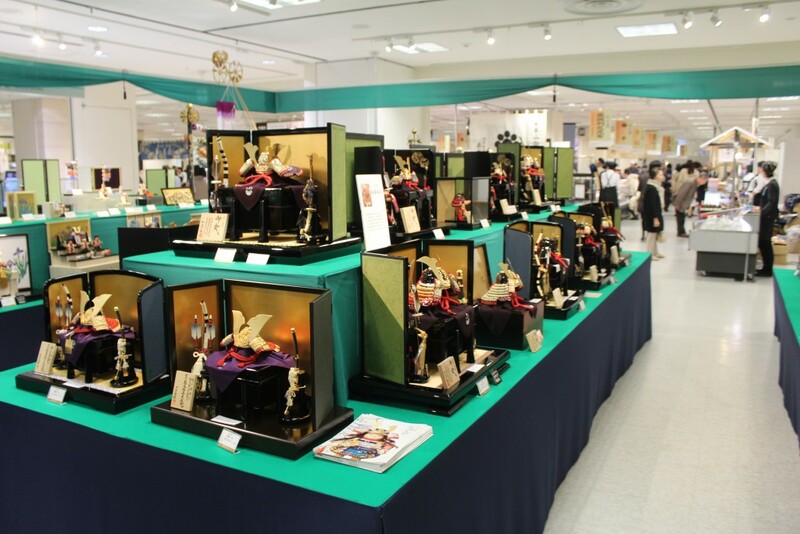 A display of elaborate samurai dolls and shrines. They are fairly pricey, but absolutely gorgeous. A clerk gave me a brochure in English explaining that these were Tokyo seasonal festival dolls, called Edo Sekku Ningyo, a tradition going back to the 18th century. The feudal government of the mid-1700s limited the size and luxuriousness of the dolls. This forced artisans to come up with creative ways to create their wares with an austere elegance that continues to this day. But today, some of these run into the hundreds of thousands of yen (or thousands of dollars). 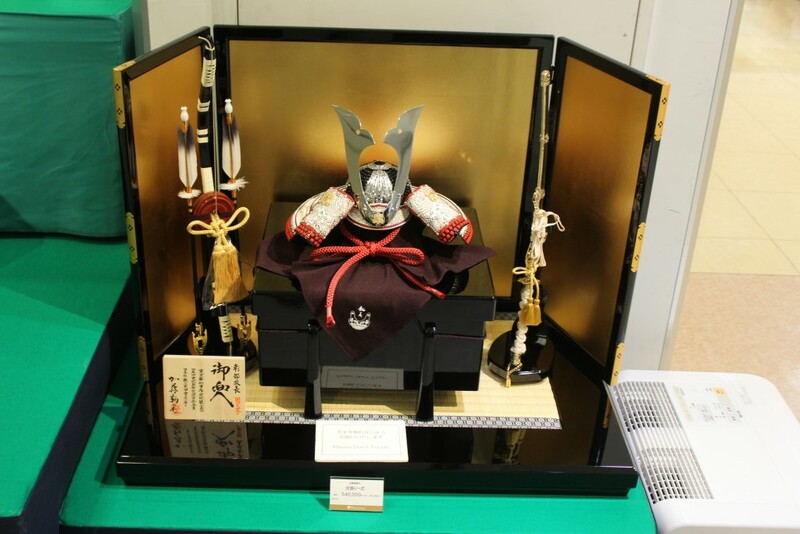 This elaborate samurai doll shrine sells for 421,200 yen (about US$3700 or CDN$4900). There are two festivals where these dolls are much prized, the Girls Festival of March 3rd and the Boys Festival of May 5th. The store has an online catalogue and I’ve linked the page through Google Translate so it is in English. Worth a browse. 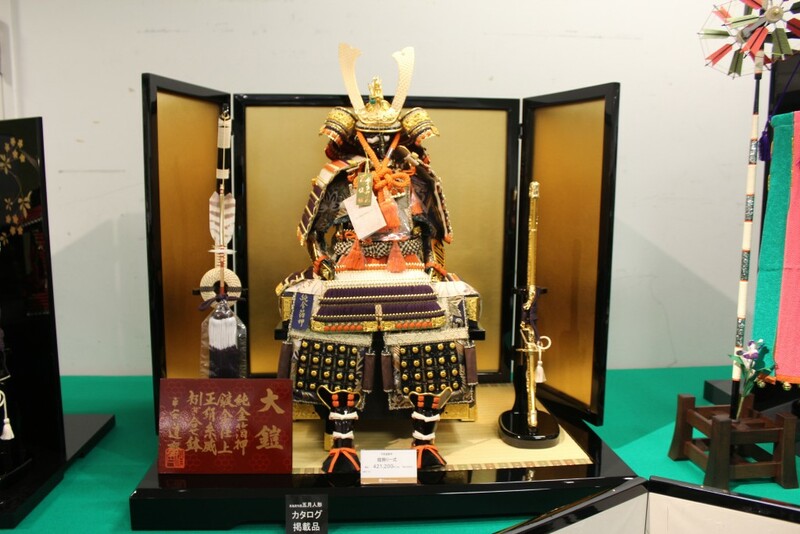 Yet more elaborate samurai doll displays. We browsed some more and found something for our son. 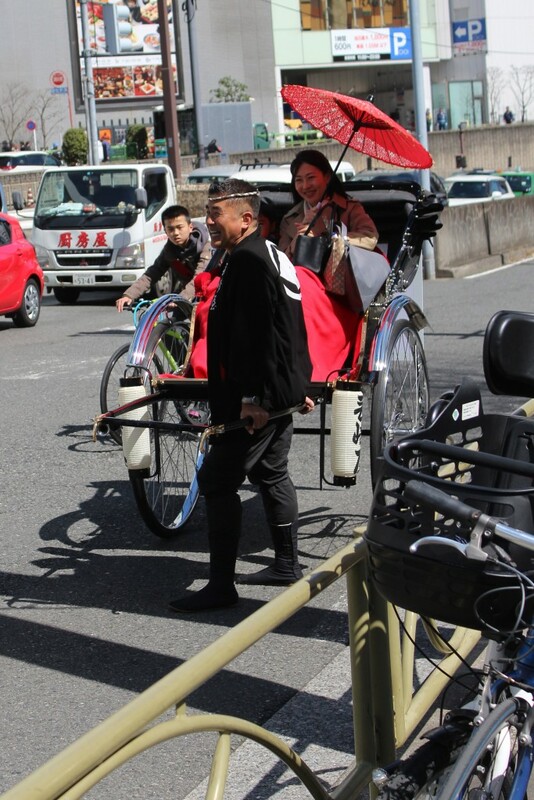 We had spent over 10,000 yen including lunch, but time was short so we could not take advantage of the free rickshaw ride. We hopped the Narita Express and headed back to the airport, a very enjoyable morning and afternoon in Tokyo. 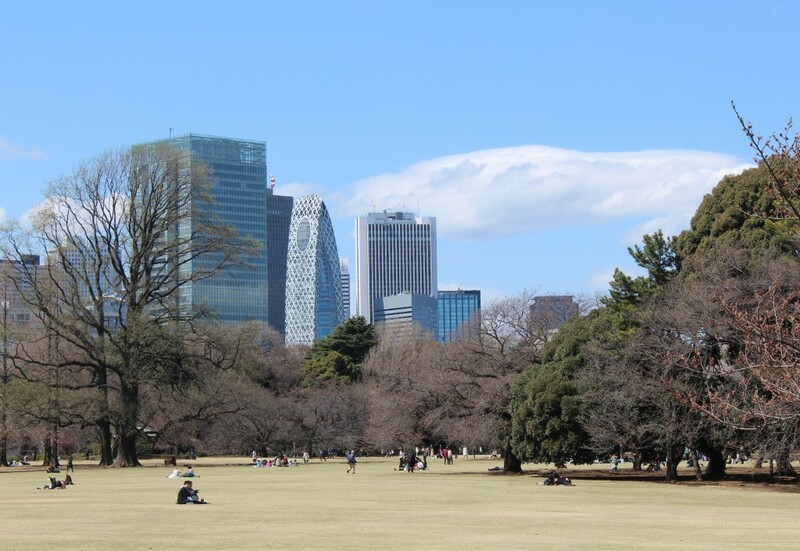 If we have another layover on our return to Australia in July, we will take in the Shibuya district, and maybe the downtown area of Shinjuku. The Tokyo Metropolitan Government Building features twin towers with free public observation floors on the 45th floor, definitely something worth checking out. 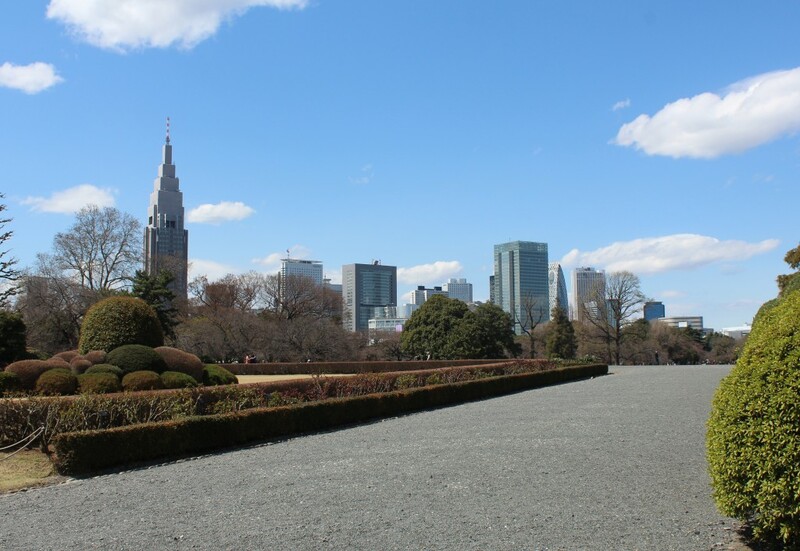 Tokyo is a fabulous city and we would love to visit it again. The twin towers on the left are part of the Tokyo Metropolitan Government building which has free public observation platforms on the 45th floor. 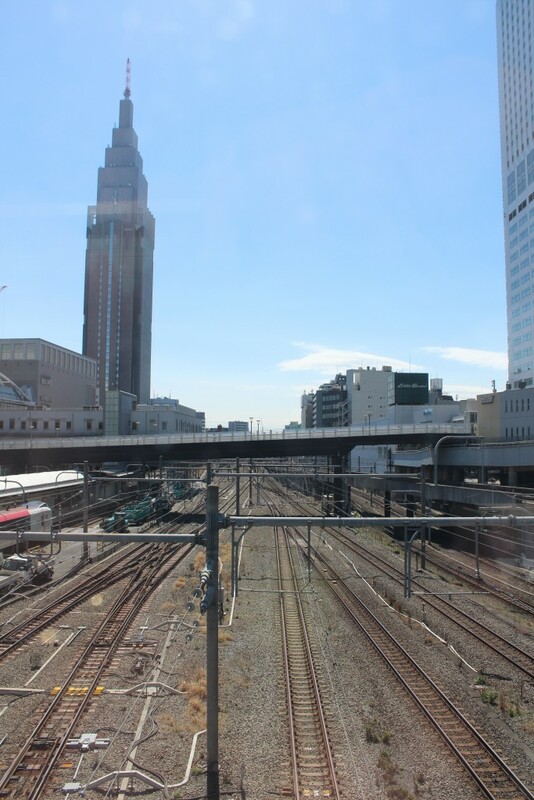 Train tracks approaching Shinjuku Station. 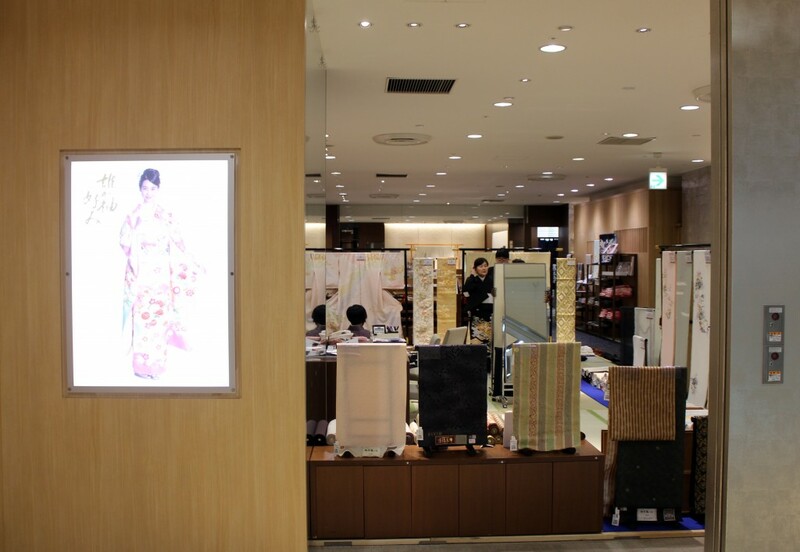 The fourteen story Takashimaya Times Square Department Store next door to the Shinjuku train station. The top three floors are all restaurants. 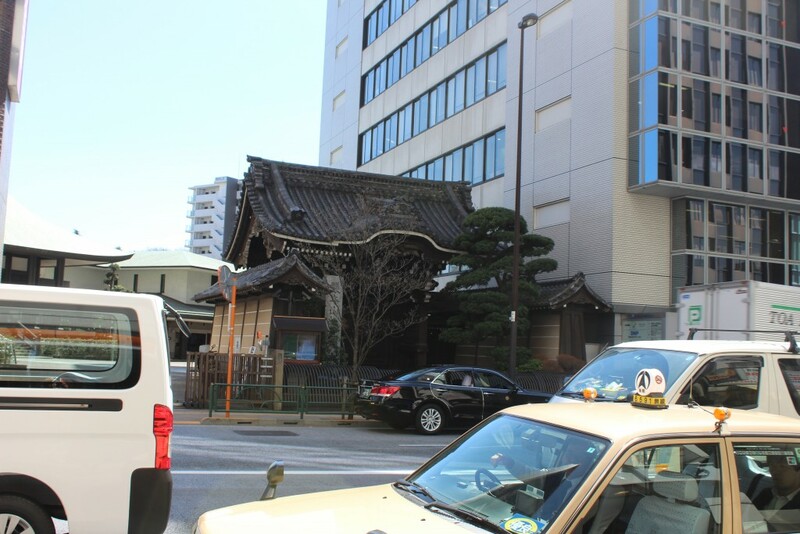 There are some traditional structures sandwiched between the modern buildings of Tokyo. 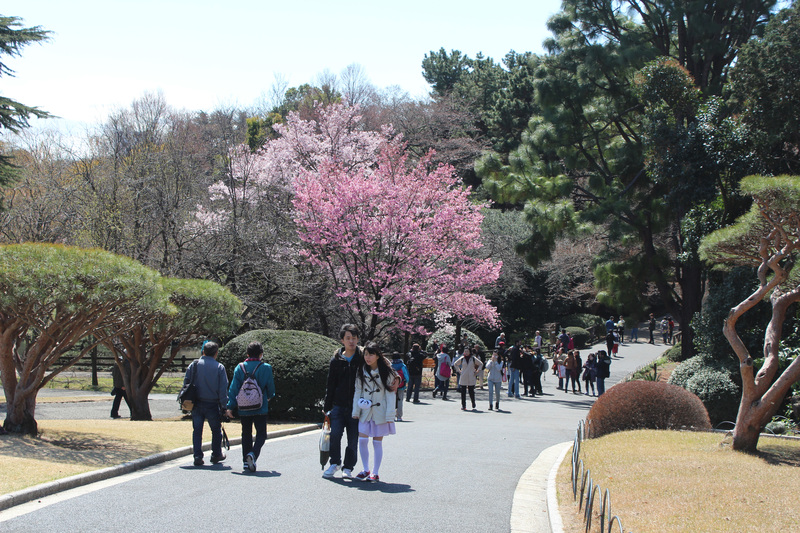 A plum tree in bloom in Shinjuku Gyoen National Garden. 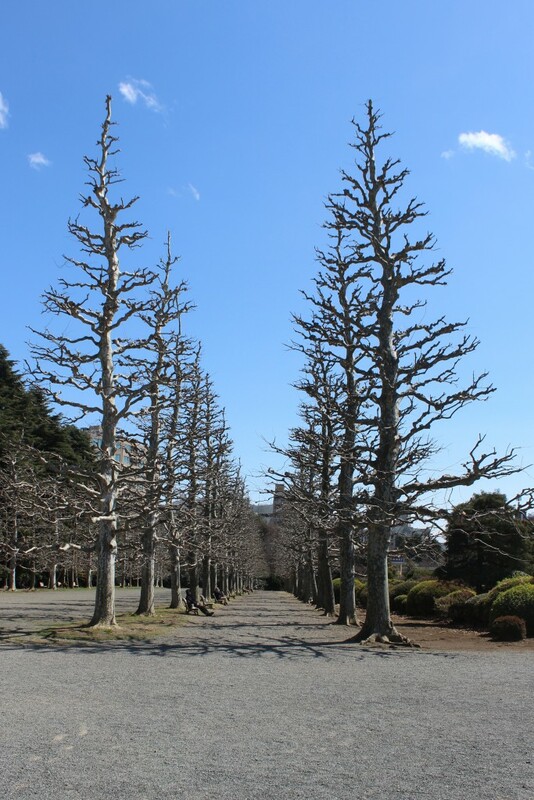 A number of the large trees are supported by stakes. 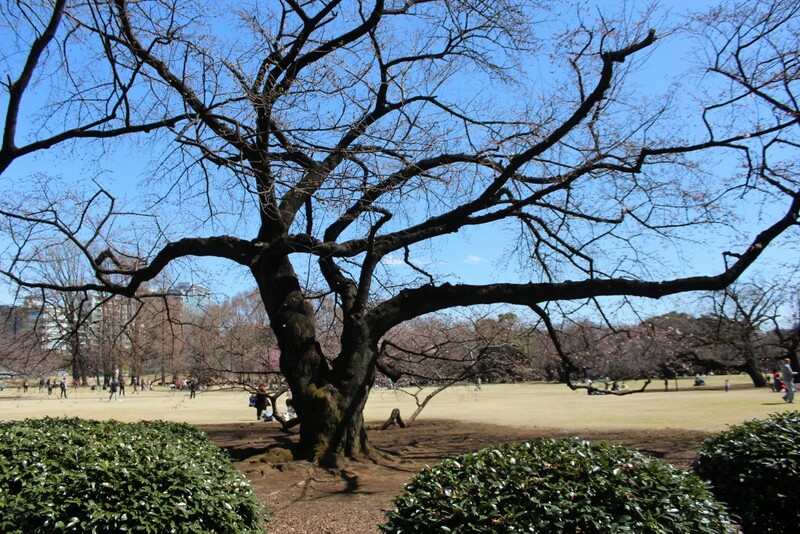 The old cherry trees are large and have elaborate branch networks with some branches touching the ground. Notice the branch just beyond the trunk. In the next picture, you’ll get a better idea of the size of this tree. 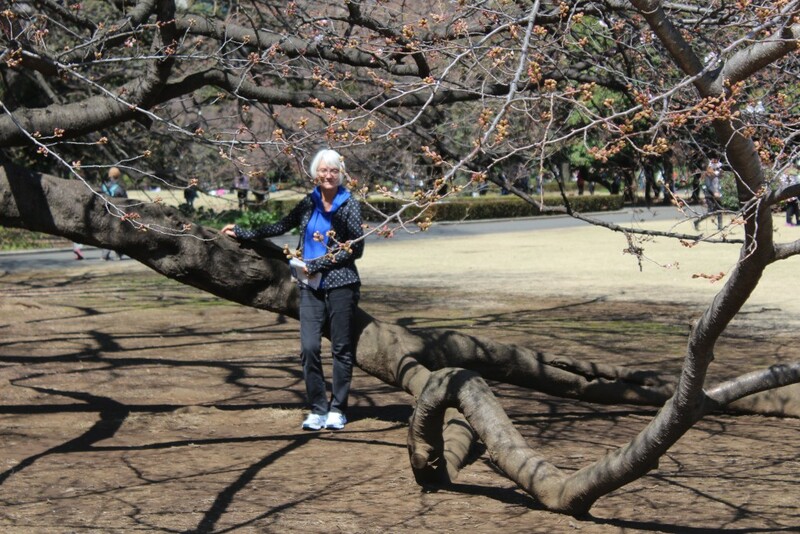 Janis with one of the branches that is touching the ground. 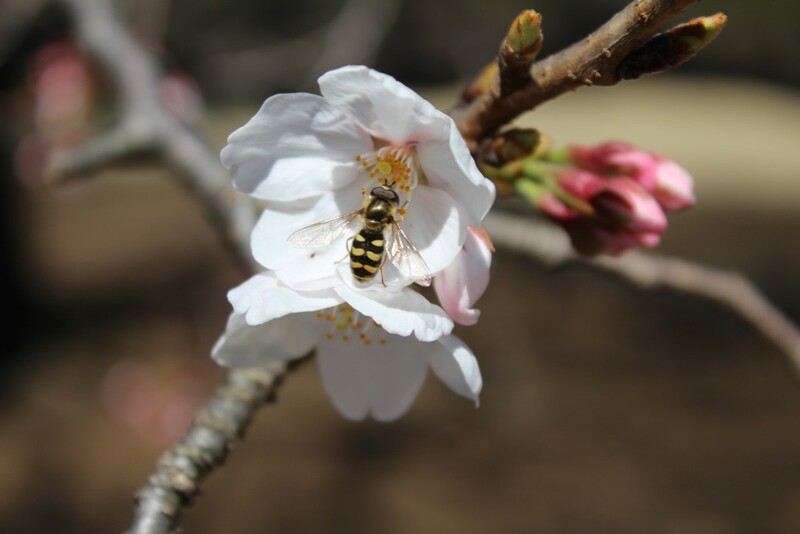 This tree was just starting to blossom and the bees were making an appearance. The Taiwan Pavillion in the Japanese Garden. You can see some koi in the pond. 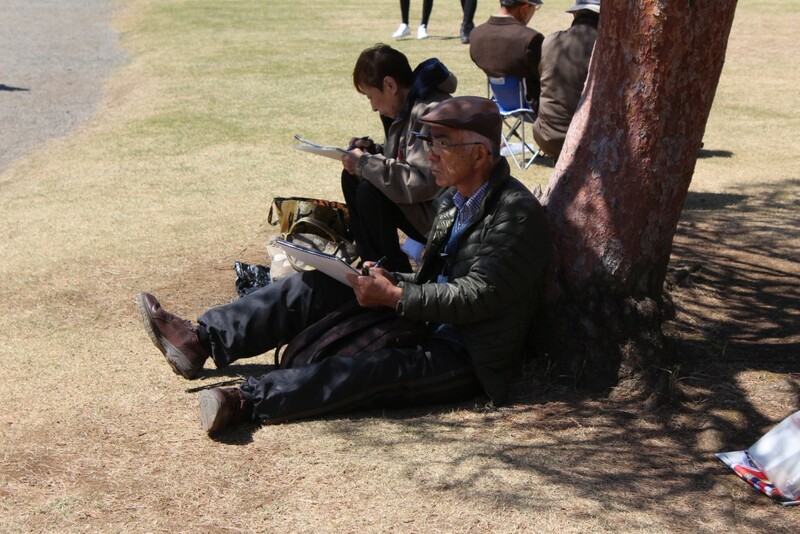 This artist pauses to contemplate as he draws the Taiwan Pavillion. 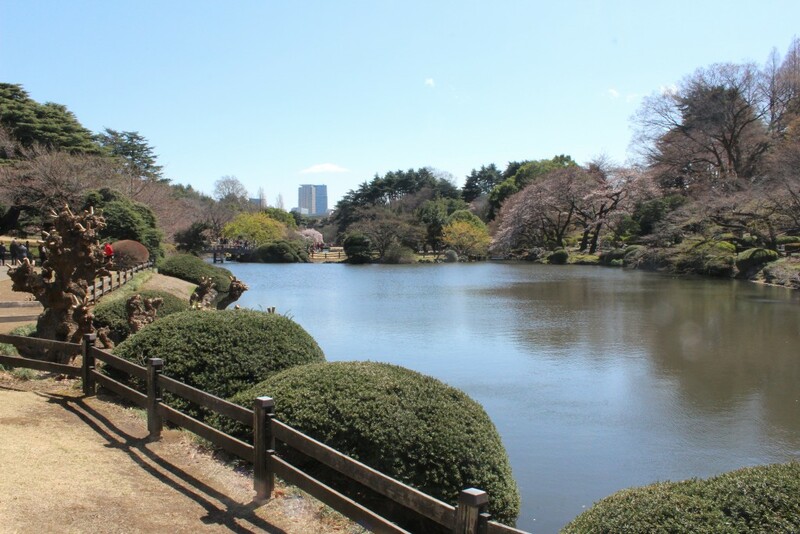 Part of the Japanese Garden with the city in the background. 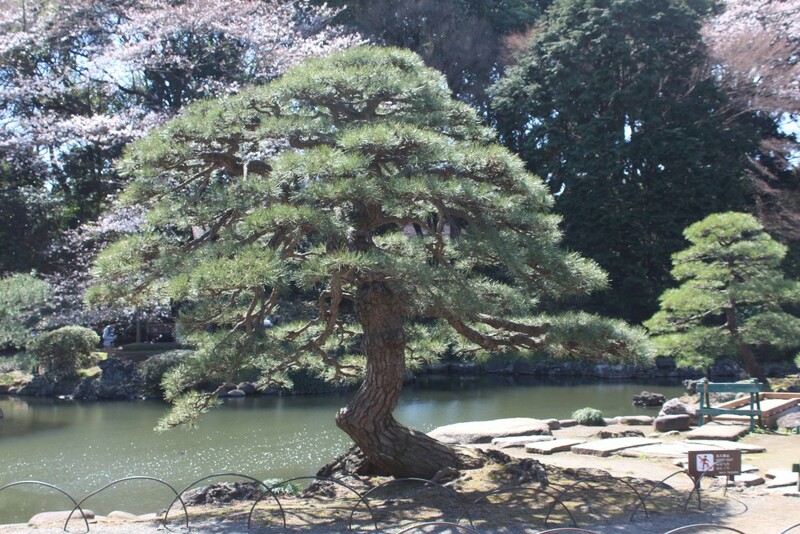 A sculpted pine tree in the Japanese Garden. This is the NTT Docomo Yoyogi Building, fourth tallest in Tokyo and the tallest if you include the communications mast on top. Branch hanging down to the waterline. This artist was painting in colour. Looks like he was finished, but a minute after I took the picture, he dipped his brush into some paint, added one brush stroke, then paused to think some more. City view over the French formal garden. The English Landscape Garden with city in background. 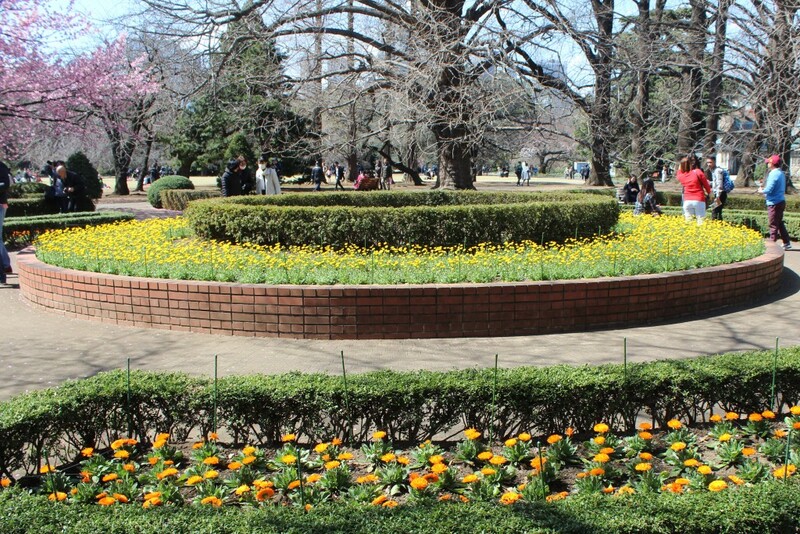 Chrysanthemums are also popular in the park. 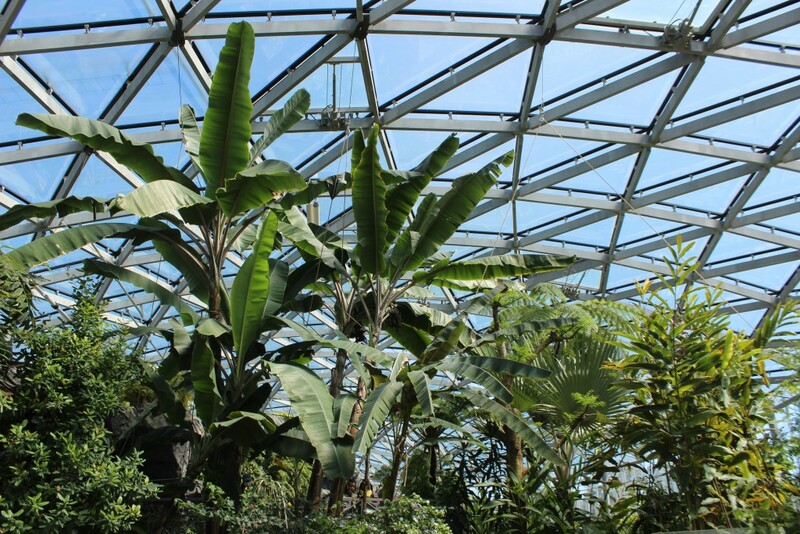 Large plants in the conservatory. 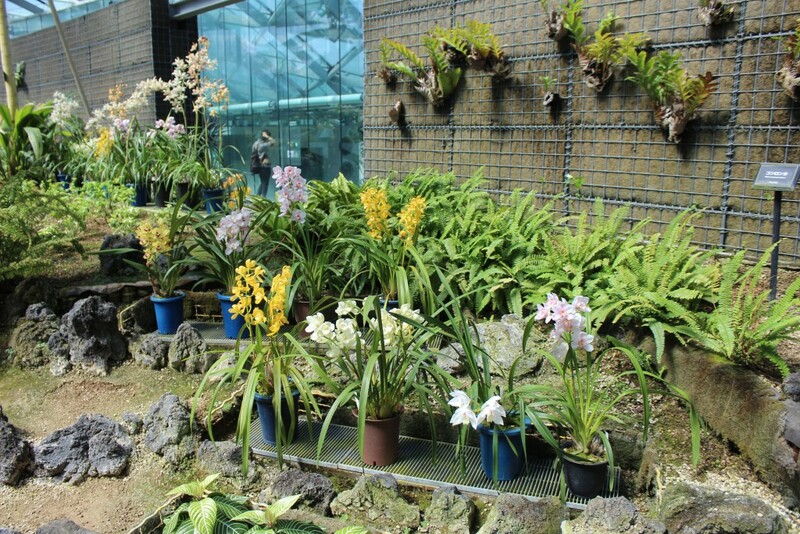 Some of the orchids on display. 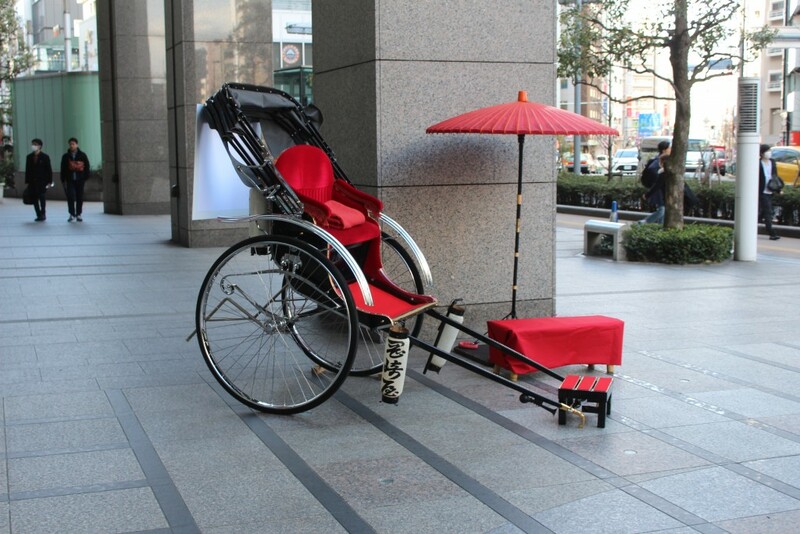 The rickshaw we could have had a free ride in. Unfortunately we ran out of time. 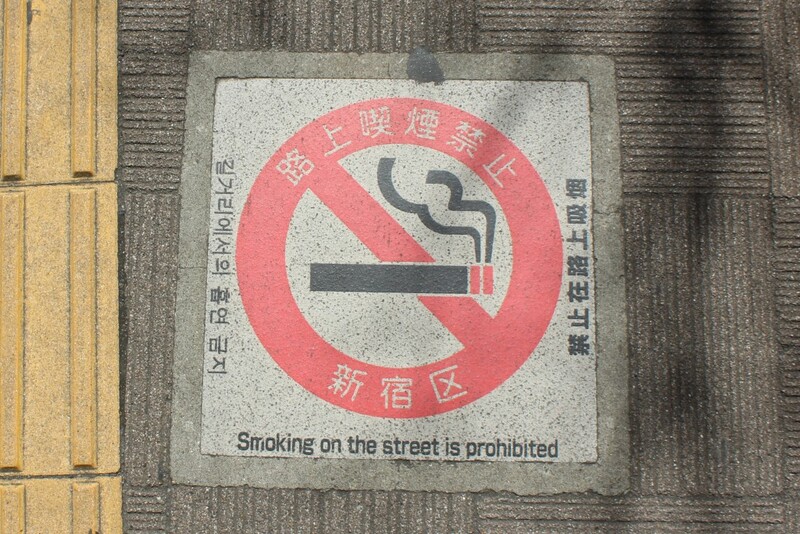 Oh, by the way, smoking is prohibited on city streets. This sign is embedded in the sidewalk at periodic intervals. View from the fourteenth floor of the Takashimaya store. Unfortunately the outside boardwalk was not open to the public. Traditional Japanese outfits are made to order here. 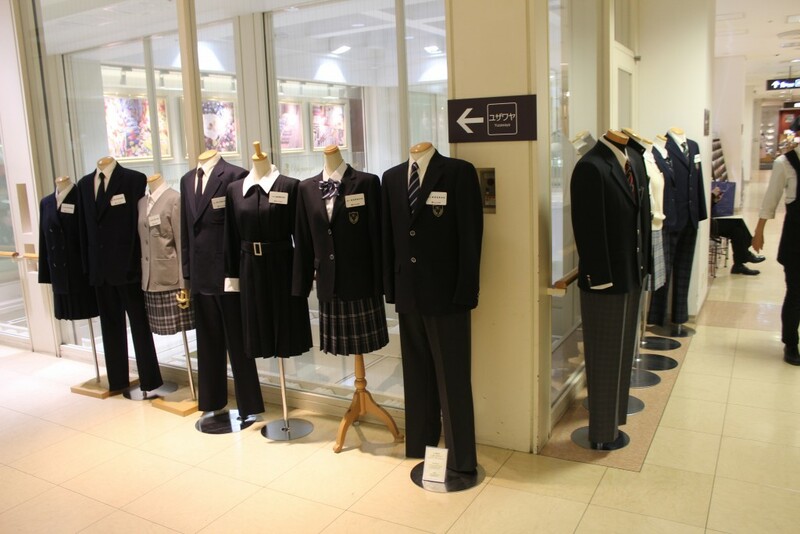 And there is a school uniform shop as well. 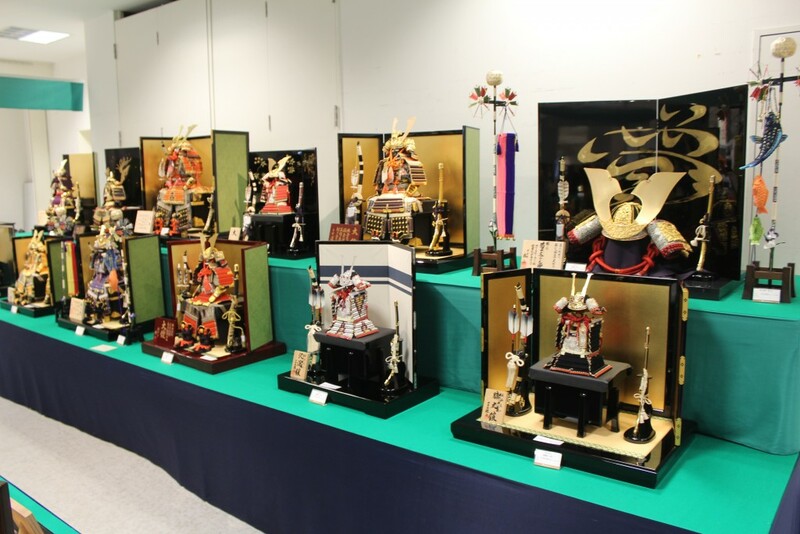 Some more samurai doll shrines on display. A helmet, a bow and arrow, and a kitana sword fill this shrine. And so it’s farewell to Tokyo until our next visit. 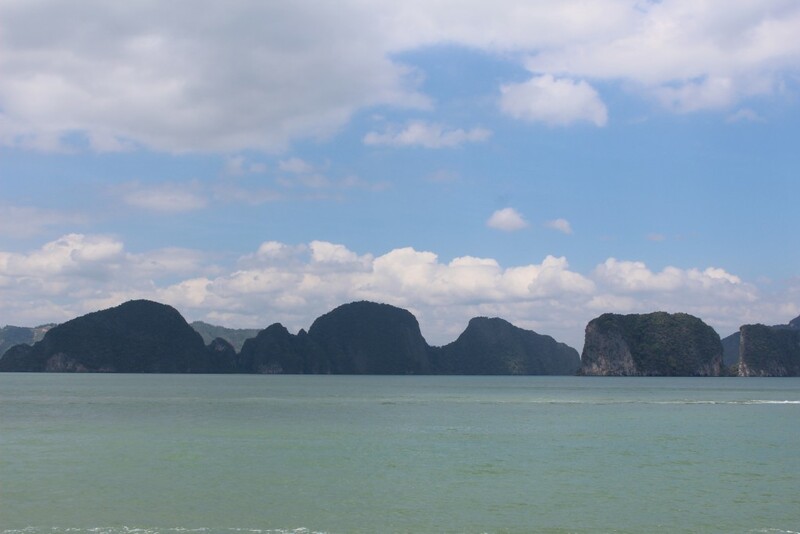 On January 22, 2016, my wife and I went on our sixth cruise – a cruise promoted as a taste of Southeast Asia. We had never been in Southeast Asia before, except for a brief stopover at the Kuala Lumpur airport on our way to Perth, Australia. 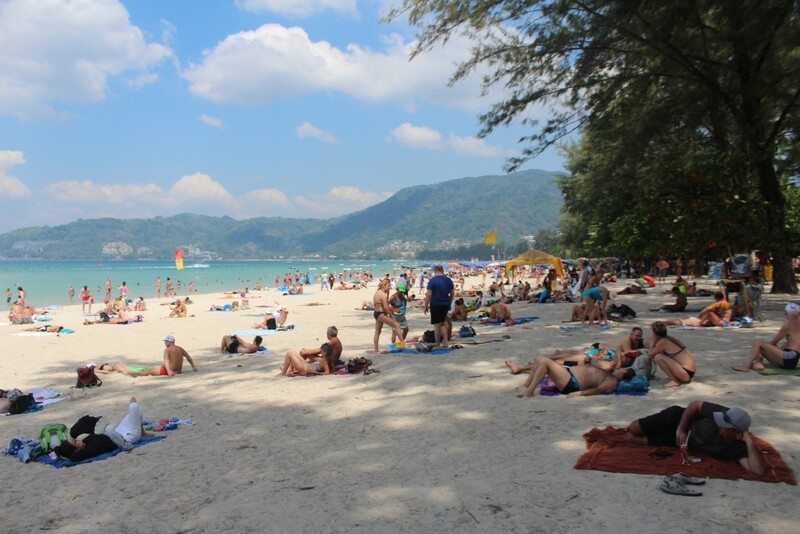 But it has always been a popular destination for Canadians with many visiting Thailand, Viet Nam, Singapore and Malaysia among others. So it was another part of the world that needed exploring. 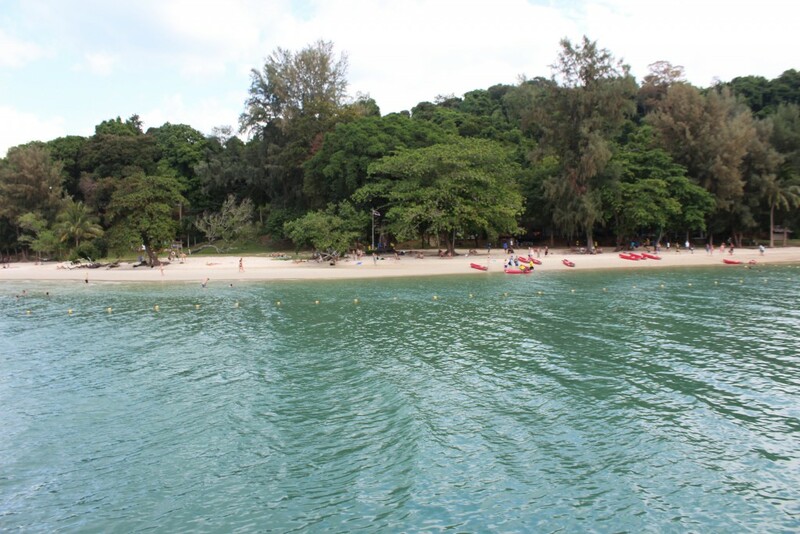 I’ve already posted about all our ports of call as well as about our stay in Singapore. So this post is about the cruise itself. Cruises are a destination in themselves, even if you never get off the ship. In 2009 we took a fourteen day trans-Atlantic cruise and were at sea for seven straight days, as long as this entire cruise. There is always something to do and to keep you entertained. 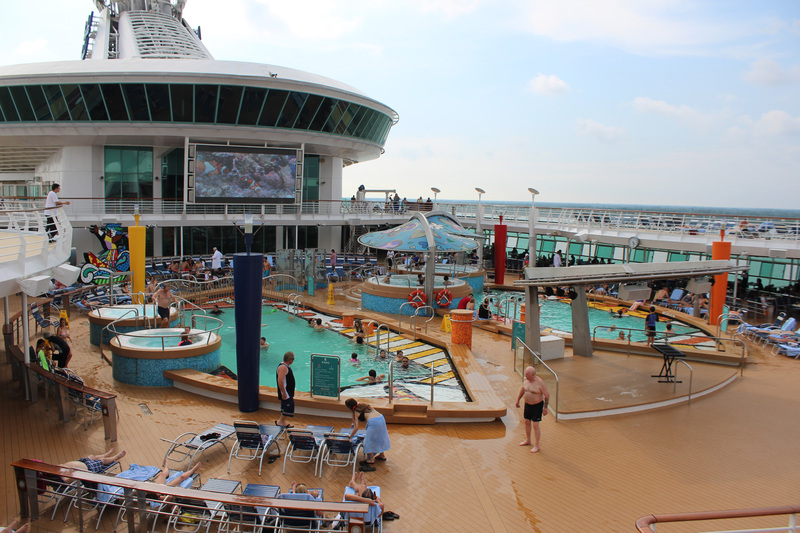 This cruise was with Royal Caribbean aboard the Mariner of the Seas, a huge ship, one of five Voyager class ships. 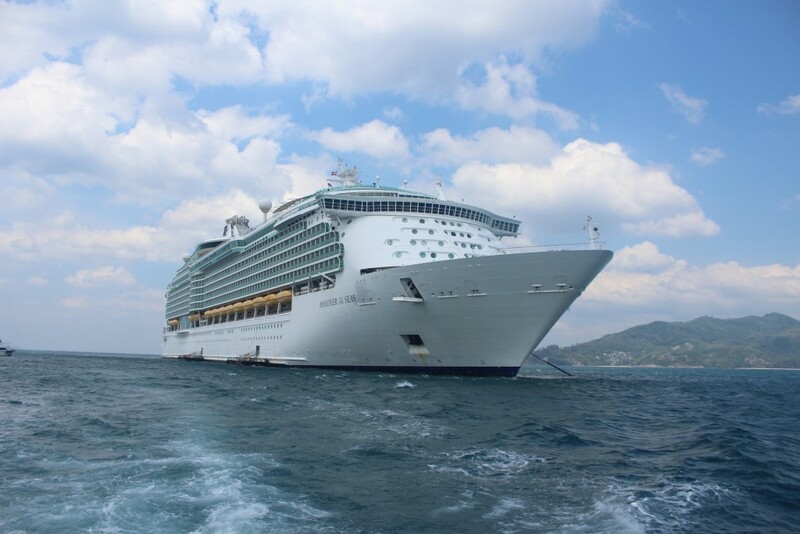 We have cruised on its sister ship, the Navigator of the Seas twice before. But each has its own distinctive style with unique art work for each. 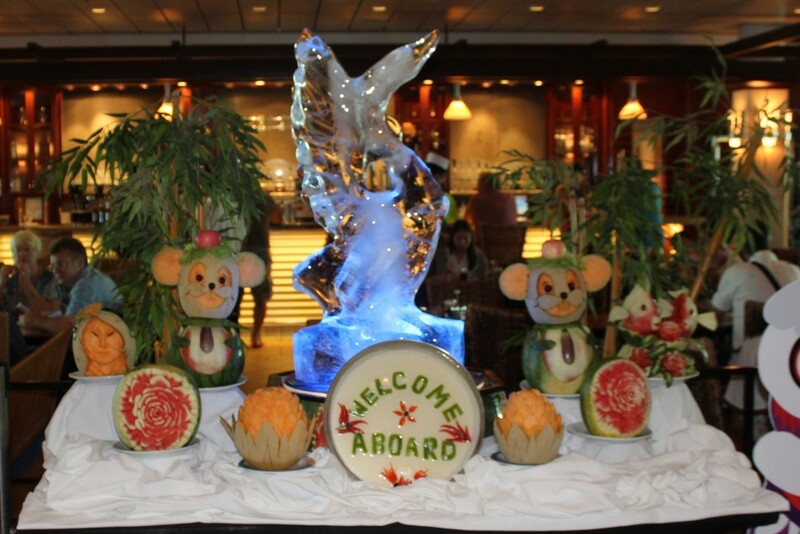 Sculpted fruit and ice are traditional on first days to welcome guests aboard. We had pre-boarded online so everything went smoothly when we arrived to board. Right away we went for a meal and everything was decked out to welcome people, and to hail the upcoming Chinese New Year. 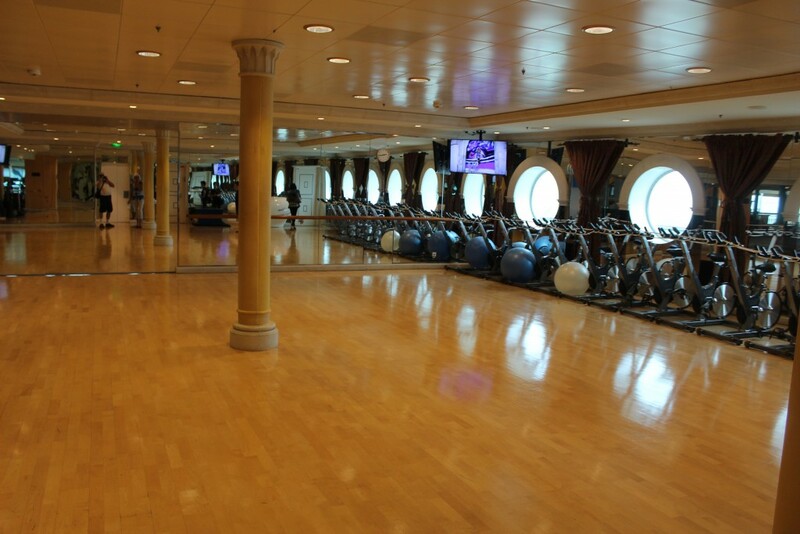 The gymnasium on the Mariner of the Seas. The time between boarding and setting sail is a great time to explore the ship and find out where everything is. It’s also a great time to check out the many facilities which are all open for inspection. We checked out the health and beauty salons where you can get your hair done or have a massage or work out in the extensive gym. 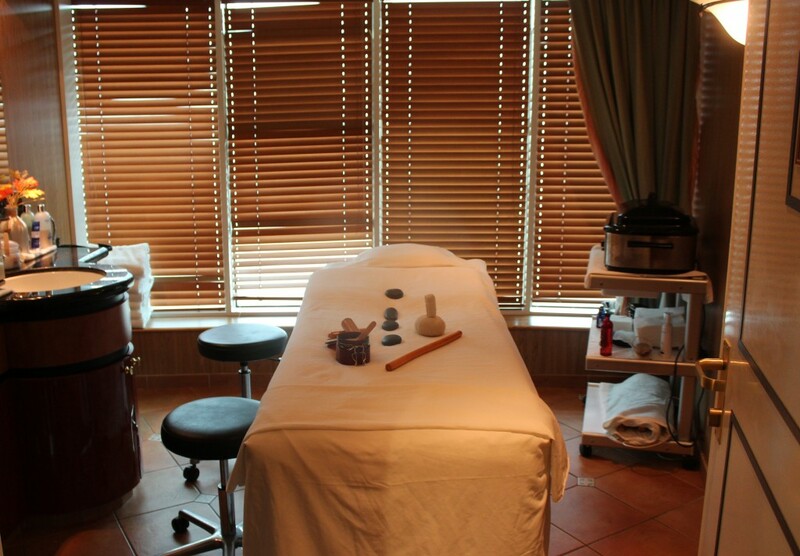 We entered a draw to win a spa treatment. At the draw my wife won a $100 coupon towards a treatment and she used it later to get a stone massage. You can get a stone massage on the ship. 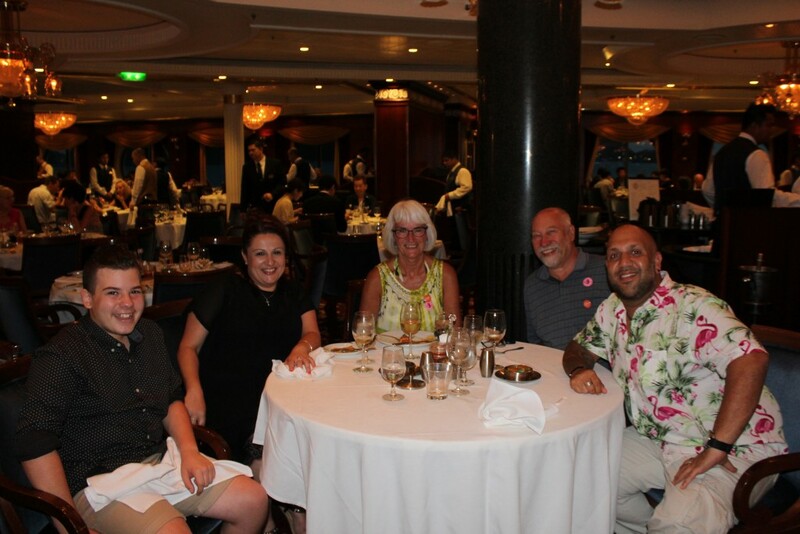 We also confirmed our dinner reservations and at 5:30 went for dinner where we met our dining companions for the trip, a couple from Melbourne and their 13 year old son. We also met our wait staff. Our dinner companions, Ned, Annie and Josh, were always fun to talk to and we spent an evening together at the karaoke bar as well. 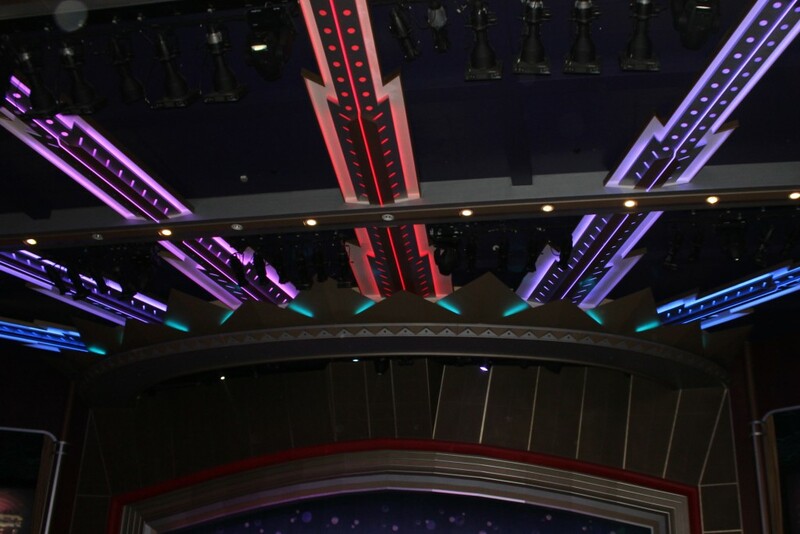 As with all cruises, there is entertainment every night in the theatre. The MC is usually the Cruise Director for the trip. Ours was a fellow from mainland China who went by the name of Fang. He started by introducing some interesting facts and figures about the makeup of guests and crew. There were guests from 53 different countries and crew from 43. 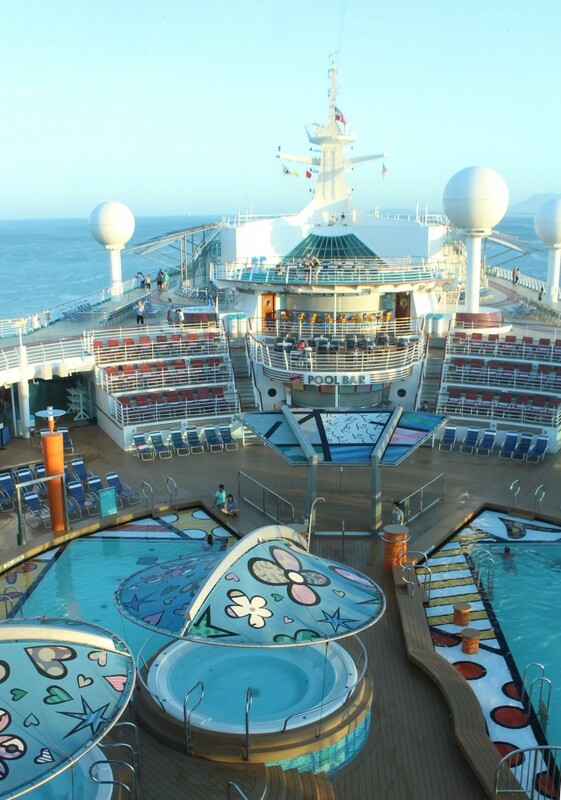 Looking down at some of the swimming pools and hot tubs on the ship. He started by saying, “There is one guest from each of the following countries…” and listed them by name – around twenty or so. Then he went on to list the countries which had two guests aboard. And then three and so on. The top five were Singapore and the United States with about 200 guests from each, Great Britain with around 500, China with about 500 and Australia with over a thousand people. Total was around 3300. The number of guests and crew from mainland China is a good indication of how much China has changed since the rigid days of Maoism. Nobody could leave the country then. It was a veritable prison. And those caught flirting with capitalism could be shot. But here were 500 guests from China enjoying the good life. 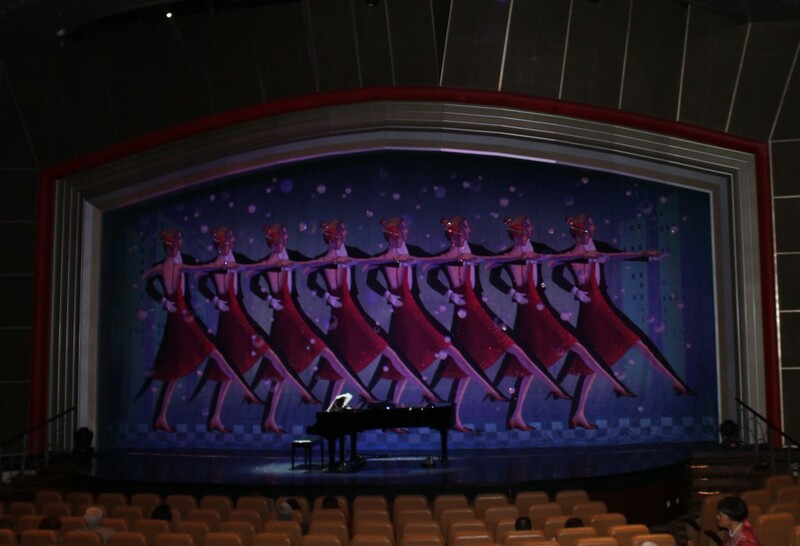 Many cruise ships have large theatres and provide nightly shows. The entertainment on this trip was below par compared to the other Royal Caribbean cruises we have been on. One of the downsides was the the usual complement of staff singers and dancers boarded the same time as us and so did not make an appearance until the last day after they had done extensive rehearsing. But the nightly talent was lack lustre as well. We enjoyed some of it, but it lacked flare. There were light flares going out from the top of the stage that made it look like the crown worn by the Statue of Liberty. The first night featured an Australian male trio called La Forza. They were pretty good – sort of like the Three Tenors but they did more pop than classical music. The second night featured violinist Venus Tsai who was a finalist in China’s Got Talent. We weren’t particularly interested but popped in at the back of the audience for a few minutes part way through to check her out. She was very talented, but the audio mix was terrible. She was drowned out by the ship’s orchestra. But people who went enjoyed her very much. The third night had Australian comedy magician Duck Cameron. I’m a huge fan of magic and looked forward to the show, but we were both disappointed. The magic was ordinary, nothing we hadn’t seen before. And the comedy was lame. The fourth night featured Australian singer Tamara Guo. She had a good voice but her presentation was horrible. She said she was suffering from a sore throat and was constantly apologizing for it. And she spent more than half of the act telling her life story instead of singing. People were walking out of the show in droves. 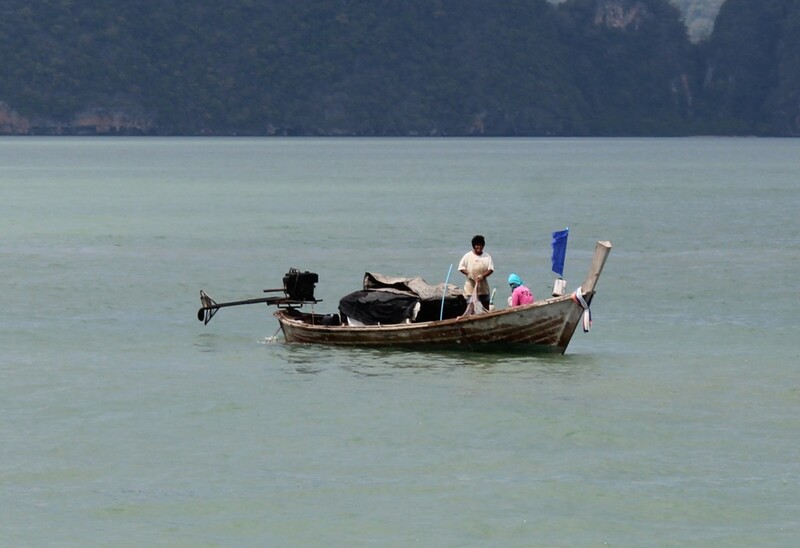 I didn’t save the calendars for days 5 and 6, but I believe there was no show on the fifth because we were in Phuket for two days so people could seek entertainment ashore if they wanted. Day six was an Australian comedian who was so-so. And day seven featured a production extravaganza with the ship’s singers and dancer called Center Stage. 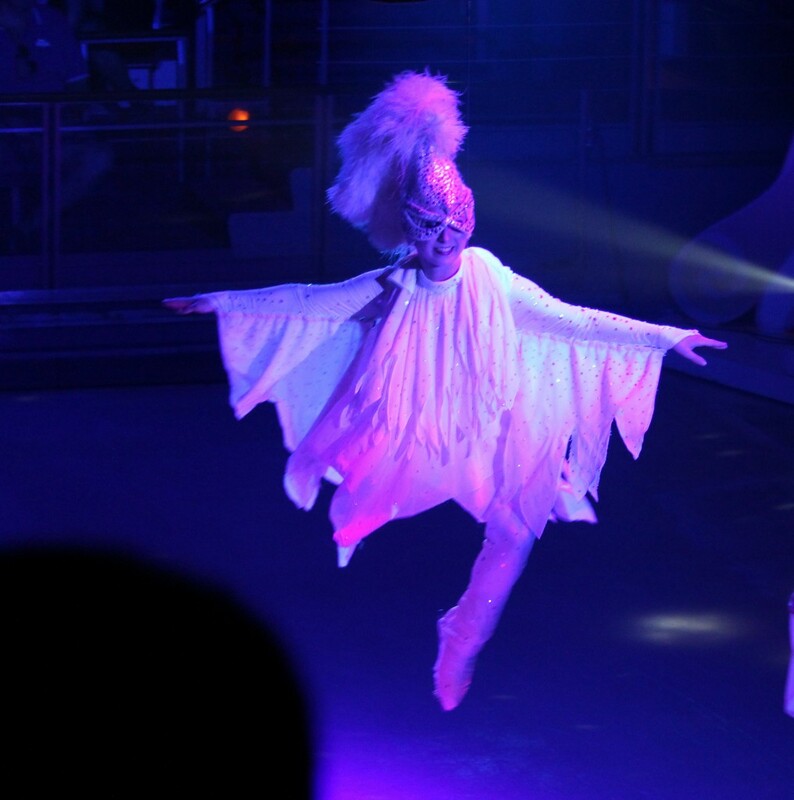 The Royal Caribbean cruises always have a very talented cast of singers and dancers and this show was no exception. An enjoyable evening. 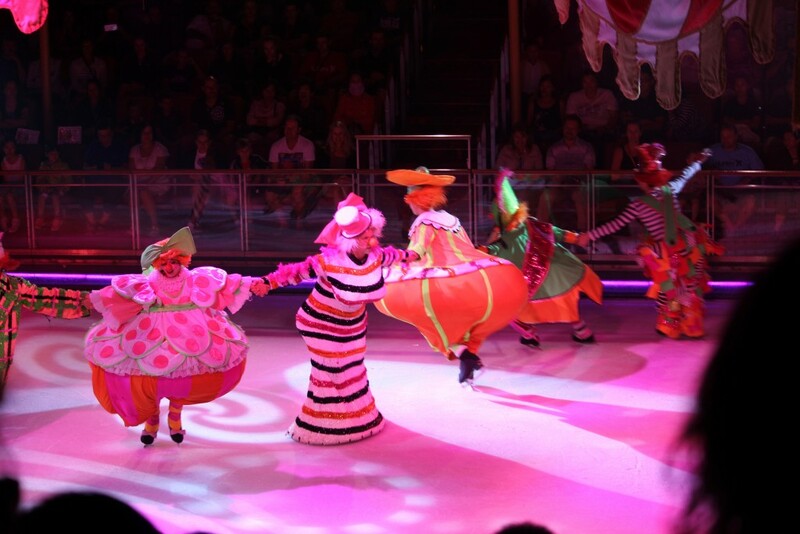 These clowns were among the entertainers in the ice show – Ice Under the Big Top. But I must put in a word for the very best show on the ship. The Mariner of the Seas, like her sister ships, has an ice rink. 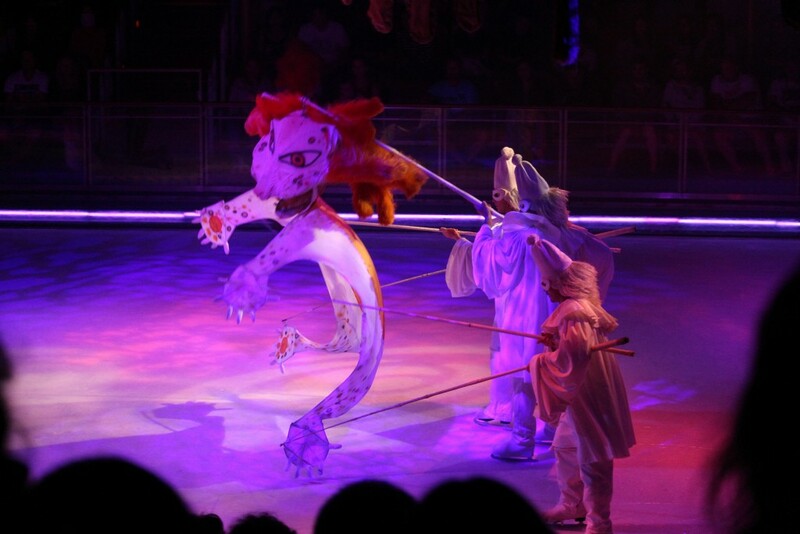 Guests could skate during designated hours, but there was also an ice show. There were several showings and we went on the afternoon of the last day. And it was fabulous. 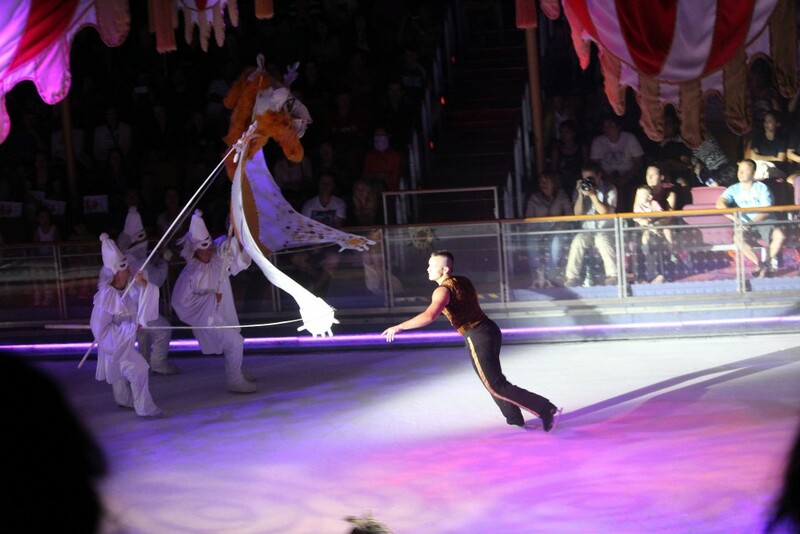 The show, called Big Top on Ice, had a circus theme. 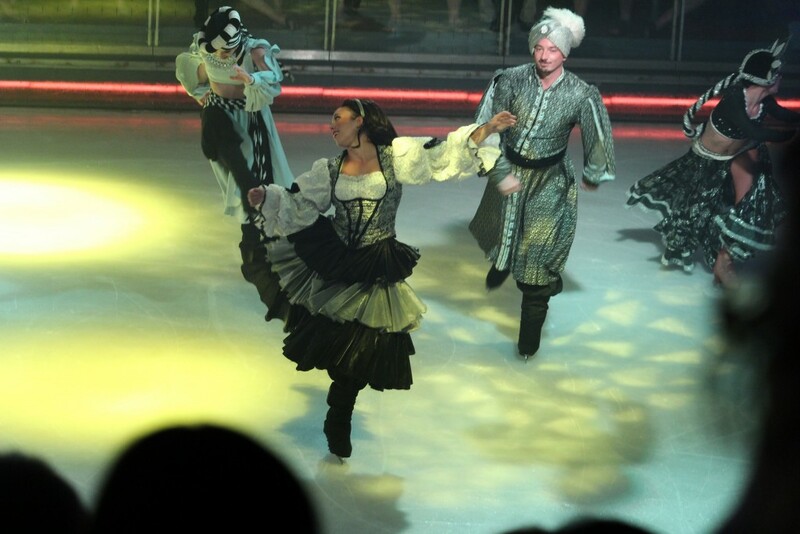 Brilliantly coloured costumes and fabulous skating. Some excellent skating in the ice show. It so happened that Australia Day happened during the cruise and with such a large contingent of Aussies aboard, the ship celebrated as well. 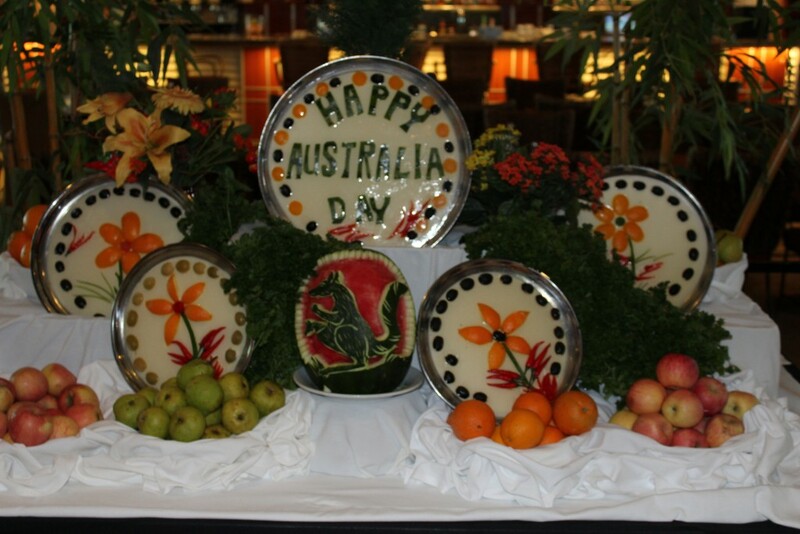 Fruit and decorations for Australia Day! On the last day we also took advantage of an opportunity to tour the ship’s galley for a nominal charge. 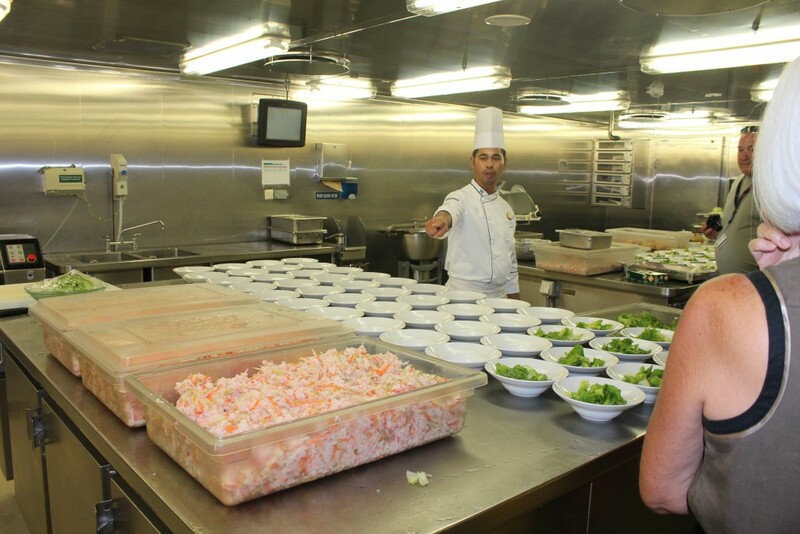 This tour included a complementary Royal Caribbean Recipe Book and a champagne lunch. The book alone was worth the money. 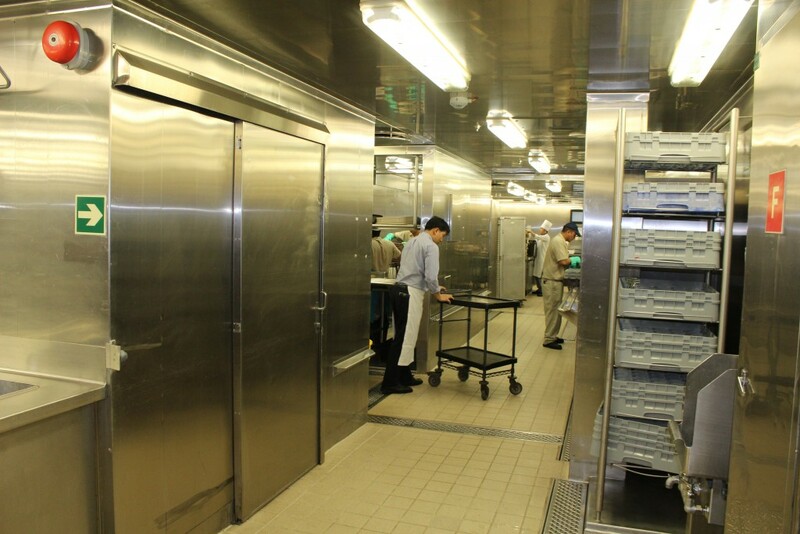 And the behind-the-scenes look at the galley was very interesting. 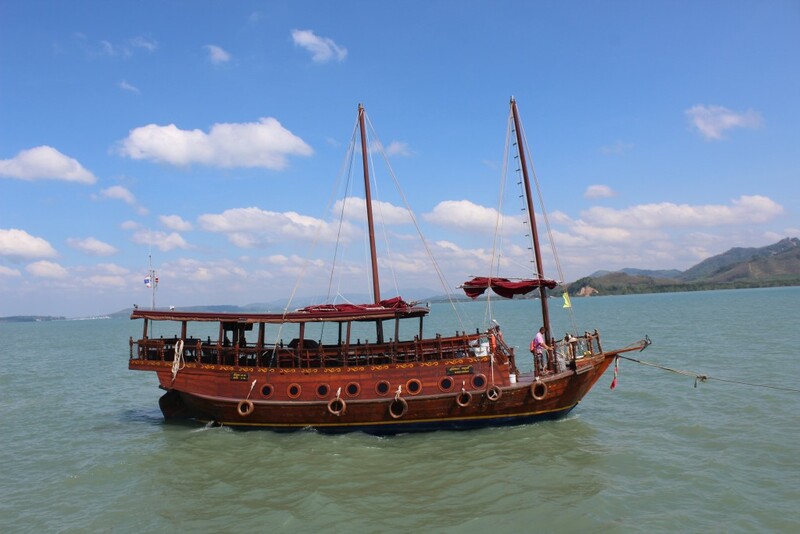 They churn out a lot of meals with three decks of fine dining restaurant as well as an almost constantly open serve yourself buffet style restaurant, the Windjammer. One of the chefs preparing chickens for dinner. Of course, there were a lot of amenities we did not take advantage of – basketball courts, miniature golf, rock climbing and so on. But we did use the swimming pools a lot. 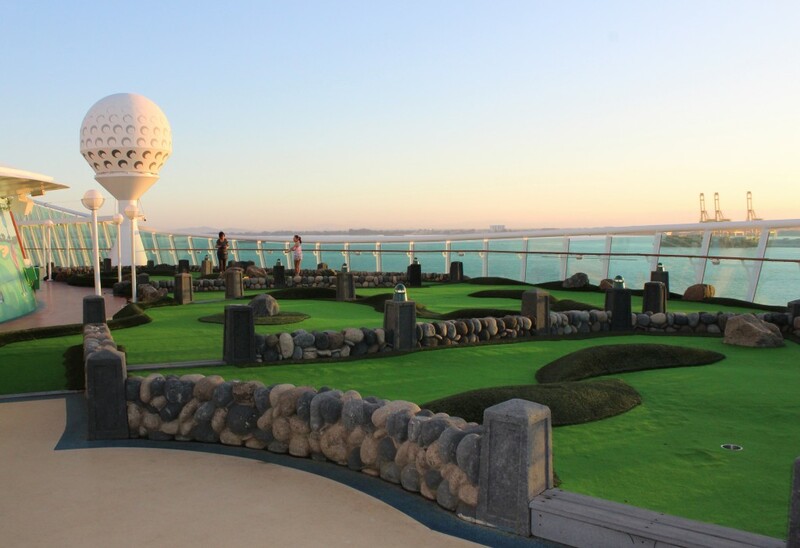 Miniature golf was one of many amenities on the Mariner of the Seas. One of the great pleasure of each Royal Caribbean cruise is the singing waiters and chefs. 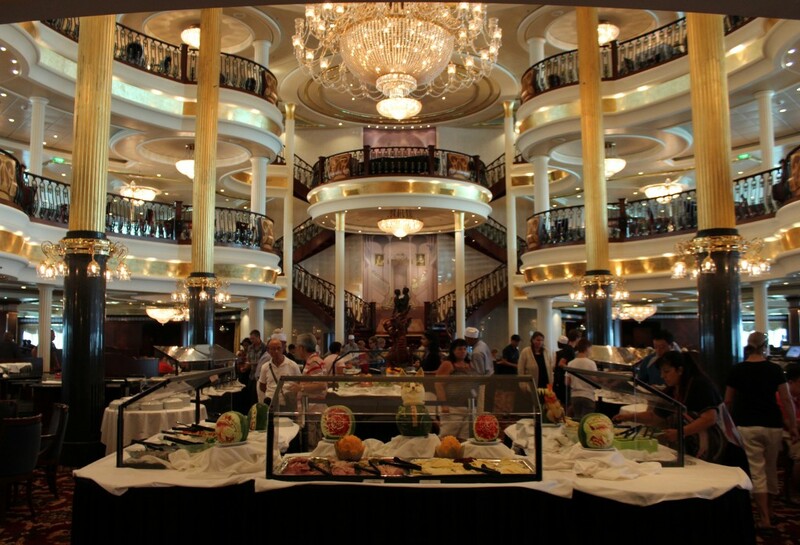 Once and sometimes twice on a cruise, the wait staff will march around the room waving white towels as they congregate on the staircase. Then the head of the dining department gives a little speech praising their work and they then sing for their guests. 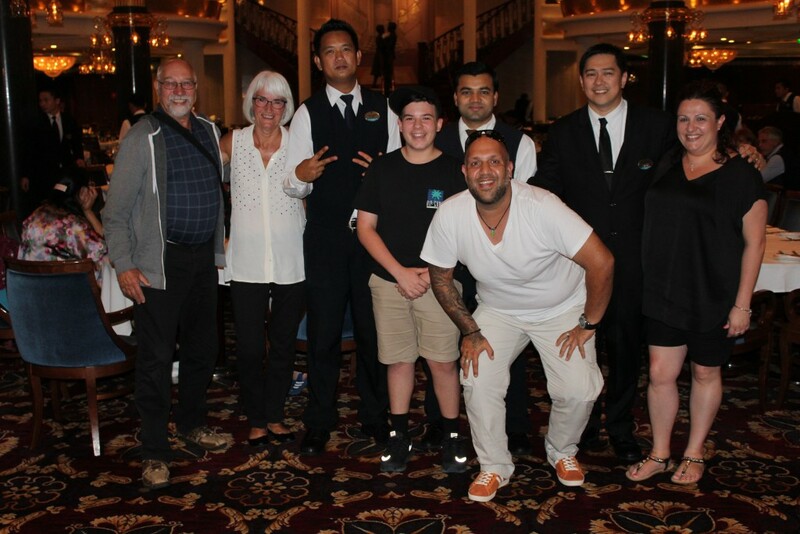 We had our wait staff entertain us twice this cruise and it was great fun. I’ve written about our ports of call already but here are links to my blog posts on each in case you missed them. Note that some have links at the end of the articles to additional photo galleries. All in all, this was a interesting and exciting cruise. Not the best cruise we have been on, but memorable all the same. 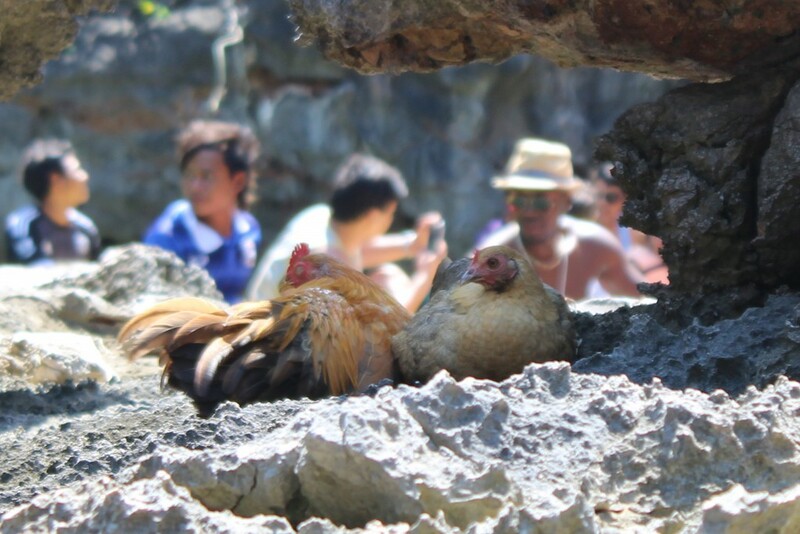 Additional photos from our Southeast Asia cruise. 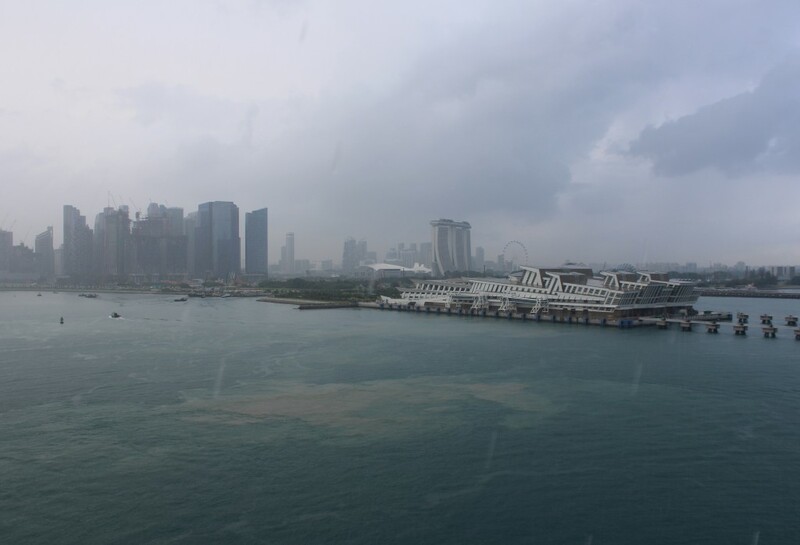 It was rainy when we left Singapore, the first time we had rain on the first day of a cruise. 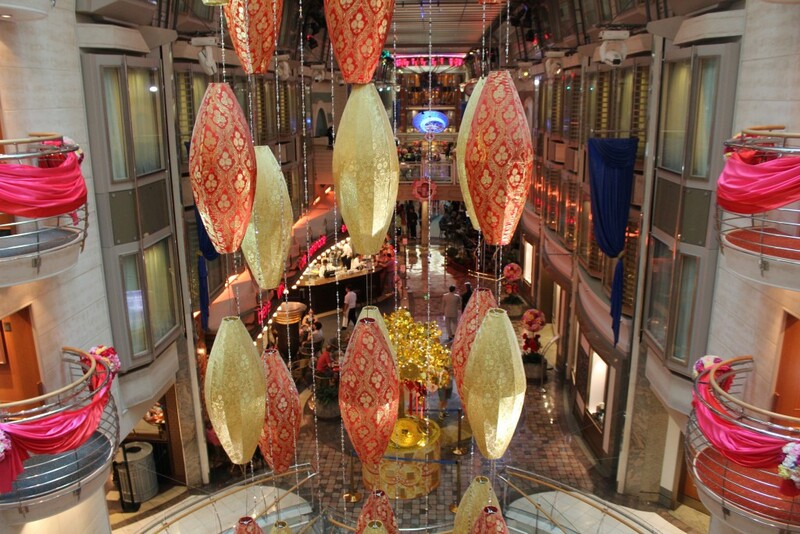 The ship was decked out for Chinese New Year which was coming up soon. 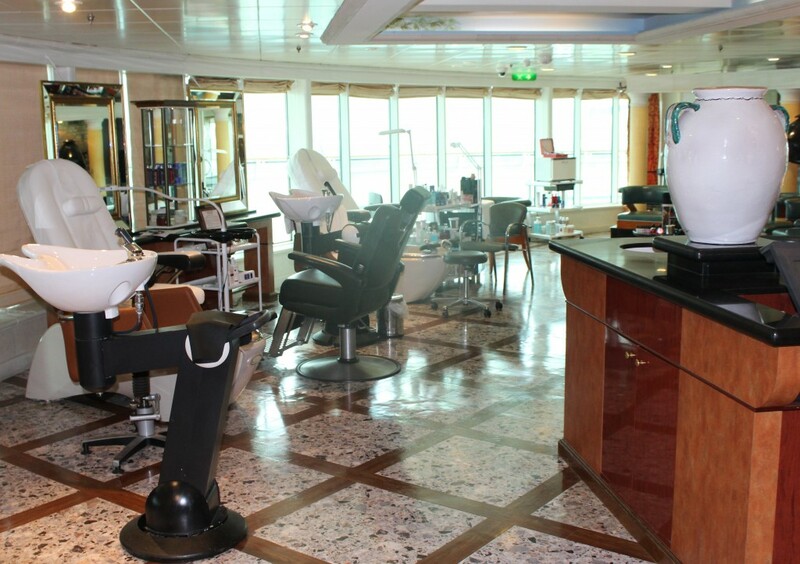 The Mariner of the Seas has a full service hair salon as well as many other amenities. 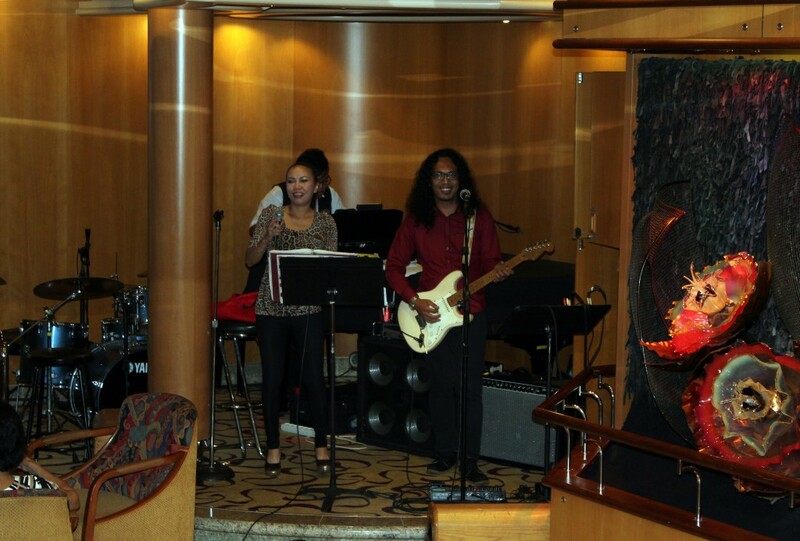 Many of the bars on the ship featured live entertainment. 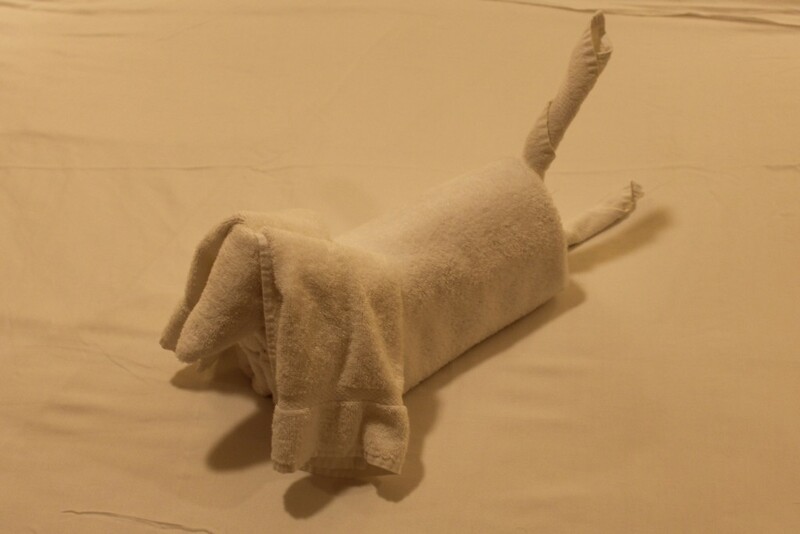 Every day we would find a new towel animal on the bed. 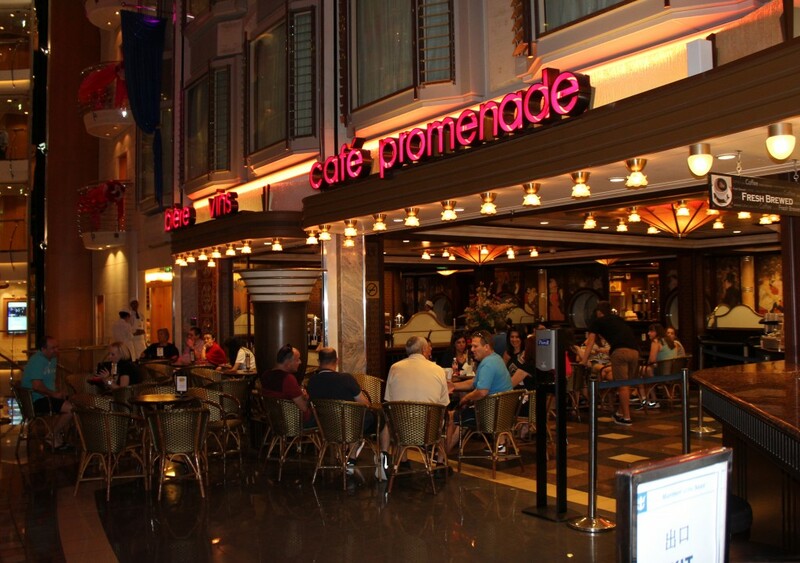 The Cafe Promenade along the promenade. Our dining table – left to right: Josh, Annie, Janis, myself and Ned. 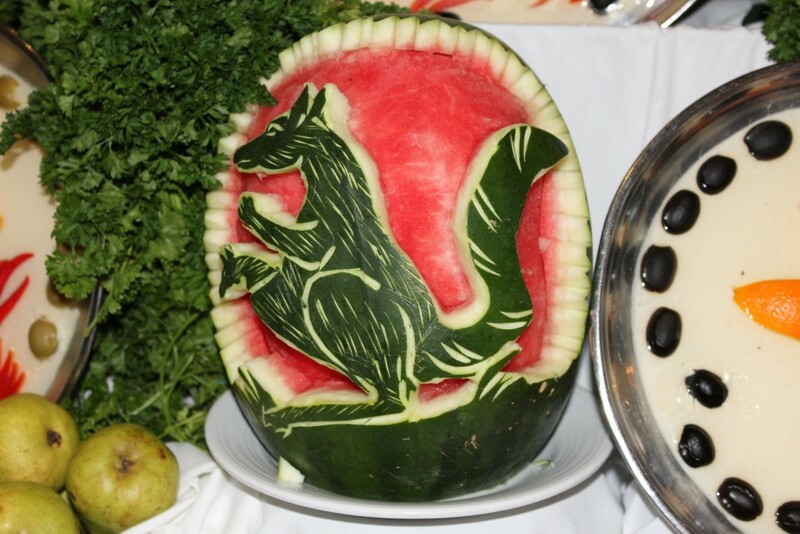 A carved melon for Australia Day. 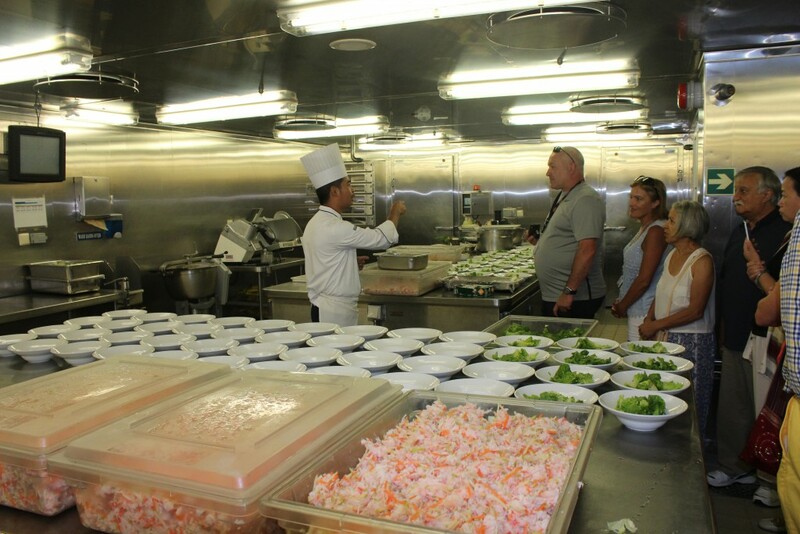 The ship’s galley prepares several thousand meals daily. A chef explains what he does. Bowls of salads being prepared and a lot of shrimp! Almost everyone aboard has more than one job. Our waiter also helped out in the kitchen. The dining room covers three floors. 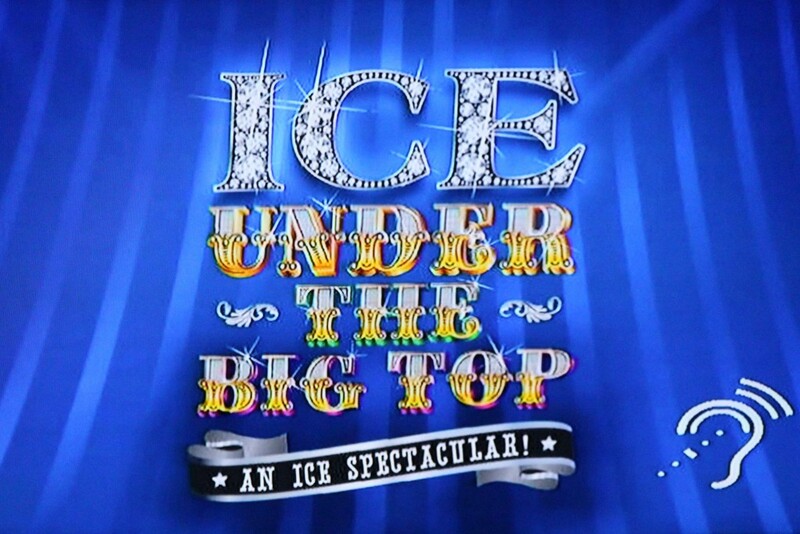 Ice Under the Big Top – a fabulous show. The best one of the cruise. 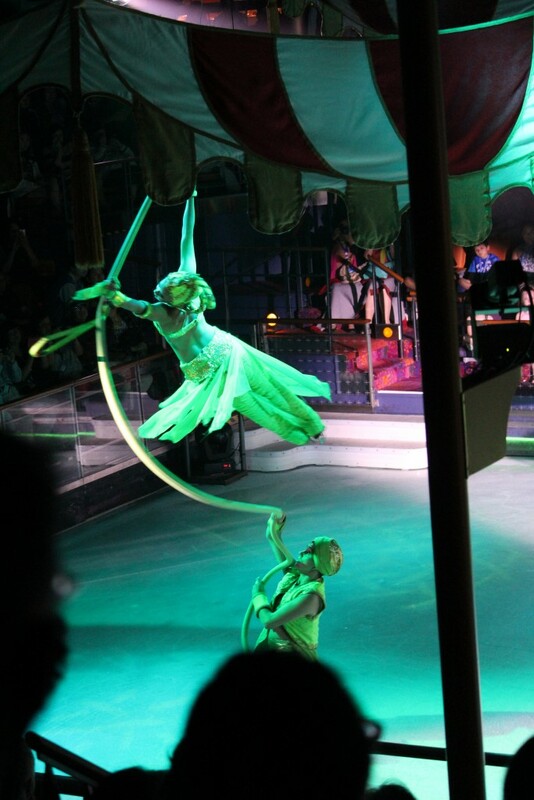 The ice show had a circus theme. Kept at bay by the lion tamer! 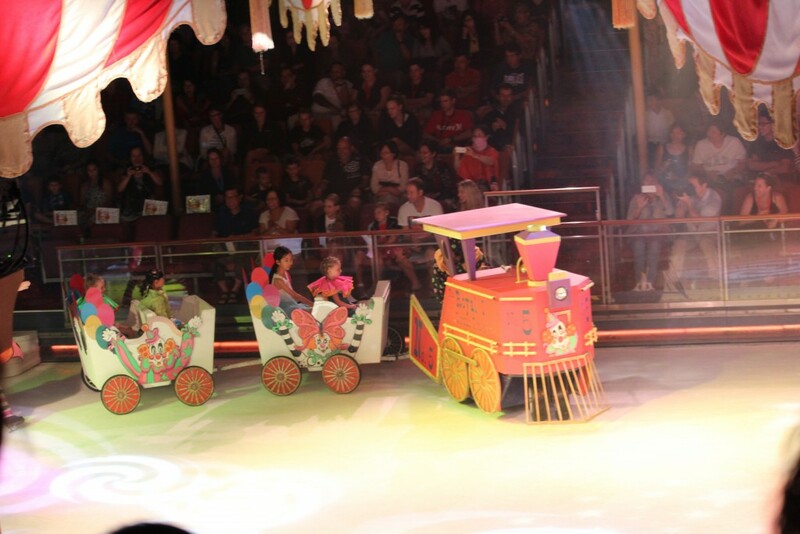 Some kids from the audience were given a ride in a choo choo train. Twirling a skater on a rope. All in all, a lively and vibrant show. The other day at family dinner we were talking about the upcoming visit of my wife’s sister and brother and his wife. 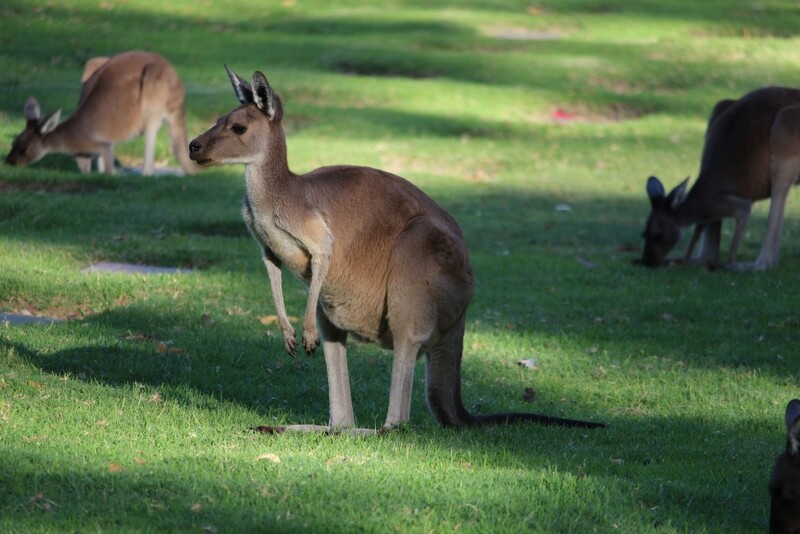 We were discussing all the places in Western Australia we planned to take them – Margaret River, Rottnest Island, Fremantle, and the Caversham Wildlife Park to see kangaroos. “Oh,” piped up Emma, “you can see a lot of kangaroos at the Pinnaroo Cemetery.” She went on to explain that the cemetery was in a park-like setting surrounded by wilderness and that it had beautiful paths for walking along and even had a cafe and small restaurant. Just drive around until you see some roos, park the car and take a look. 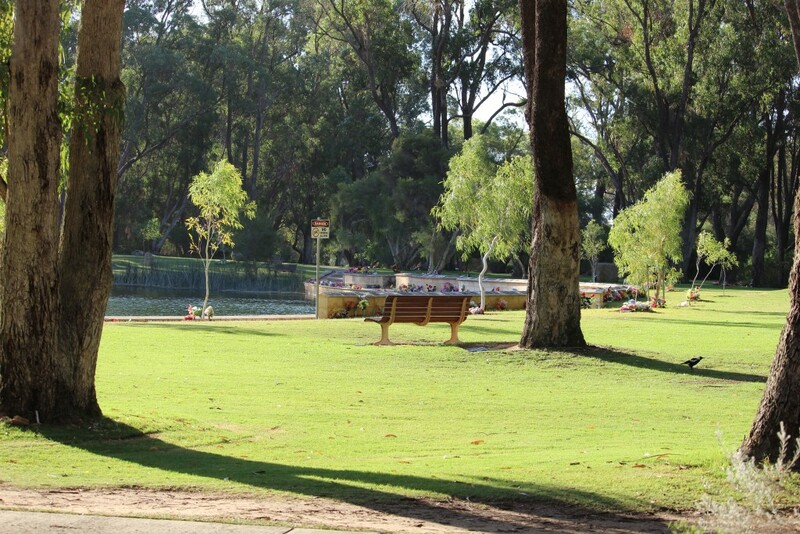 The Pinnaroo Valley Memorial Park is in a park like setting with many walking paths. So we thought we would check it out yesterday. She was absolutely correct. 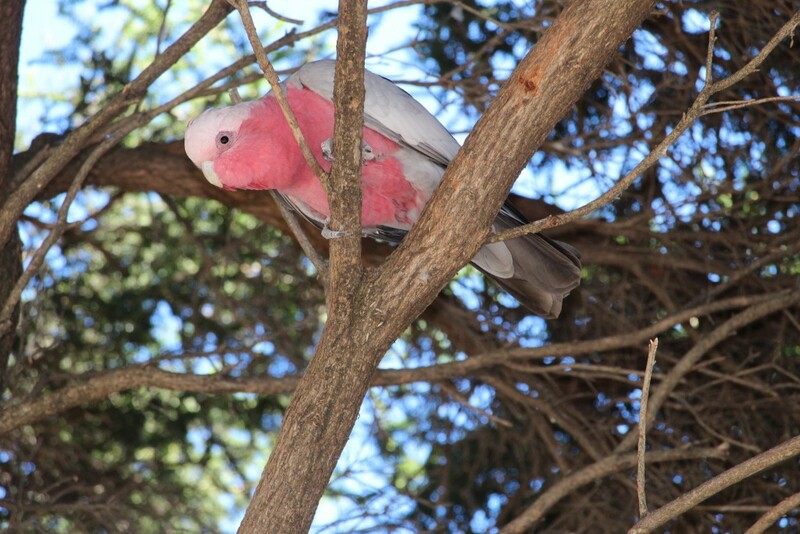 The Pinnaroo Valley Memorial Park is a beautiful park set in the midst of wilderness. It is very large. And yes, we saw a lot of kangaroos, at least fifty of them, probably closer to seventy-five or a hundred. 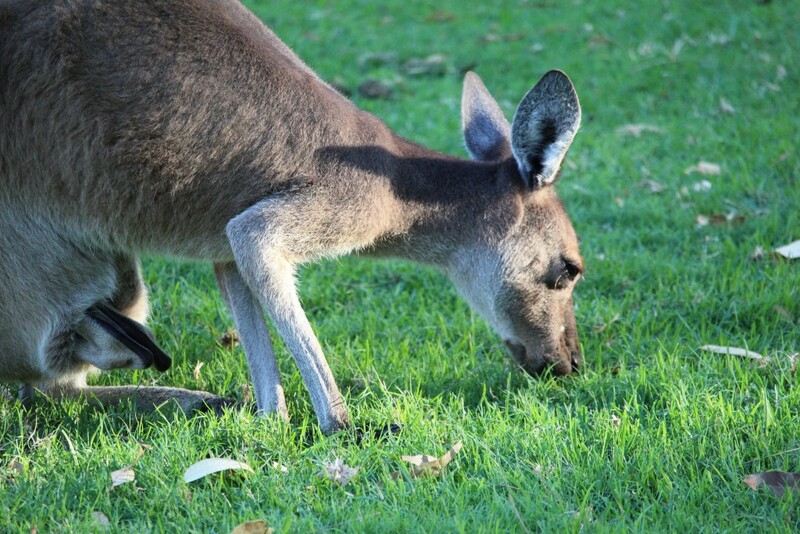 When a car goes by, the kangaroos often lift their heads up from their grazing and watch the cars go by. 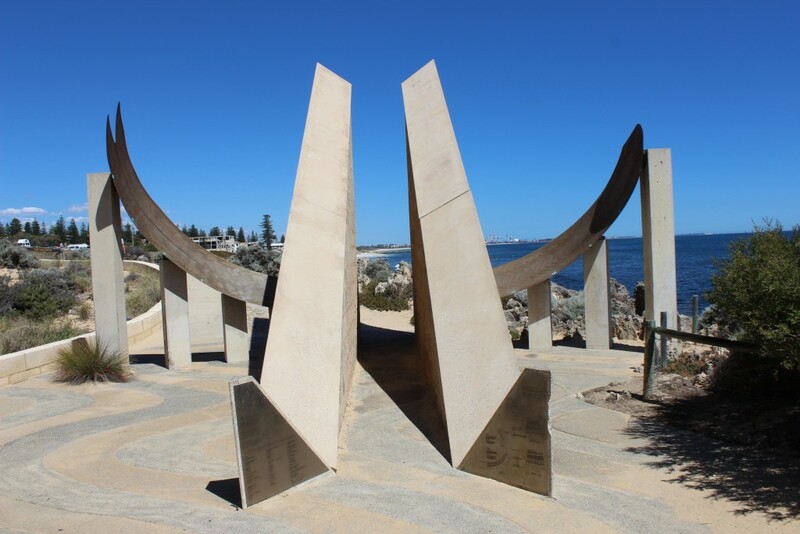 Pinnaroo Valley Memorial Park is located within easy travelling distance from downtown Perth. Just head north on the Mitchell Freeway (Highway # 2) and take the Whitfords exit. The cemetery comes up almost immediately on your left. It’s about a twenty minute drive from downtown. A large kangaroo on the move. We drove along the road until we saw three kangaroos, so we parked and got out of the car. We watched them for a bit and then they hopped off to the other end of the field they were in. We then headed over to a park-like area of the cemetery and walked along the shore of an artificial lake. The area was beautifully landscaped with long open grassy spaces, almost like the fairway of a golf course. Along the shore we saw many memorials, many festooned with flowers. We didn’t see any roos here though. But after a ten minute walk, we spotted some through the trees on our left. The path also turned in that direction so we followed it along and as we emerged through the trees to the other side we saw about three dozen kangaroos, all grazing among the cemetery plots. We saw about three dozen kangaroos in this location. While we enjoyed seeing the kangaroos at the Caversham Wildlife Reserve, these kangaroos were special. They were actual wild kangaroos. They looked different than the Caversham roos. The zoo roos looked rather lazy and dusty. Almost zoned out. Mind you, we were at Caversham during an earlier part of the day when roos are usually sleeping. 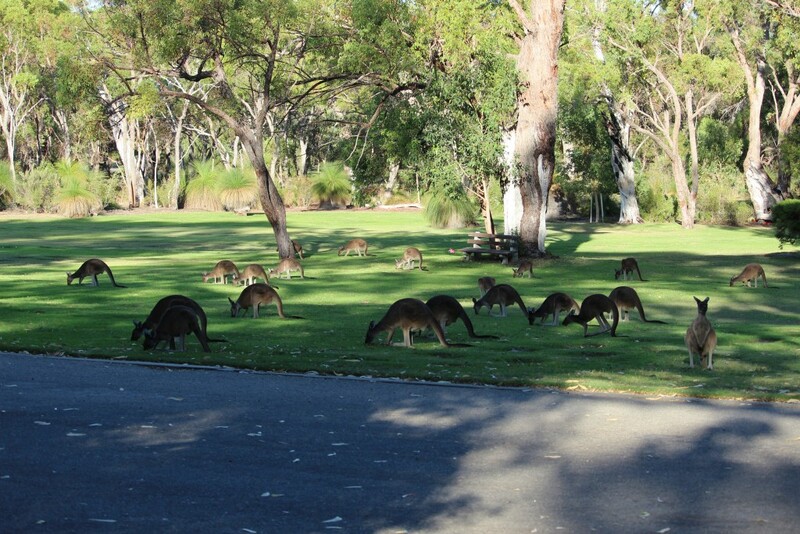 The wild roos emerge to feed after it starts to cool off around five in the afternoon. They are much more active, grazing and occasionally bounding along. I love watching them move. They have a certain grace to their movements. 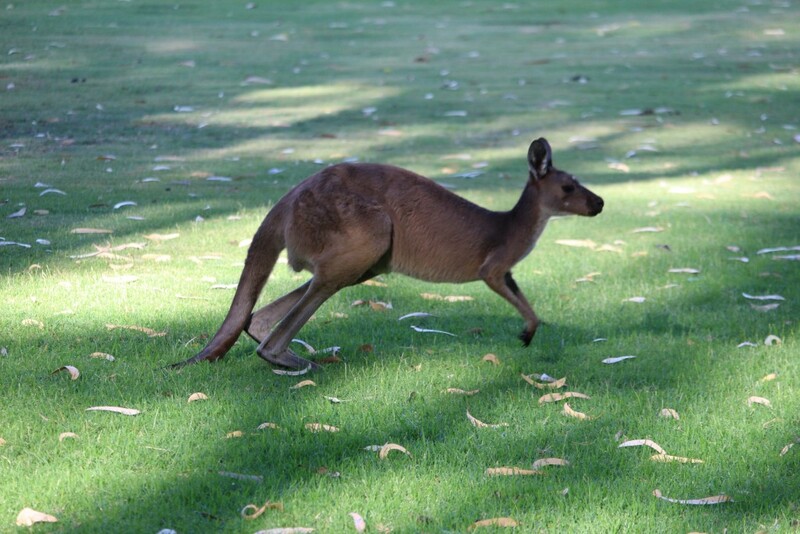 The wild roos also had a sleeker coat – darker and glossier. Healthier looking. A mama roo with a joey in her pouch. 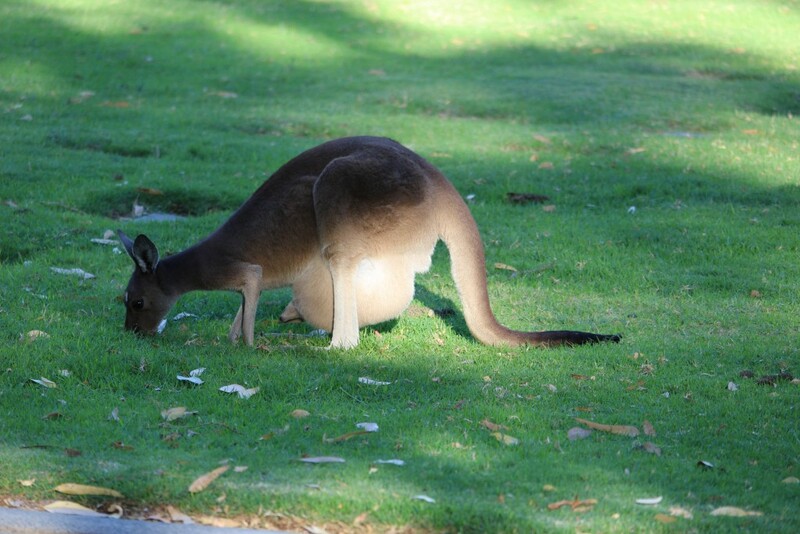 You can see the joey’s feet sticking out of the pouch. And driving through Pinnaroo Valley Memorial Park doesn’t cost you a dime. 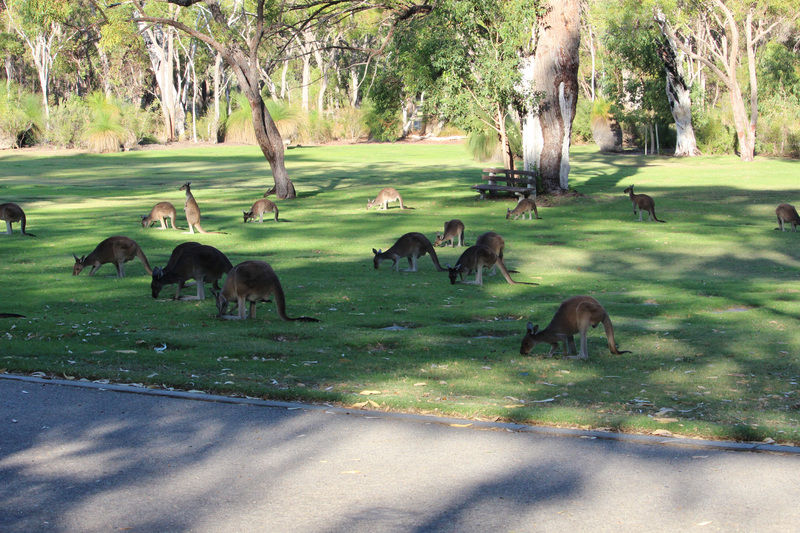 Although you get to see more than roos at Caversham – still worth a visit. But if it’s just roos you want to see, drive through the Pinnaroo park. After a half hour or so of watching the roos, we headed for Hillarys Boat Harbour which is a short drive away and had dinner at one of the fine restaurants there. Then a short walk along the pier to see the sunset. All in all, a great afternoon. In British Columbia they have had an annual sand castle competition for many years. It used to be held on the beach at White Rock, later moving to Harrison Hot Springs. But a couple of years ago it moved again, this time to Parksville on Vancouver Island. Contestants from all over the world attend, building sand sculptures which last for a few weeks before the weather takes them down. 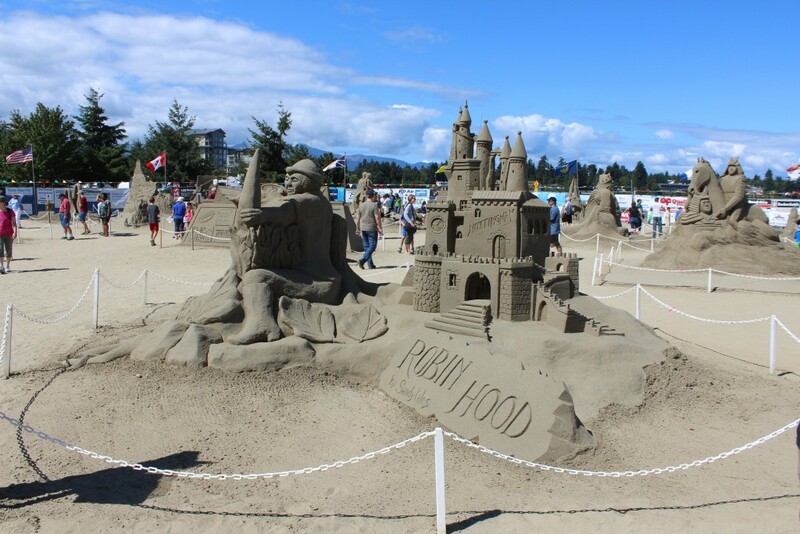 Heroes and Villains was the theme of last year’s International Sandcastle Competition at Parksville, British Columbia in July 2015. 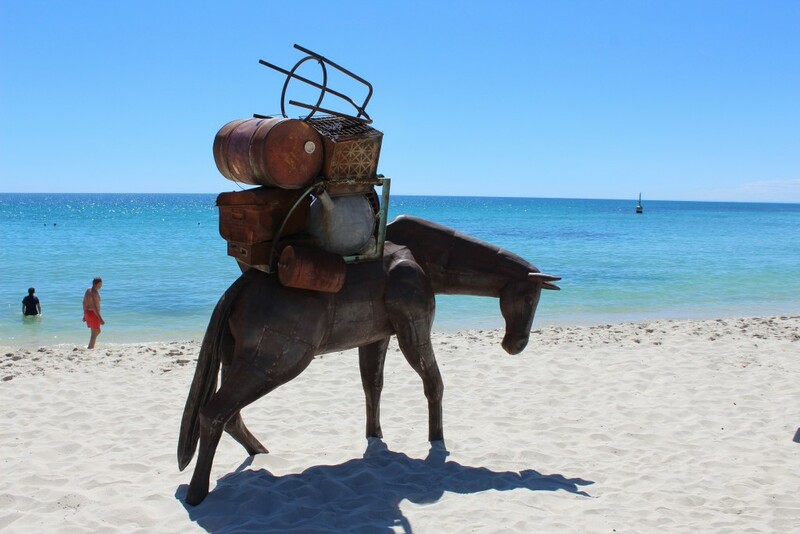 But Sculpture by the Sea in Cottesloe, Western Australia is another thing again. Not ephemeral sculptures made of sand, most of the sculptures here are permanent, though not in their permanent location. These works of art are made of wood, stone, steel and other durable materials. 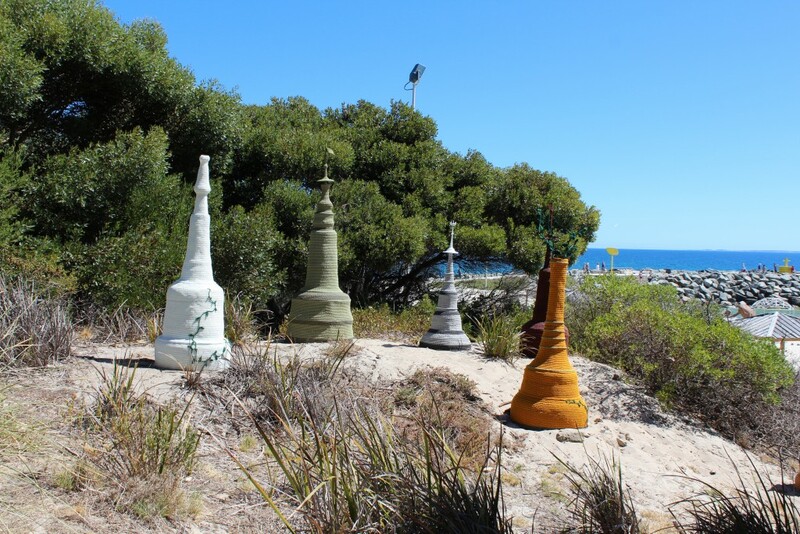 They are scattered along Cottesloe Beach, some on the sand, some on the grassy areas, and some in the gardens. 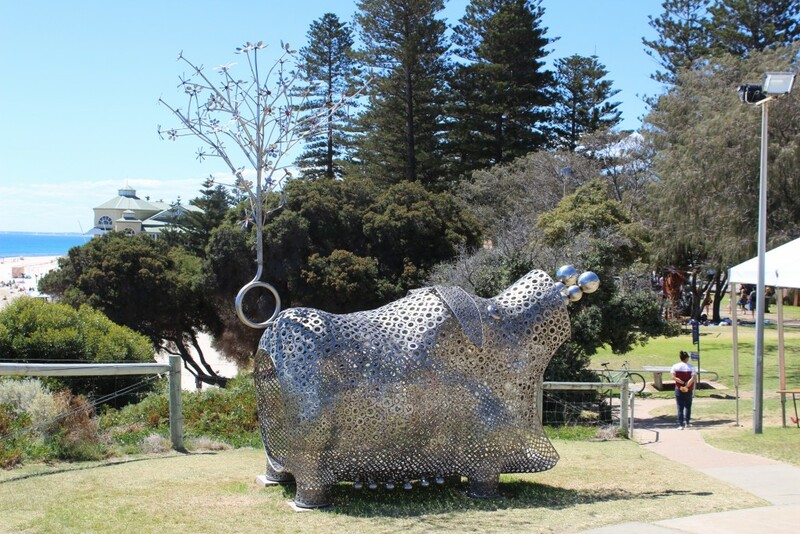 This giant stainless steel pig is one of over seventy sculptures at this year’s Sculpture by the Sea exhibit at Cottesloe Beach, Western Australia. Exhibit ends March 20th. This piece is called Pig of Fortune # 2 by South Korean artist Tae-Geun Yang. 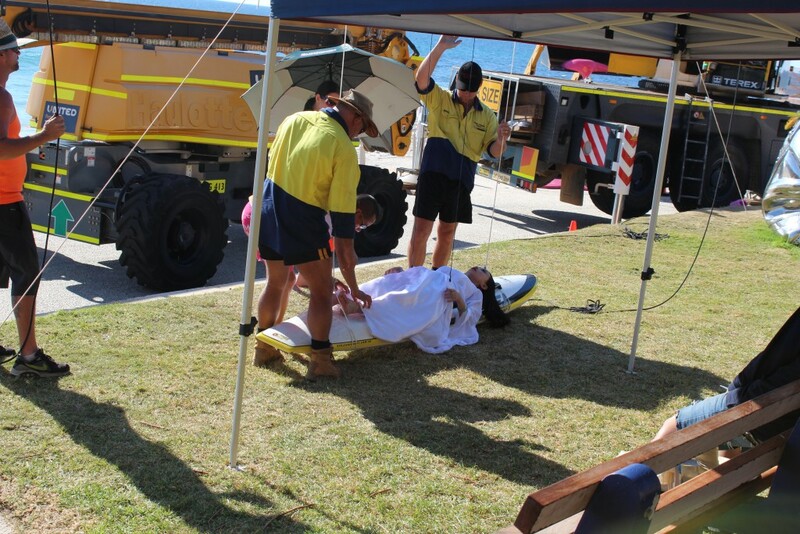 The event started in Bondi, a suburb of Sydney, in 1997, the brainchild of a fellow named David Handley. 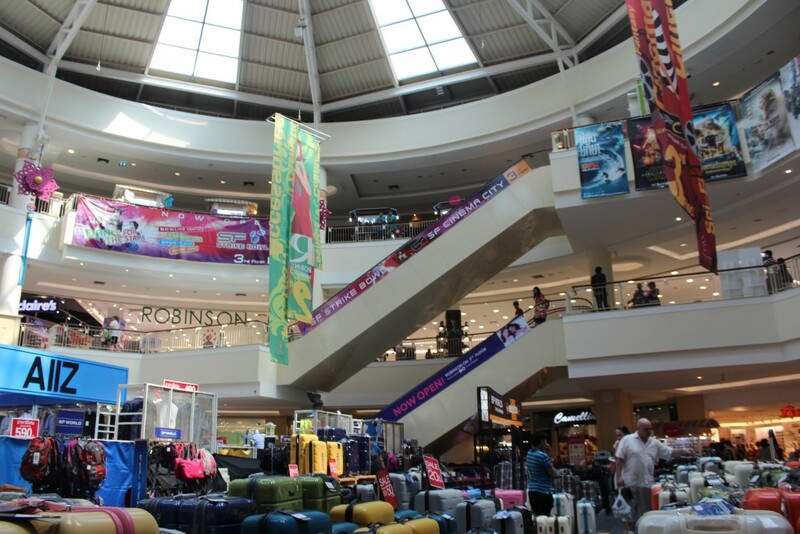 The following year it expanded to five locations to help promote the Olympic Games in Sydney. They included Darwin, Noosa, Albany and the Tasman Peninsula as well as Bondi. But the additional showings were one-offs. 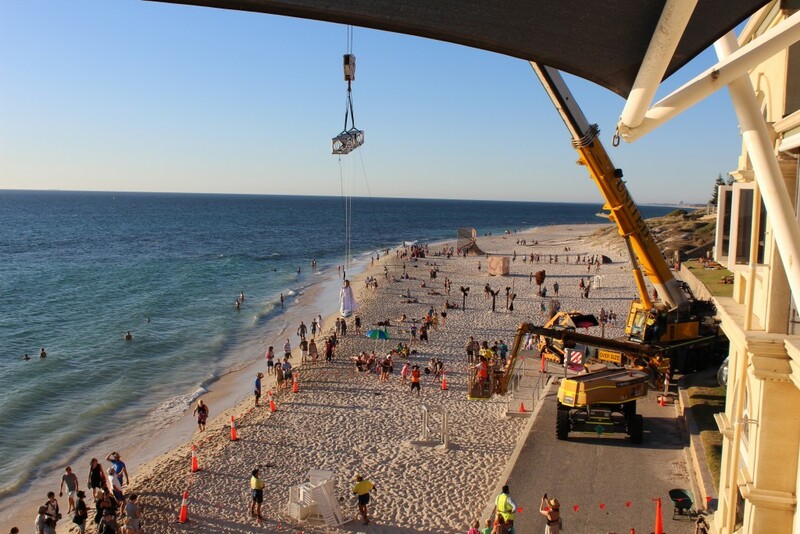 it remained a Sydney event until 2005 when the event was launched in Cottesloe, a suburb of Perth in Western Australia. It has been an annual event there ever since. 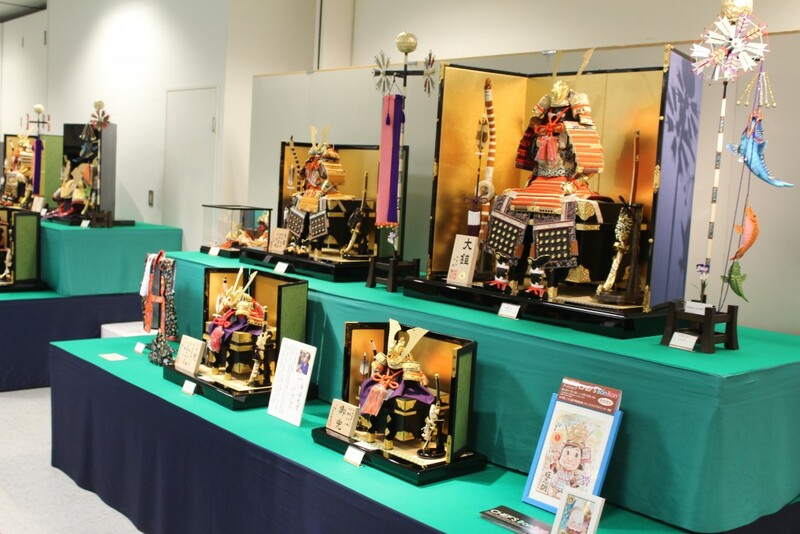 This year’s exhibition runs from March 4-20th. My wife and I checked it out Tuesday and had a great afternoon. Getting there is pretty easy. 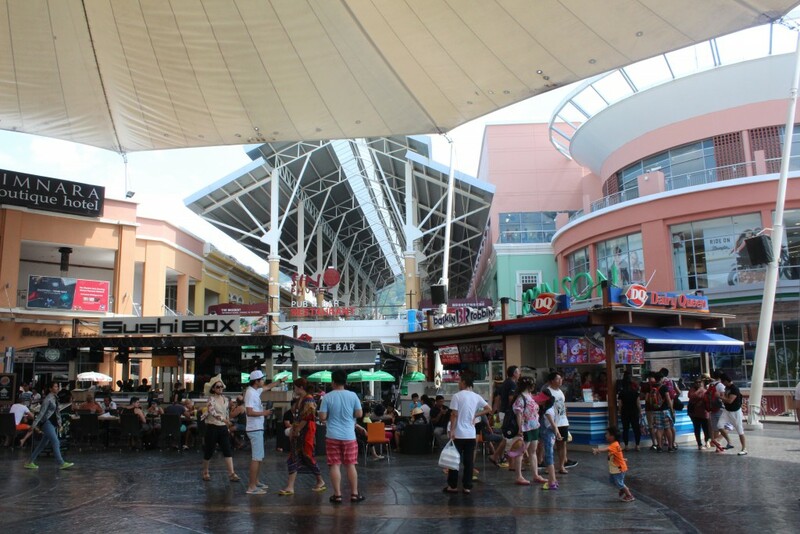 The town is very close to Fremantle and easily accessible by car. 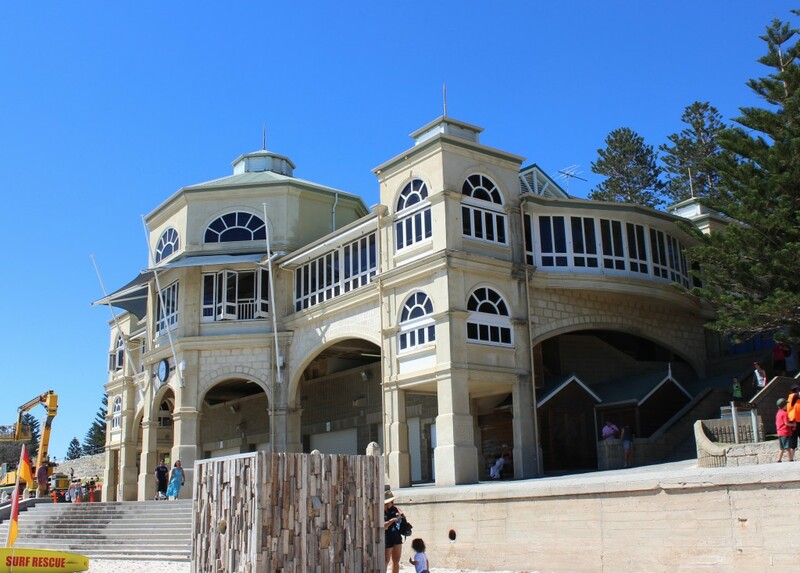 The beach is along Marine Parade. 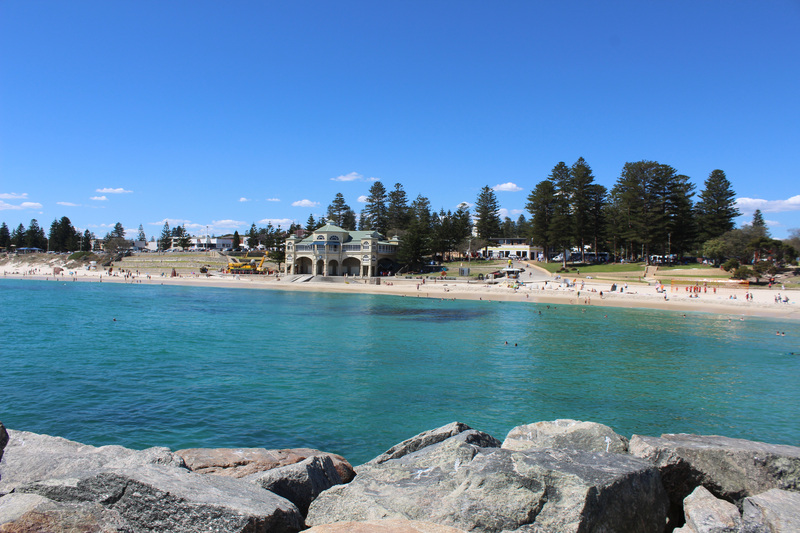 It is a short fifteen minute walk from the Cottesloe train station (1.1 kilometres) or a ten minute bus ride if you prefer. 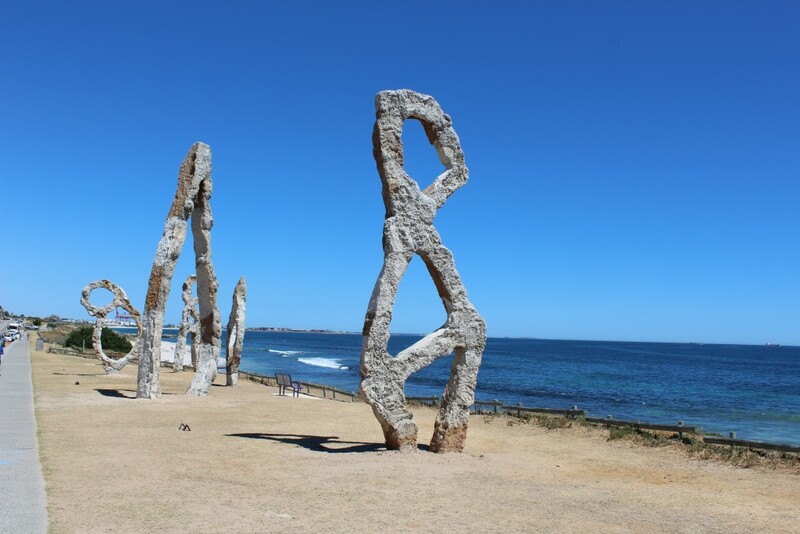 These giant sculptures are along the roadway just before the beach. 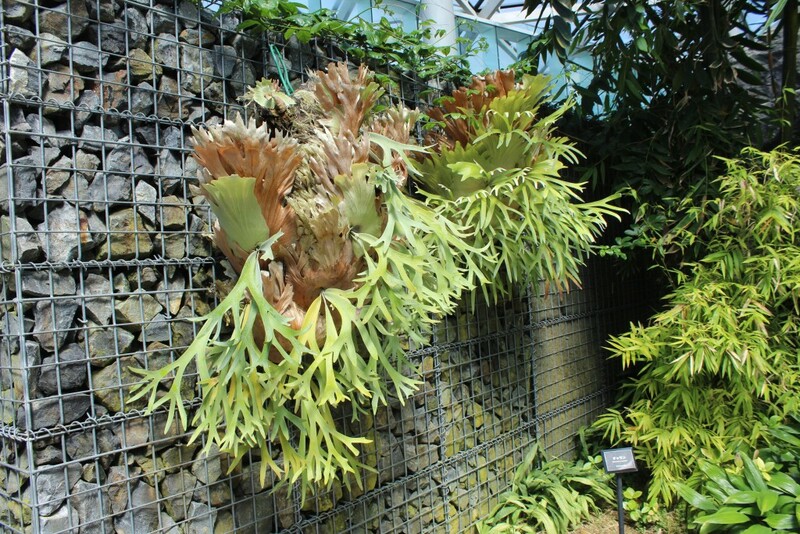 They are also part of the exhibit. The sculpture set is called Land of Giants: Quiver, Queen, King, Jester, Giorgio and is by American Peter Lundberg. We drove in and found lots of street parking on Marine Parade, though it might be rather busy on the weekends. 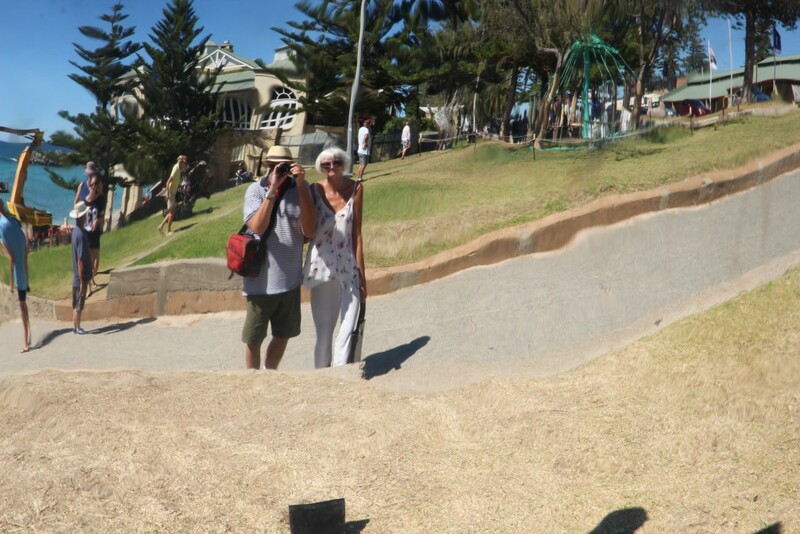 We parked just south of the beach and walked in, taking a path that took us past a couple of sculptures along the street and then down to a Cottesloe landmark, the Sun Dial. This isn’t part of the exhibit but is worth checking out any time. It keeps accurate time any time of the year. The instructions on how to read the sun dial are a bit cumbersome but easy to understand. The sun dial is a large one just at the south end of the beach. Not part of the exhibit but worth seeing. From the sun dial we walked up past the Surf Rescue building and came across several sculptures along the way. 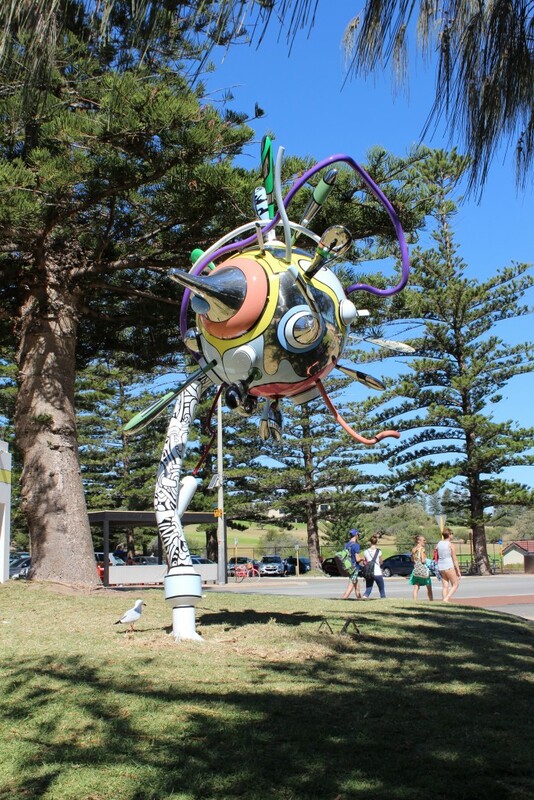 We decided to walk out on the breakwater, which also had a number of pieces of art on it, for an overview of the whole beach, then slowly made our way along the beach checking out the works. This year had works by 77 artists from nineteen different countries including Canada and the United States. The major sponsor is Rio Tinto Mines. Overview of the beach from the breakwater. The magnificent beach house dates from 1996. It is on the former site of an ice cream parlour built in 1910. We thought the cranes beside the beach house meant construction was going on. We were wrong! Many of these pieces must have been moved in by truck as they are huge. Others look like they might have been built in place just for the exhibit. They varied greatly in theme and content. Many were clearly abstract. Interesting shapes with no other significance than their beauty. Others were geometric patterns. Still others had themes. There were several with an environmental theme. And many were representational, often quite whimsical. 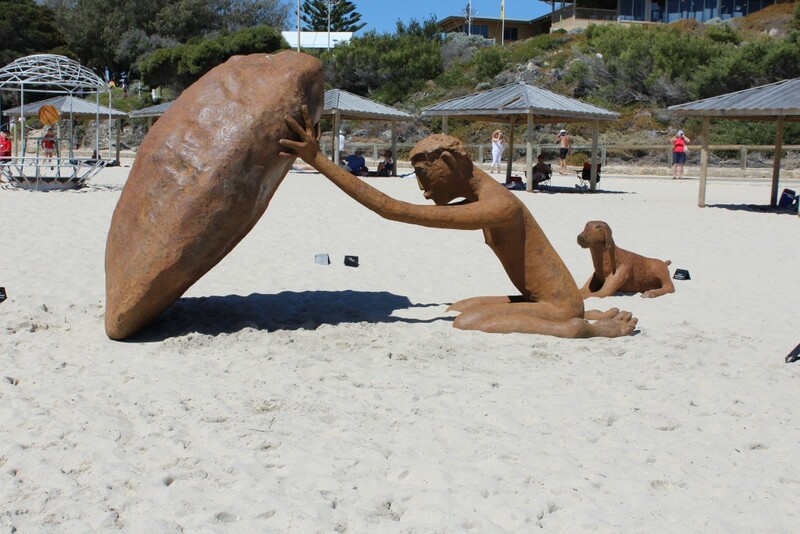 This piece is called The Pilgrim by Australian sculptor Russell Sheridan. 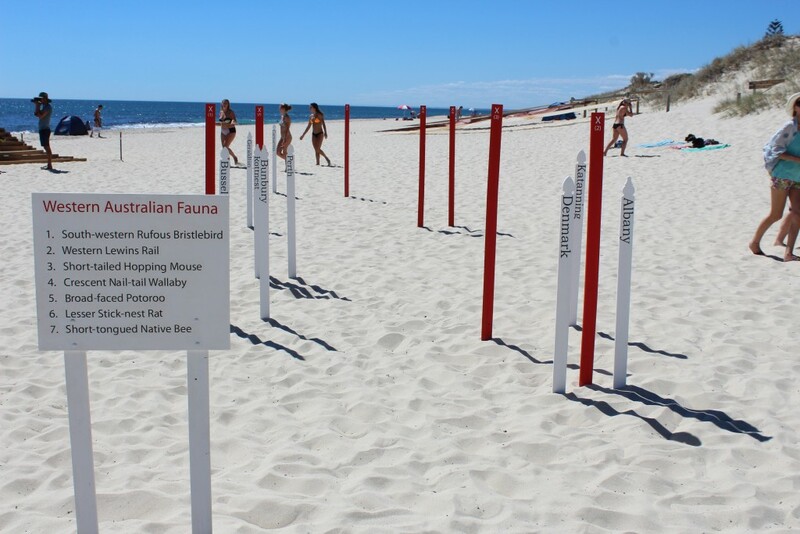 This sculpture consisted simply of posts with place names in Australia accompanied by red posts with a number on them. The legend indicated what species the numbers signified. All of these species are now extent. 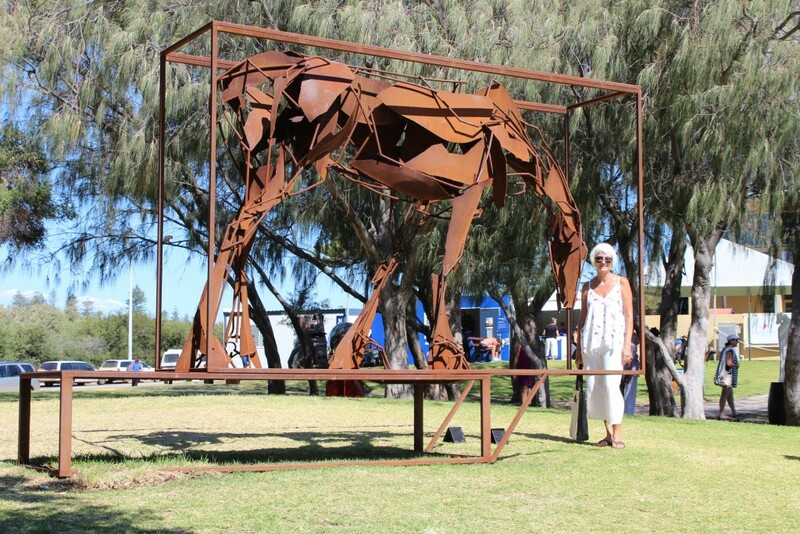 It was called simply “The Red List (Extinct)” by Australian artist Rebecca Westlund. A few of the pieces had motion as part of the display. I took a video of one which was a circle of colourful poles with streamers running between them. A class of school children were exploring it at the time. The piece is called Kakashi by Lithuanian Ameican artist Zilvinas Kempinas. 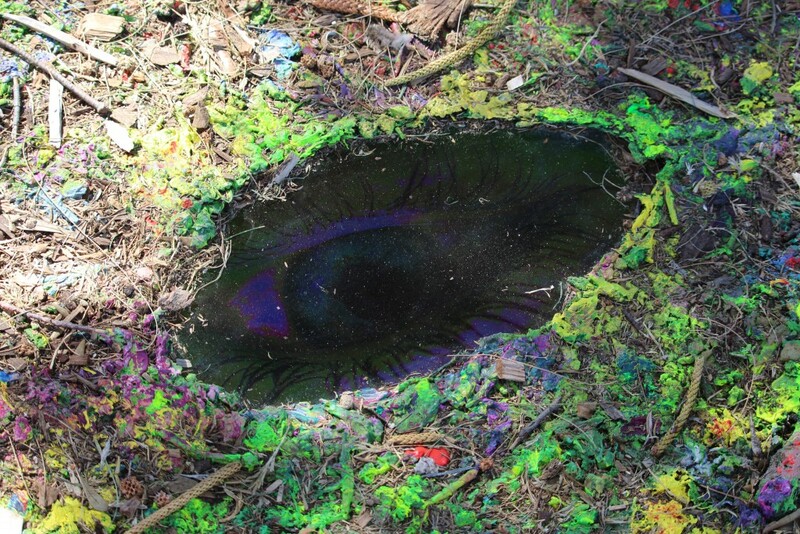 Another was simply called “Eye” and consisted of an LED screen embedded in the dirt and surrounded by some foliage. But if you looked closely, well, darn if it wasn’t an eye! And it was looking around! Kind of creepy actually. It’s by Danish artist Anne-Marie Pedersen. We ventured further up the beach and found more interesting pieces. 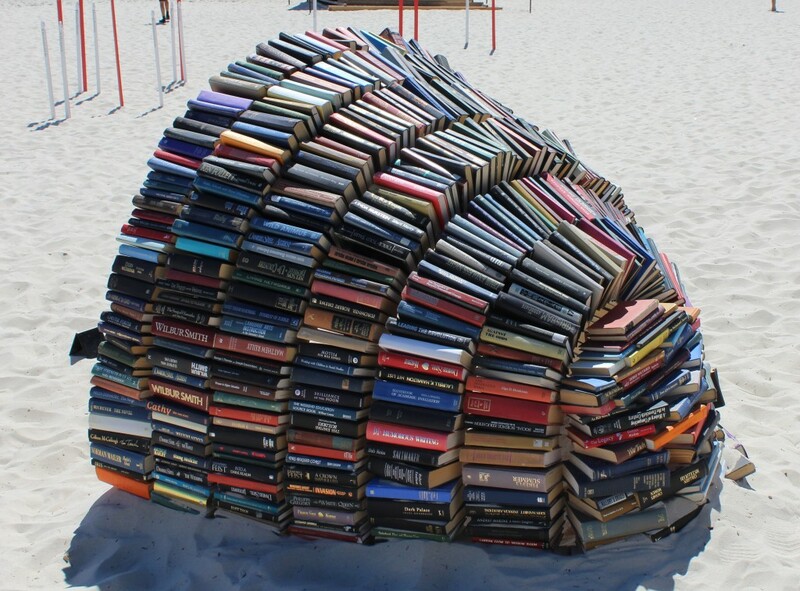 One was called Book Cave and consisted of a large number of hard cover books glued together to form a cave. Another was a simple but large geometric figure of wood. 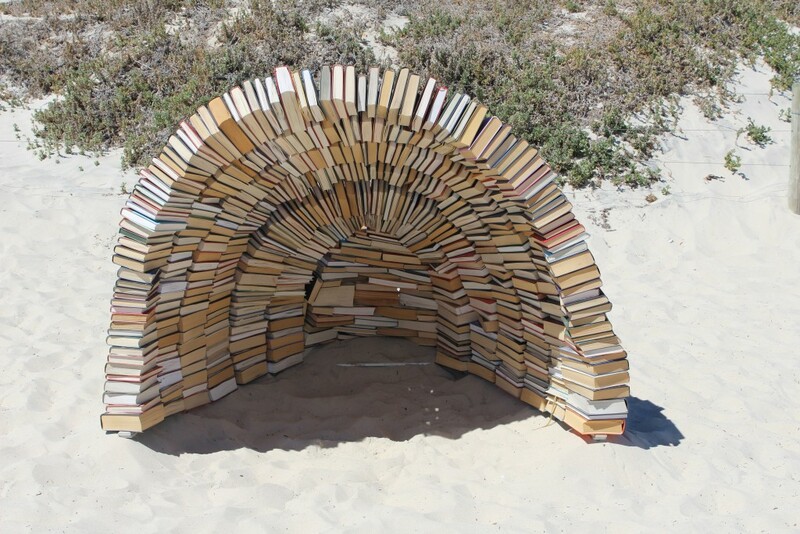 Book Cave by Australian artist Juliet Lea. 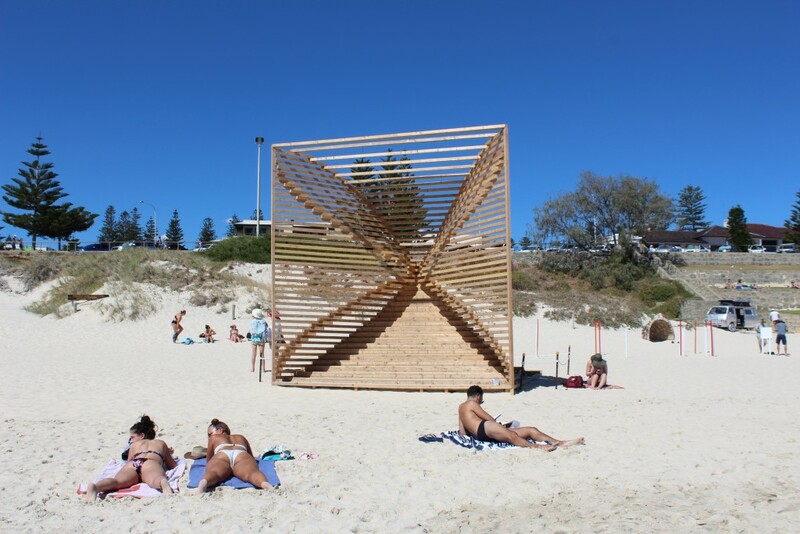 As you can see from the pictures, there were a lot of people on the beach not paying much attention to the artwork, just soaking up the sun, swimming and having a good time. The weather was warm, and bringing along your swimsuit and a towel is good idea. Make a day of it. A geometrical wooden sculpture anchored one end of the exhibit. 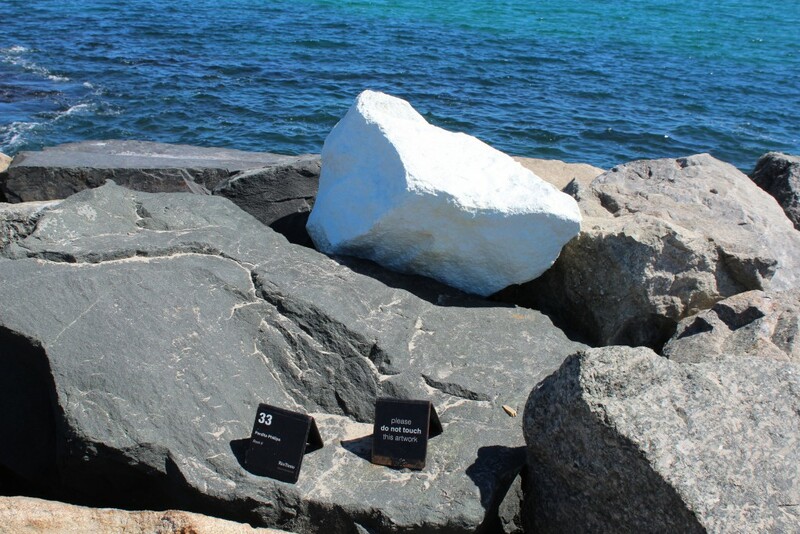 It’s called Sømærke by German artist KWY and Portuguese artist Lise Kassow. 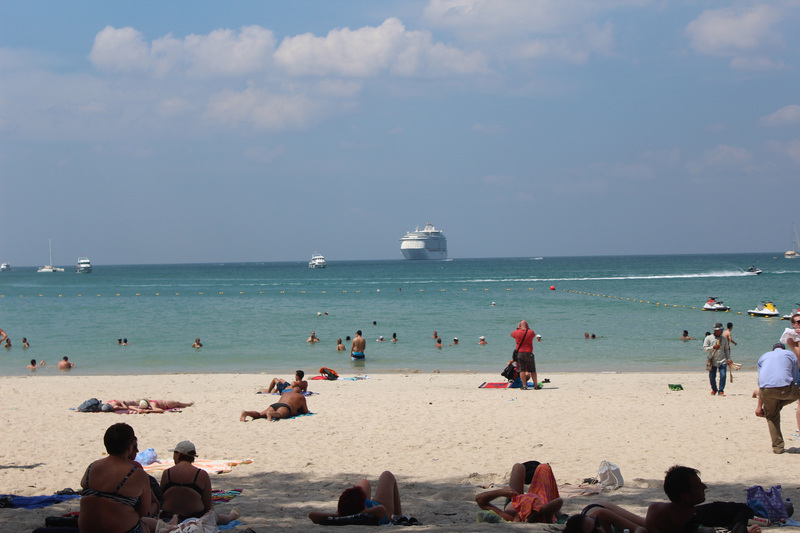 Lots of sunbathers and swimmers were at the beach. 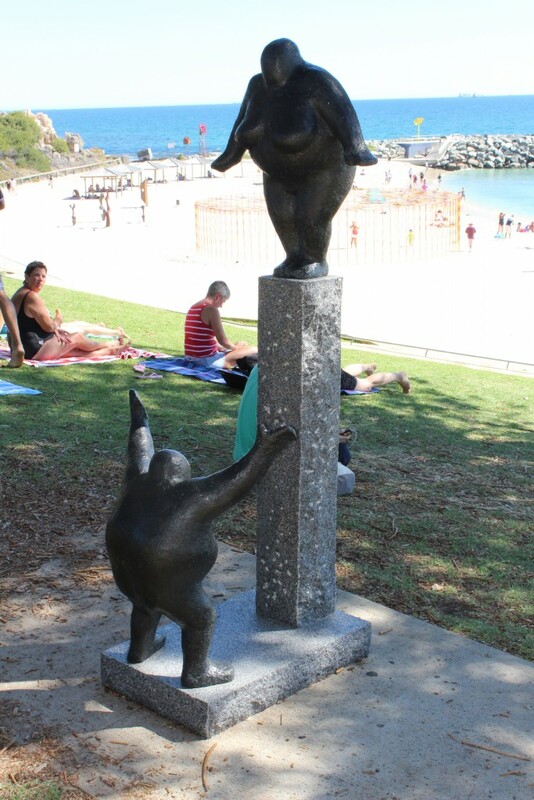 Wandering up behind the beach house, we came across a stainless steel sculpture of a chubby flying boy. We could see our reflection in it quite clearly. And still further along we came across the largest of the sculptures called Re: Generation. It consisted of a curved bald pate on the ground, a multi-sided face that appeared half buried and a very large fully emerged multi-sided face. They were all in white porcelain or something that looked like white porcelain. Re: Generation by Australian artist Sonia Payes. The couple on the ground were oblivious to the sculptures or anything else for that matter. We came eventually to the Search and Rescue building which had a room full of smaller sculptures on display. Many were miniatures of ones we saw on the beach and all were for sale. 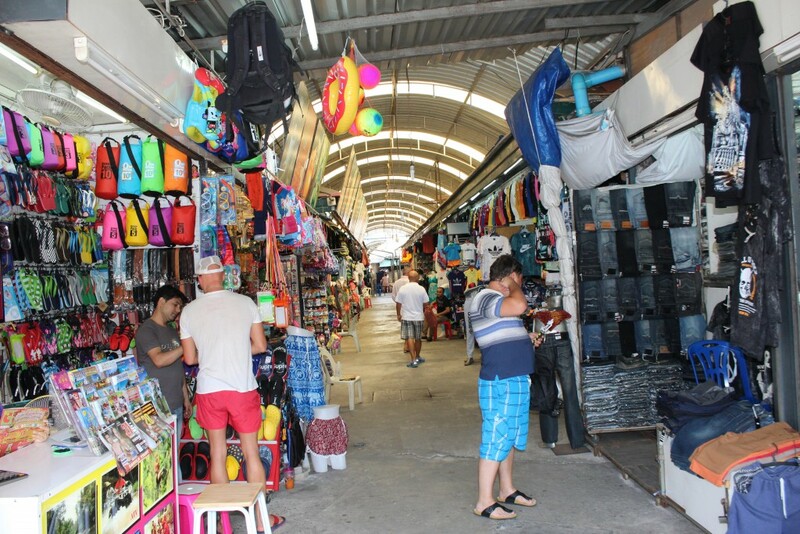 Prices ranged from around $900 to thousands of dollars. My wife saw one selling for $46,000. Smaller sculptures, many of them replicas of the larger ones, were on display and on sale inside the Search and Rescue building. 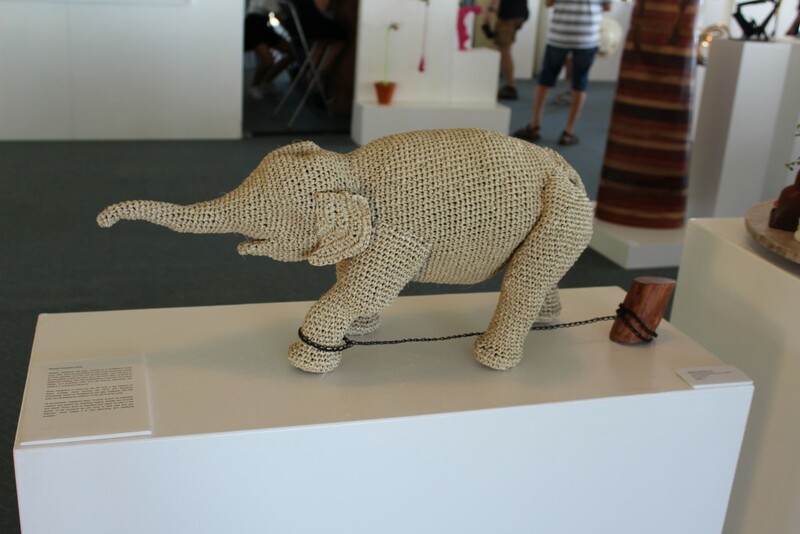 One of the smaller pieces on display inside was of a tethered elephant. 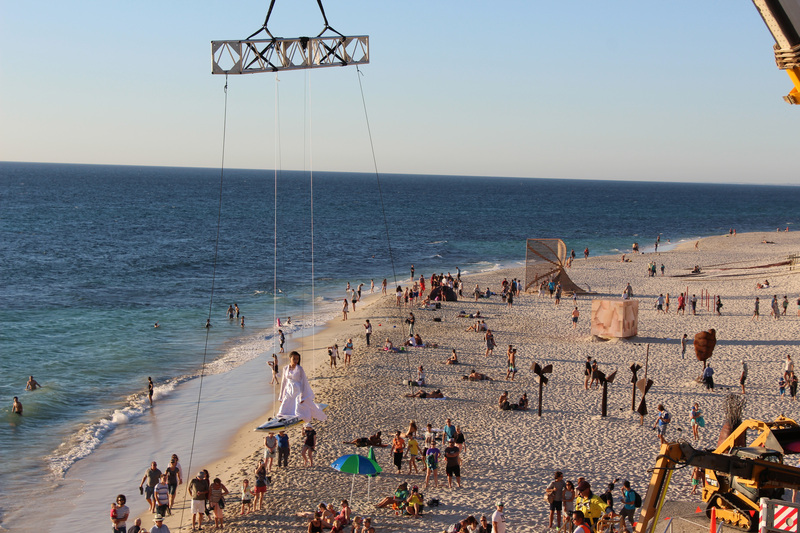 We also saw a monitor showing a video of a woman in a mermaid outfit suspended in the air on wires. Nearby was a large framed photograph of the mermaid without the wires. I asked about it and we found out the artist was going to be doing his “performance art” at 4 PM by the beach house, so we headed back to take it in. The artist is Chinese photographer Li Wei. 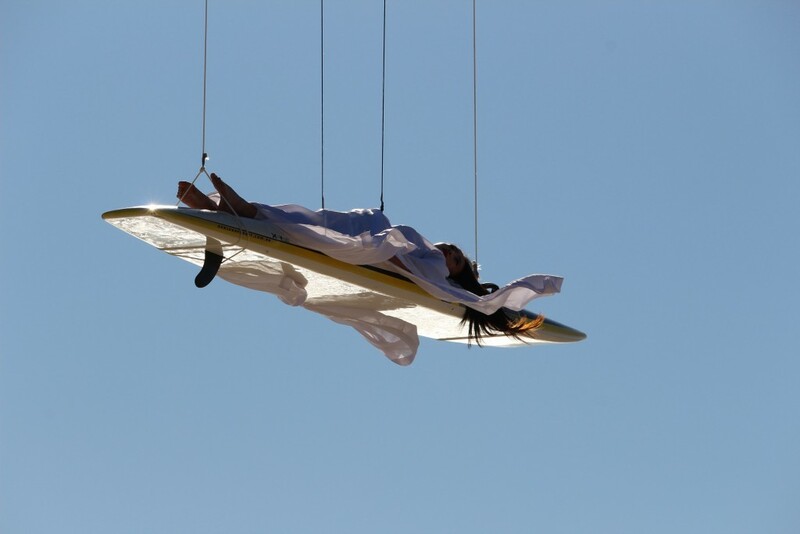 A model reclines on the surfboard, ready to be hoisted in the air as part of a performance art piece. 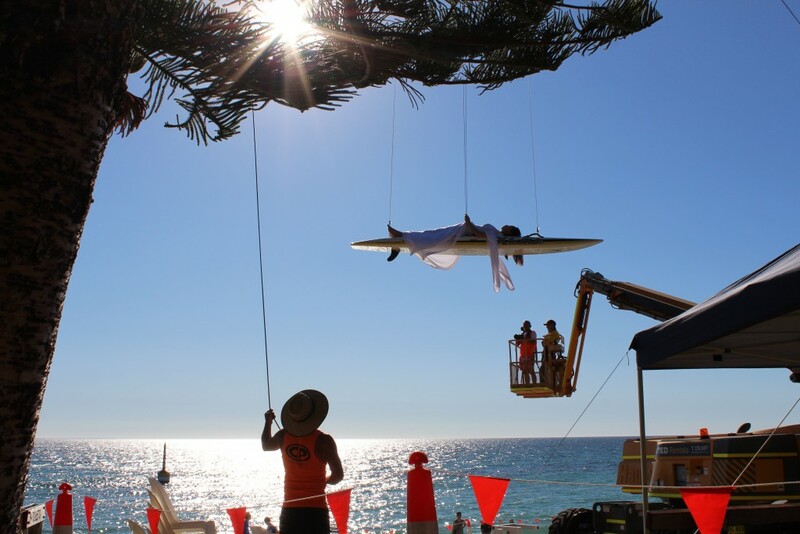 A model in flowing white robes was strapped to a safety harness and then she lay down on a surfboard hooked by cables to a crane. 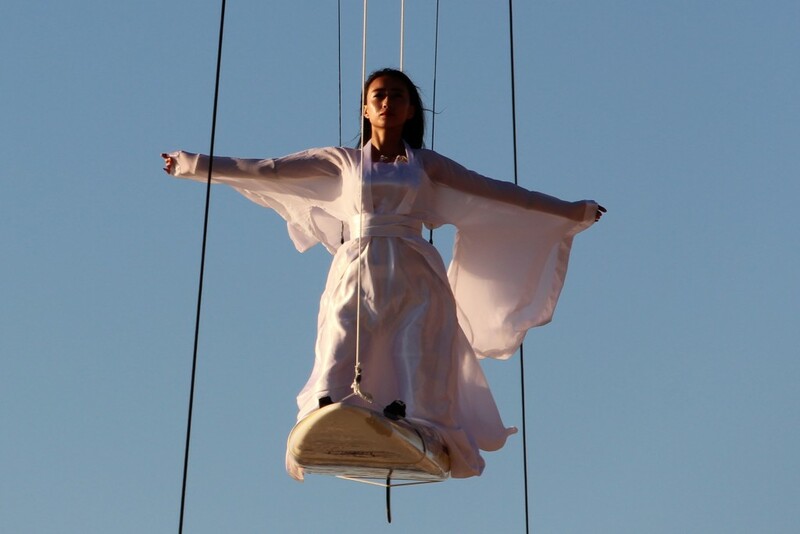 Another crane had a platform where photographer Li Wei would stand. After a half hour or so of set-up, she and he were hoisted into the air for the photo shoot. She went up and down several times, changing poses each time. 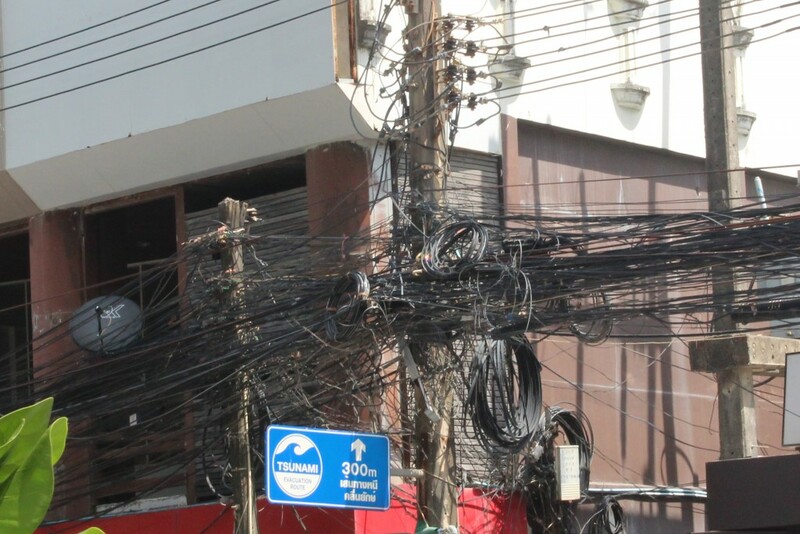 I suspect the photographer will air brush out the wires and cables for his finished pictures. We then went to the beach house which houses a large restaurant called Indiana and had a tasty meal. The restaurant has large windows and a beautiful overview of the beach. The beach house and the Indiana Restaurant. It’s a beautiful old building with a magnificent view. We enjoyed a tasty early dinner here. A nice ending to a great afternoon. All in all, it was a terrific afternoon. It’s highly recommended. And it’s free! 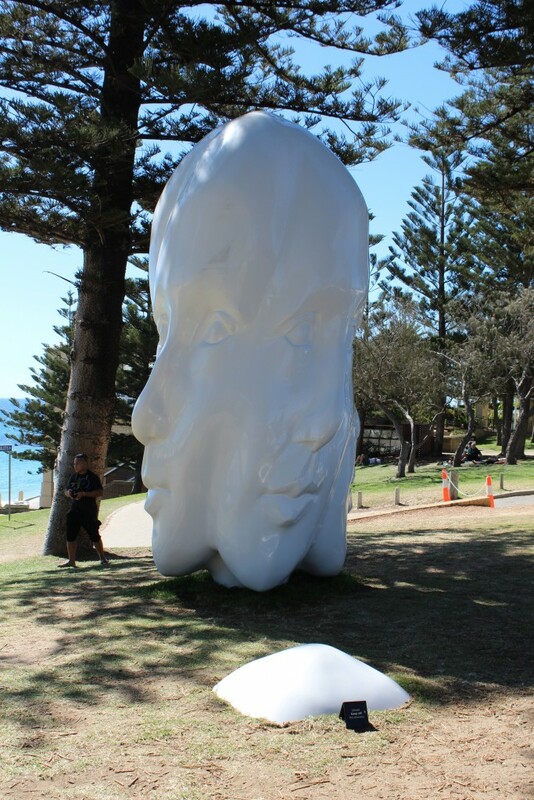 Here are a number of additional pictures from Sculpture by the Sea at Cottesloe, Western Australia. The Sun Dial. 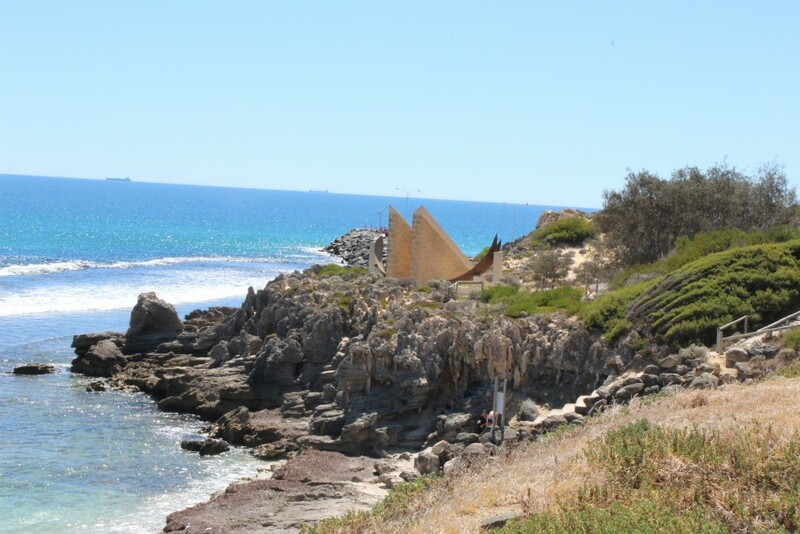 This large sun dial is a permanent structure and not part of the Sculpture by the Sea exhibit. But it is worth checking out. These sculptures look like giant chess pieces. They are knitted fabric. 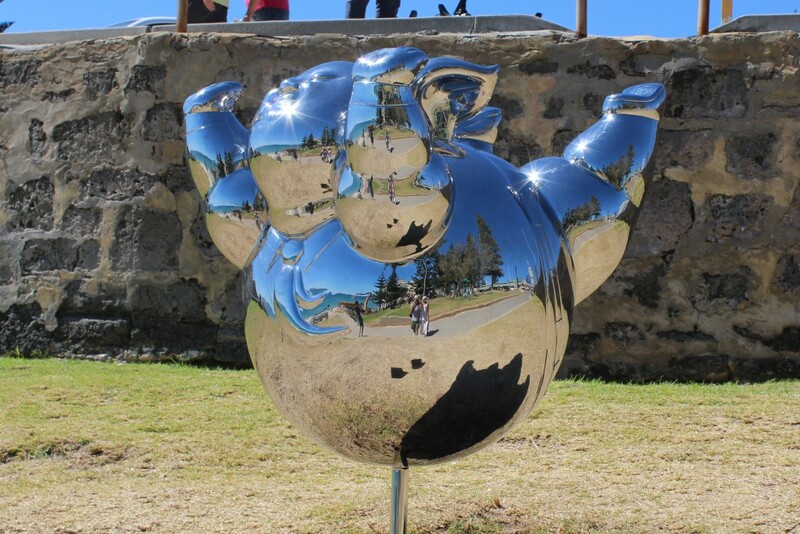 It’s called Big Intentions and is by Australian artist Mikaela Castledine. Some pieces were extremely simple. This piece is called Rock II by Perdita Phillips. 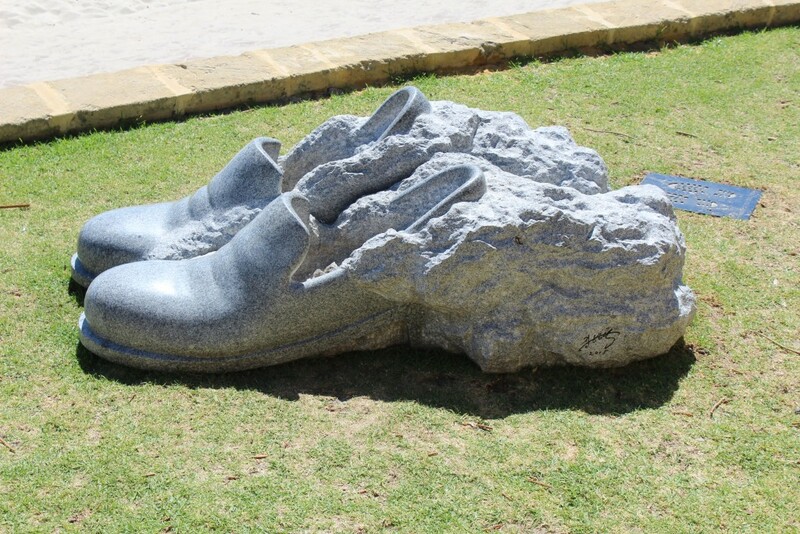 This piece is called “Dust” by Australian sculptor Norton Flavel. A smaller version was for sale in the gift shop for a couple of thousand dollars. This work is like the perspective rooms where things of the same size look different depending on where in the room they are. 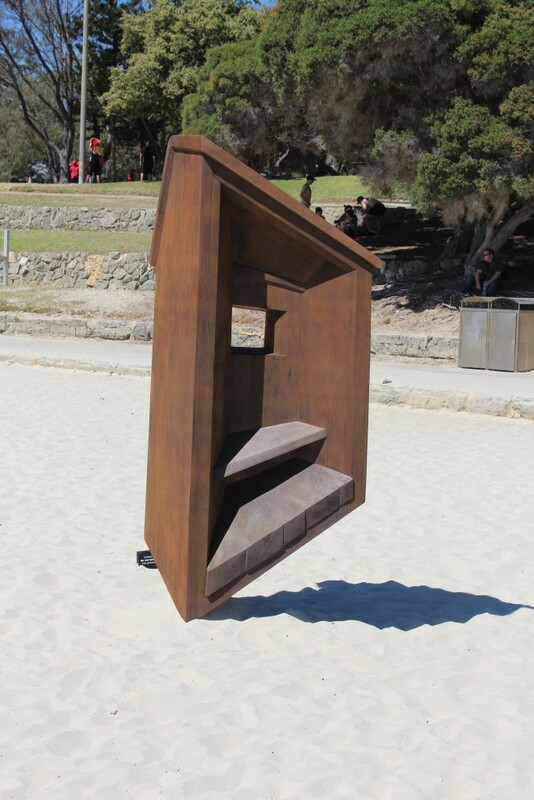 It’s called Parallel Thinking Space by Australian artist Dale Miles. It won the Rio Tinto grand prize of $50,000. Bubble No. 7 by Chinese artist Qian Sihua. 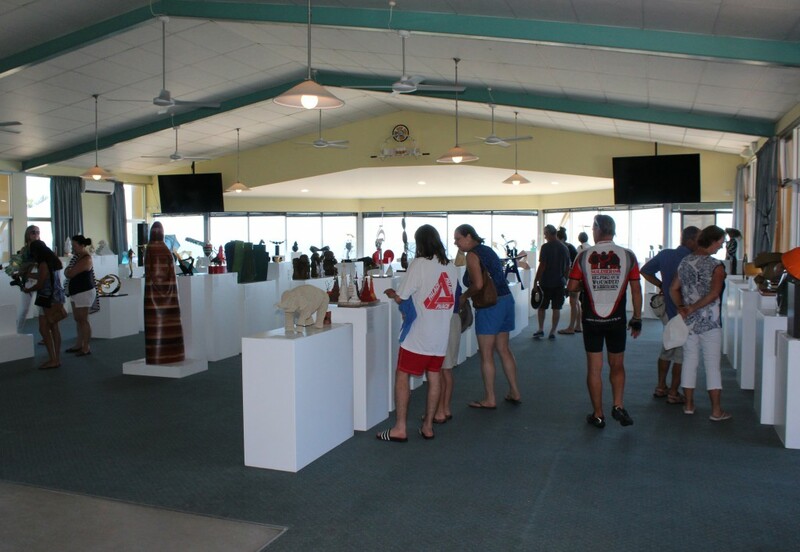 77 artists from 19 different countries were on display here. Giant shoes. 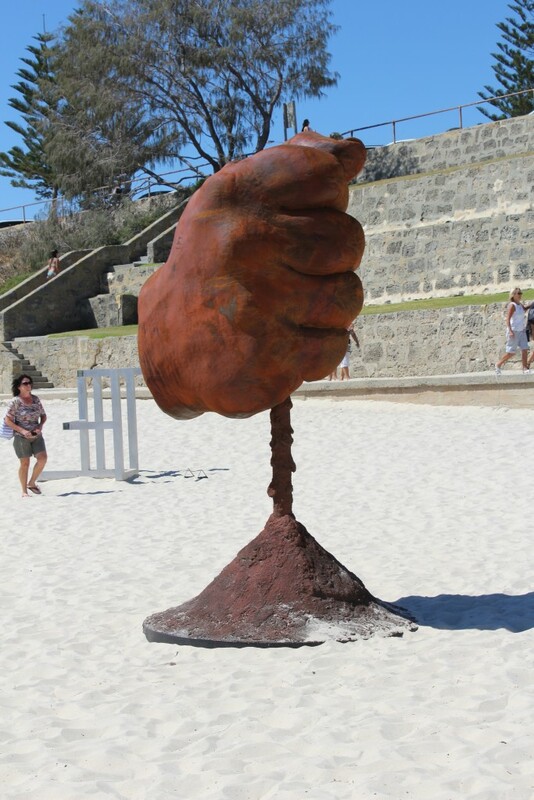 It’s called The First Experience of a Poet # 3 by South Korean sculptor Hyung-Taek Chang. Janis and friend. 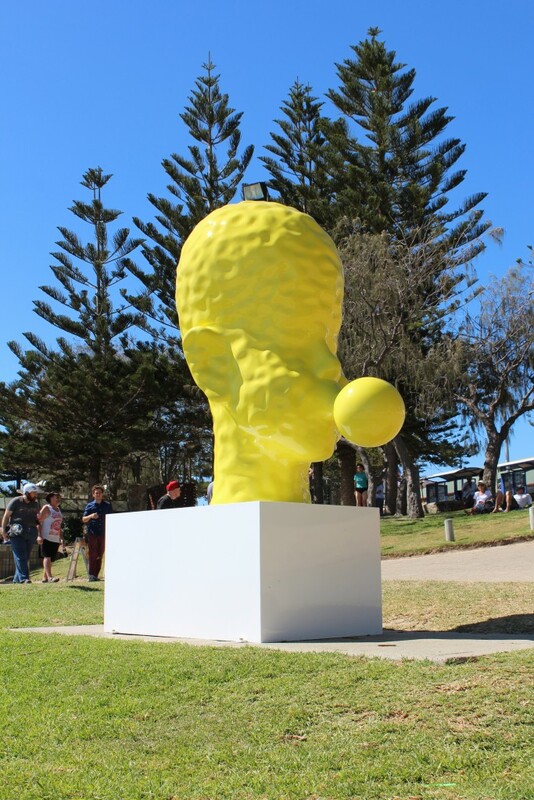 The sculpture is called Boxed by Harrie Fisher. Travelling Bag by Chinese artist Yumin Jing. Stainless steel bag with plants inside. Talk about a nice planter! The crane in the background is waiting for the performance artists. 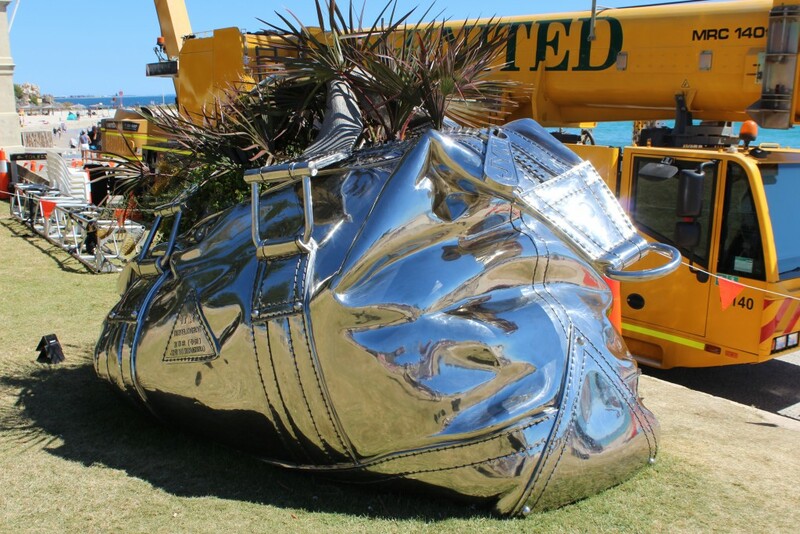 Our reflection in the stainless steel piece called City Dreams by Chinese sculptor Gao Xiaowu. 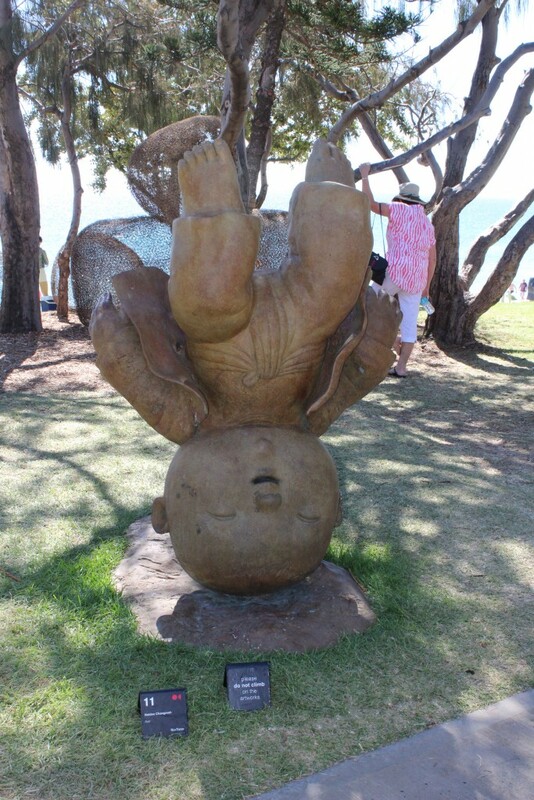 A piece of whimsy called “Fun” by Thai artist Naidee Changmoh. Pocono Bud by Taiwanese American artist Tang-Wei Hsu. Very colorful. 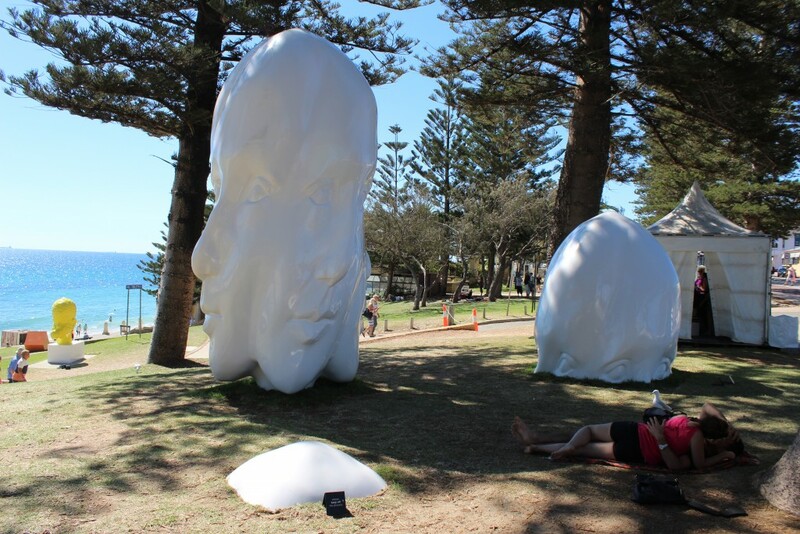 Two of the three pieces that make up Re: Generation by Australian artist Sonia Payes. It’s very large and was Janis’s favorite piece at the exhibit. Another whimsical piece called Catch Me by Danish sculptor Keld Moseholm. An amusing piece called Eye by Danish artist Anne-Marie Pedersen. The LED screen has a video of an eyeball that is always moving. Performance art in progress! The artist is Chinese photographer Li Wei. High above the beach. Photo taken from the Indiana Restaurant. 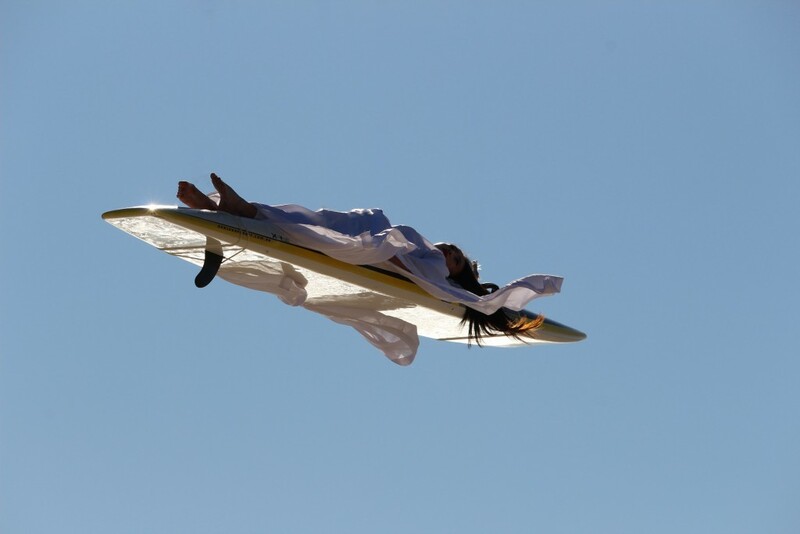 The model floating in the air on a surfboard. What it may look like with the cables air brushed out. 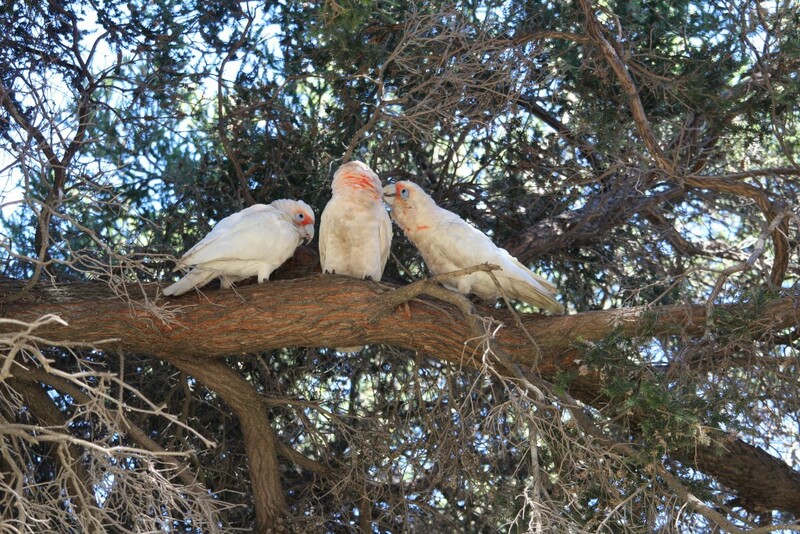 And our last three pictures – some of the wild cockatiels from the trees nearby. Buddies. 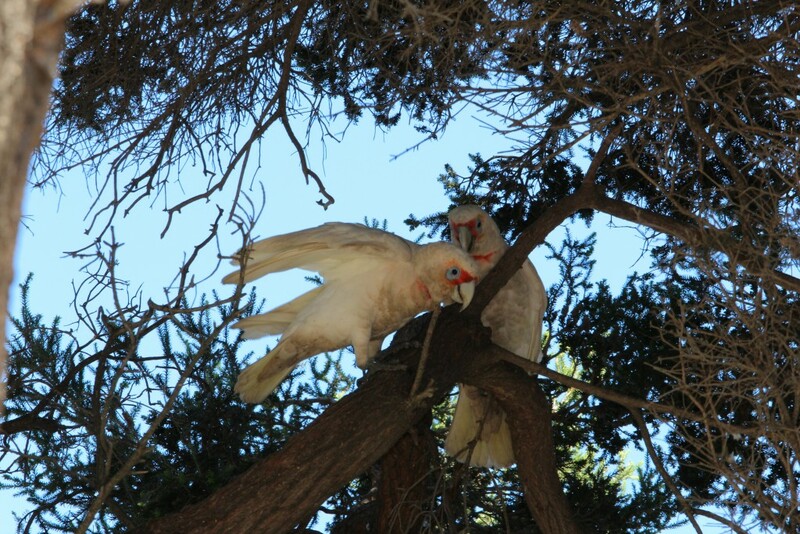 Although wild cockatiels are fairly common in Western Australia, I still get a kick out of seeing them and wan to snap pictures. This one had interesting colours with a pink belly. James Bond fans may remember 1974’s The Man With the Golden Gun, starring Roger Moore as 007. 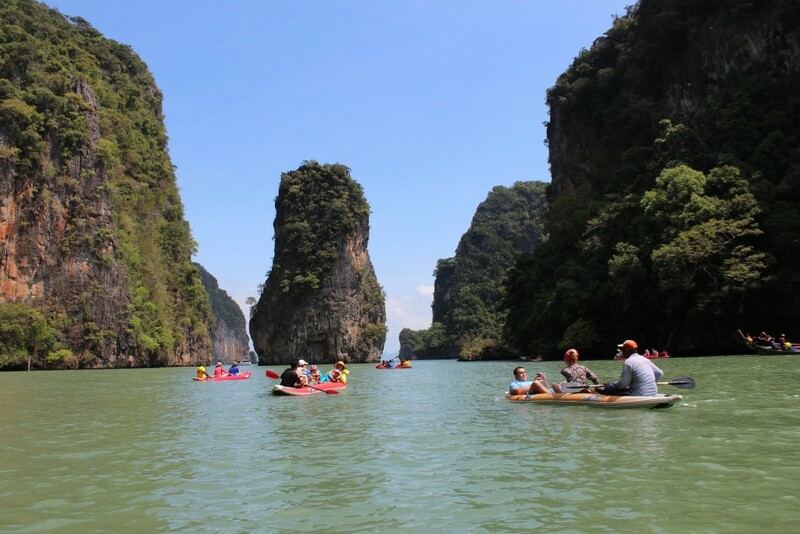 Not one of the best Bond films, but memorable in part for the spectacular scenery of Phang Nga Bay in Thailand which served as the setting for villain Scaramanga’s hideout. 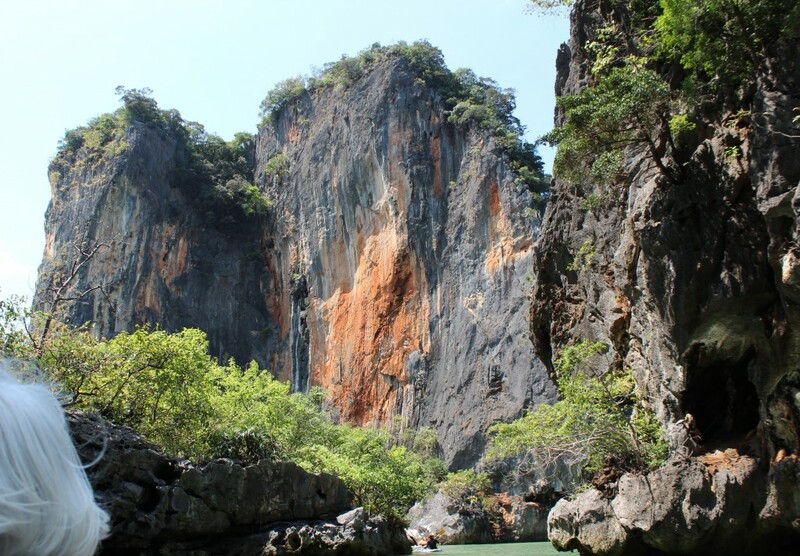 The movie drew attention to the area and put pressure on Thai authorities to preserve this natural beauty. 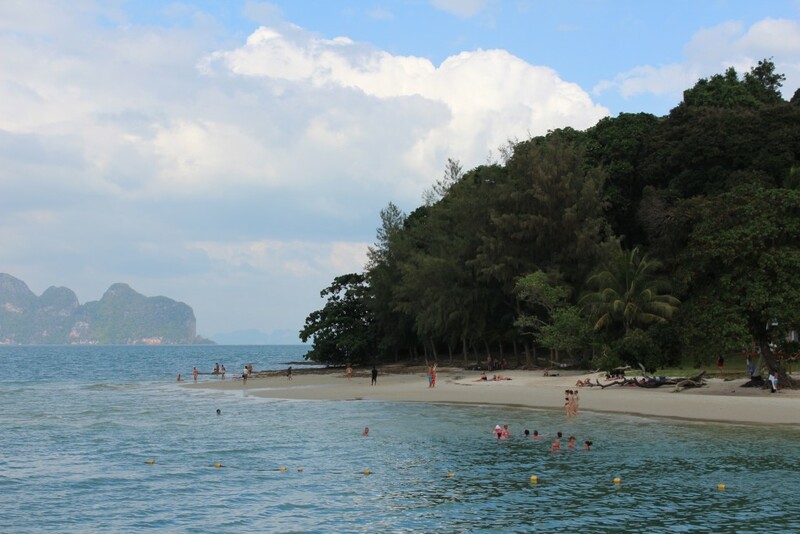 In 1981, much of the area was designated as Ao Phang Nga National Park, including the many islands in the area. 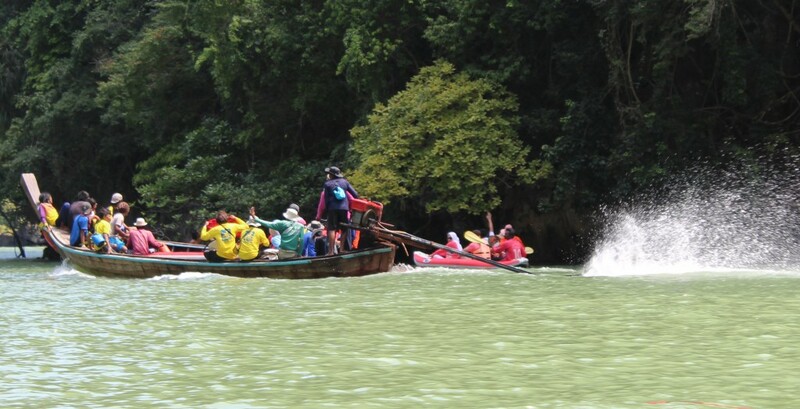 It has become a major eco-tourism destination. 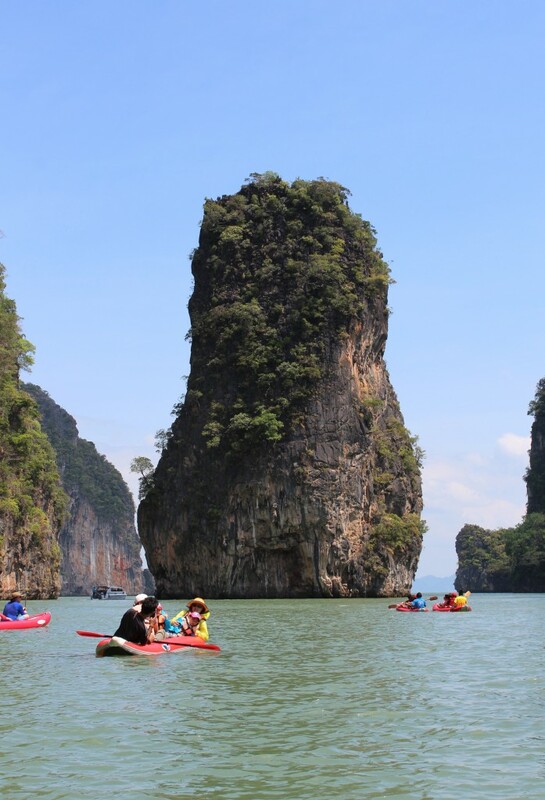 The archipelago at Phang Nga Bay is breathtaking in its beauty. 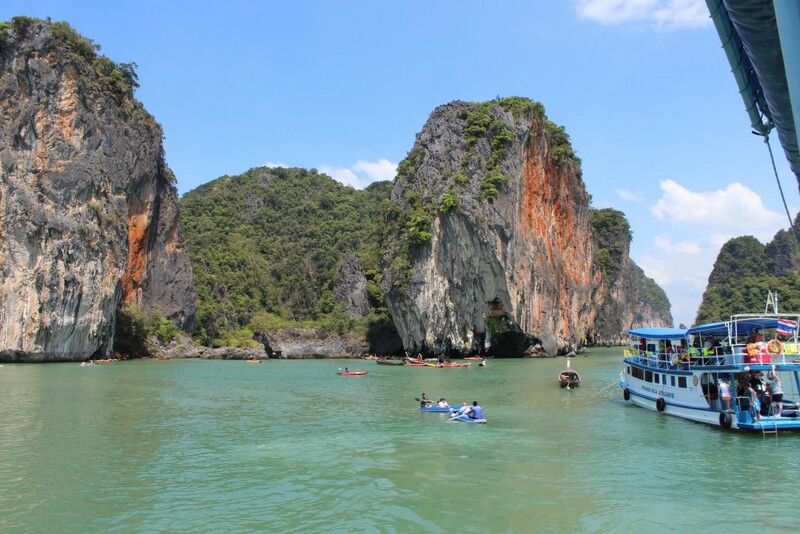 On our second day in Phuket we booked an excursion to explore sea caves in the area. 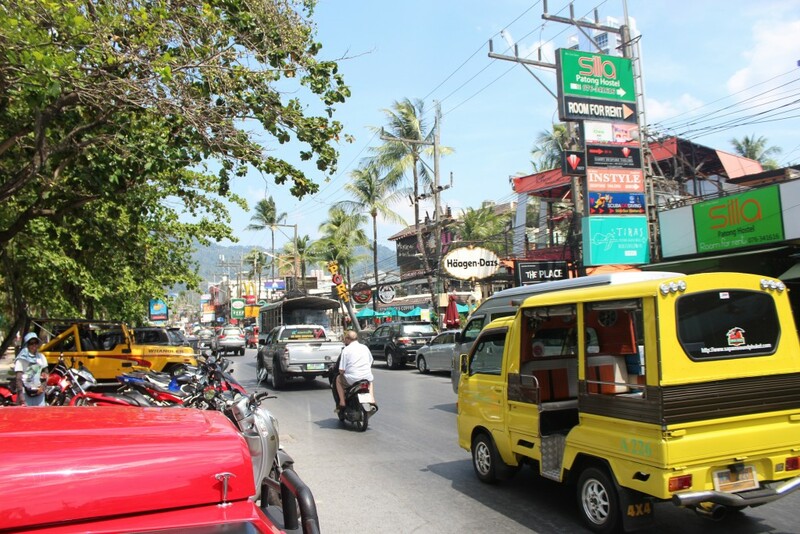 We boarded a bus near the pier in Patong Bay for the hour long drive to Laem Sai Pier at the northern end of the island. 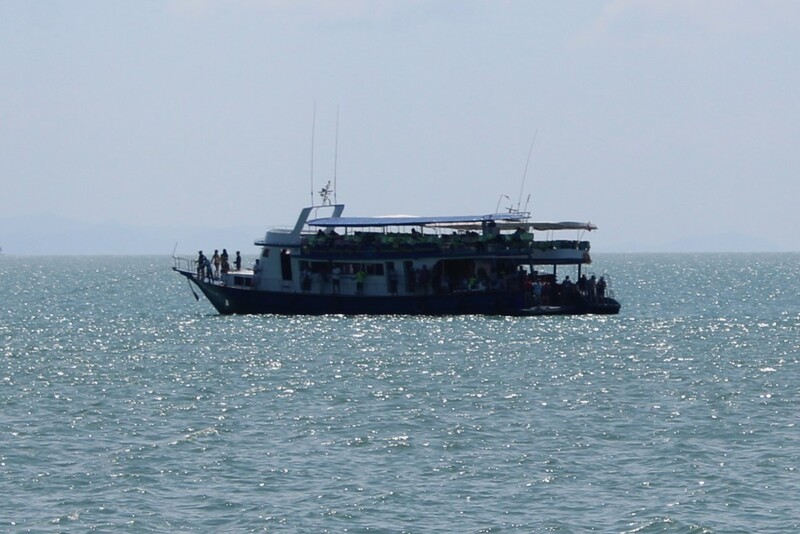 There we boarded a motor launch for the hour boat cruise to Hong Island and the surrounding area. A tour boat similar to the one we were on. There were quite a few on the bay. Eco-tourism is a booming business here. The scenery was, indeed, like that in the Bond movie. 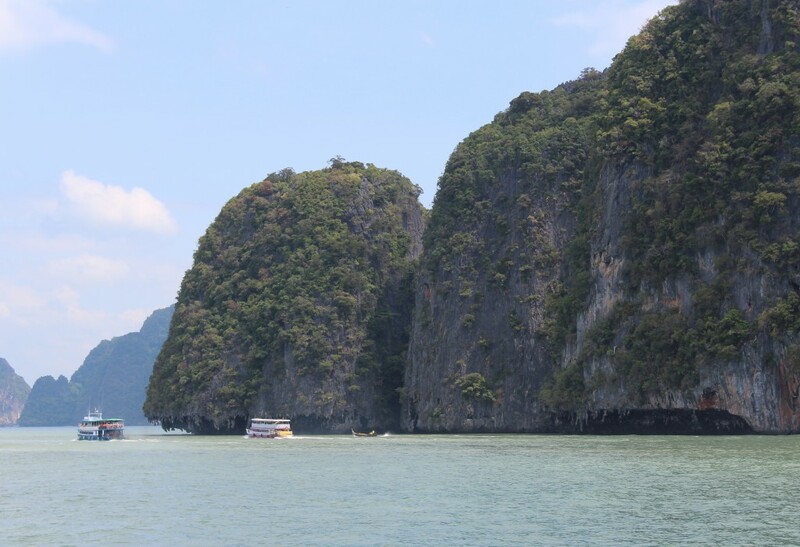 Spectacular islands densely covered in vegetation with deep pitting in the exposed limestone, particularly at sea level. 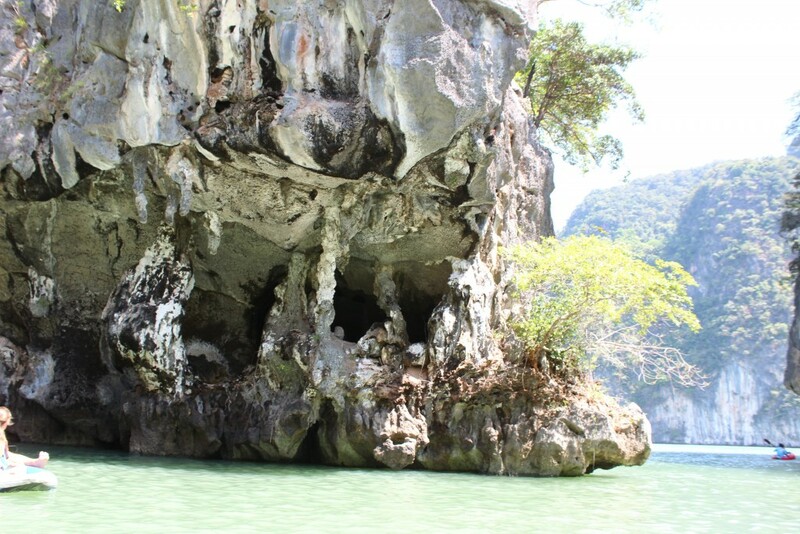 Eroded limestone created some spectacular hongs or sea caves. We dropped anchor offshore from one of the islands and a myriad of small three person canoes were launched – two tourists and a guide in each. 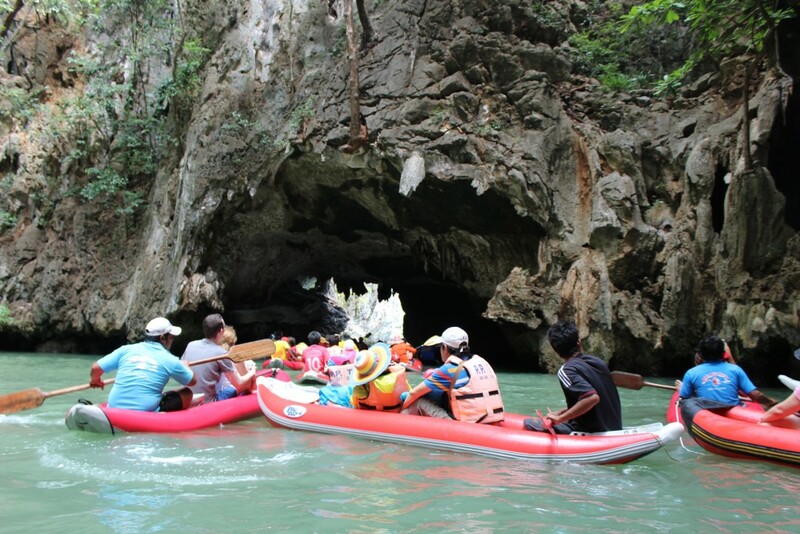 Janis and I and our guide followed some other craft into a cave and out the other end into a sheltered area surrounded by steep cliffs, limestone rock formations and lush greenery. 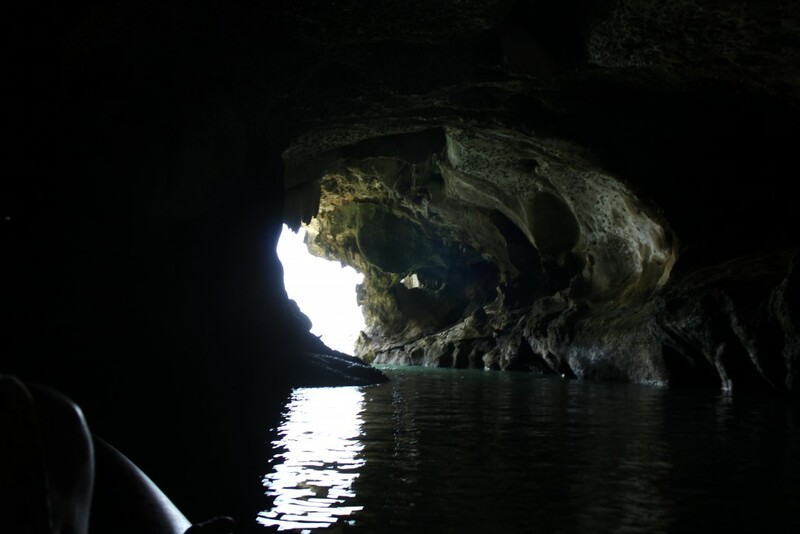 We entered a sea cave and our guide steered us through to the other side. Some of the rock formations looked like dollops of melting ice cream. An island near the end of the channel looked much like the island in the movie that had the solar power unit atop it, though it was not the actual island. 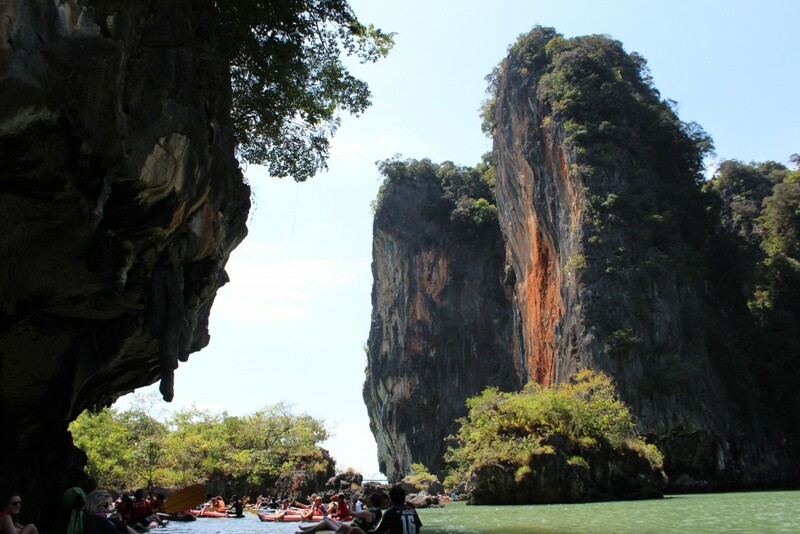 One of the other excursions did go to that island, now actually called James Bond Island. This tall pinnacle is similar to the one in Man With the Golden Gun. 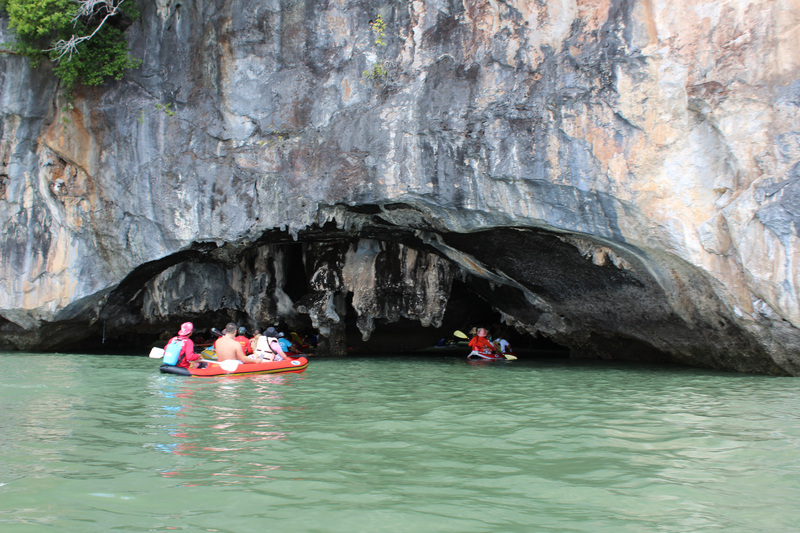 We paddled around, occasionally drifting in to shore to see the rock formations up close and on one occasion, we lay back as our guide paddled us into a deep low-hanging cave and back again. Inside a sea cave illuminated by the flash. We had to lie back to make our way under the low hanging rock face. The entire area was spectacular – stunningly beautiful with streaks of red sandstone interspersed with grey and yellow limestones. 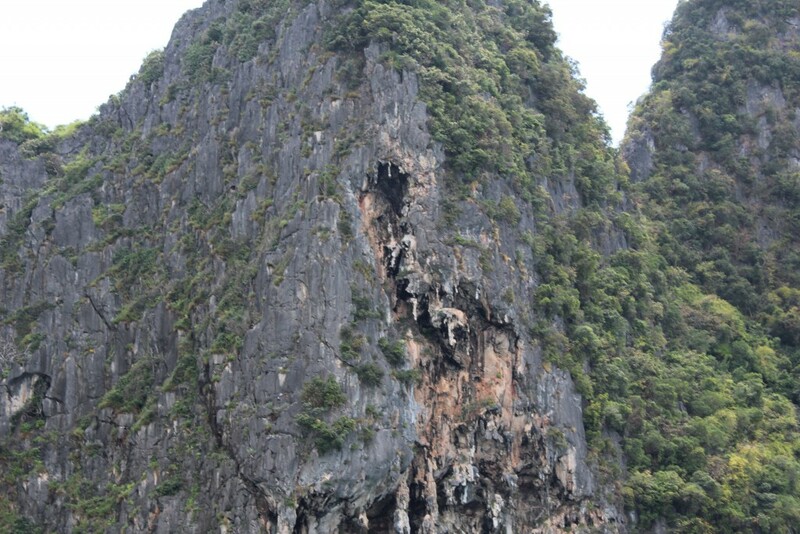 Streaks of red in the limestone cliffs accentuate the islands’ natural beauty. 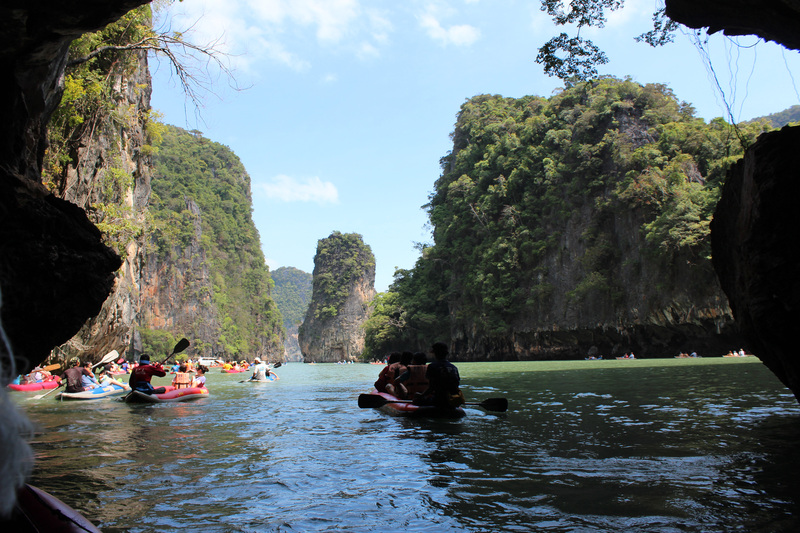 We paddled around taking in the scenery for a good half hour before paddling around an outcrop and back to our ship. We were allowed to swim in the bay, so I gave Janis the camera and went over the side, swimming behind our kayak to the mother ship. The water was very warm. 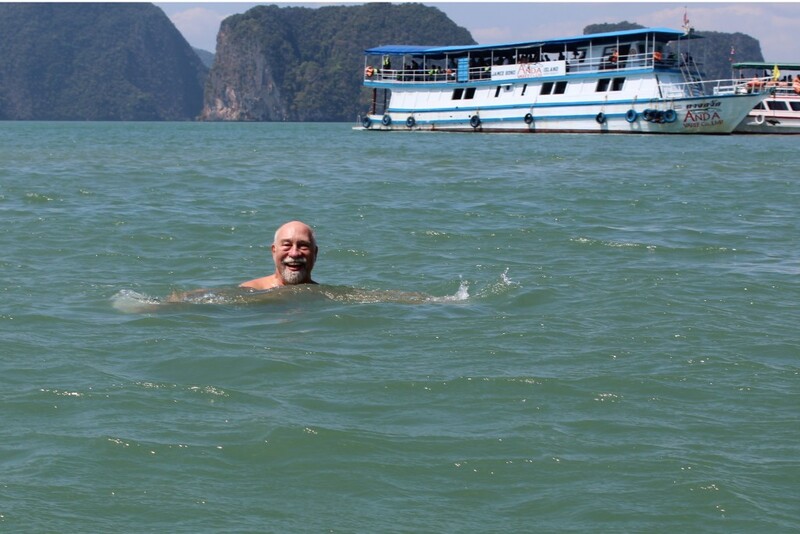 Yours truly taking a swim in Phang Nga Bay. 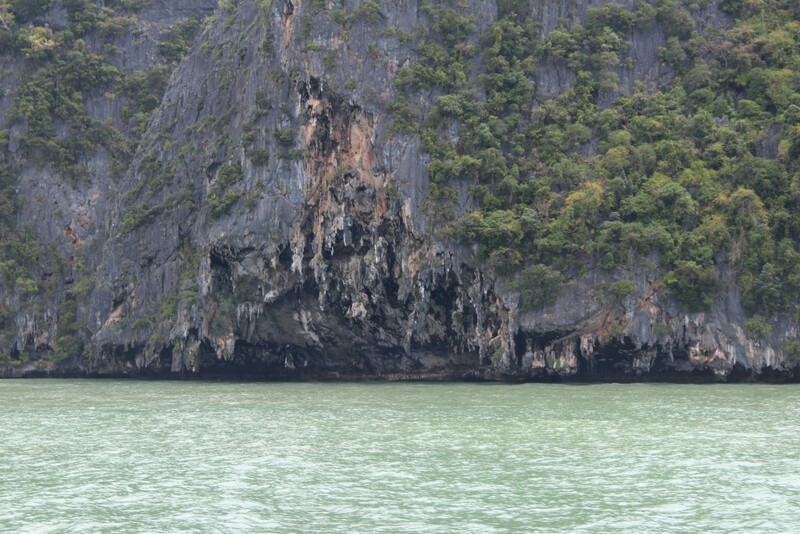 Once aboard, we tootled off towards another island – destination: the bat cave. Not that batcave! No Batman and Robin in sight. 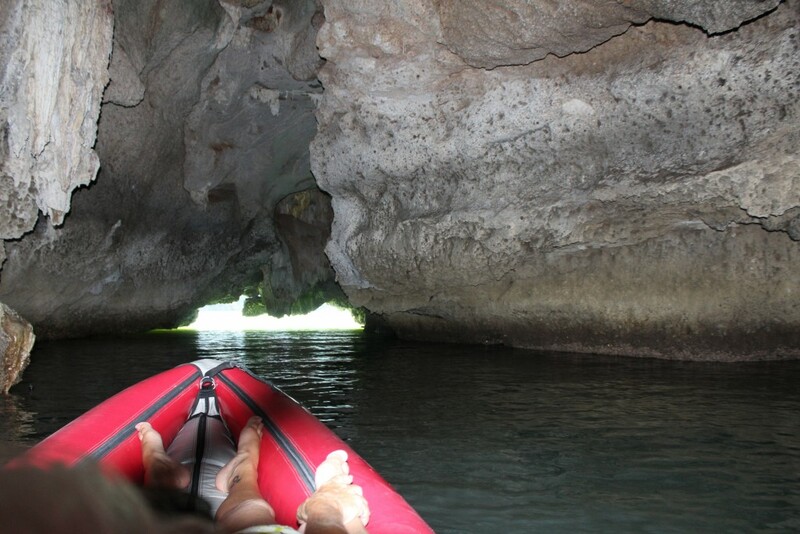 But we once again took to the canoes and went into a much deeper cave system. 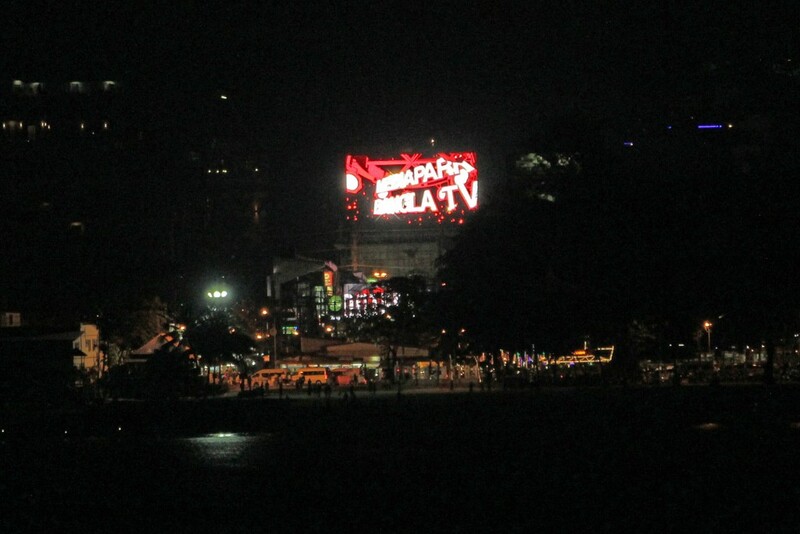 Here we entered total darkness, only the guides’ flashlights providing illumination. 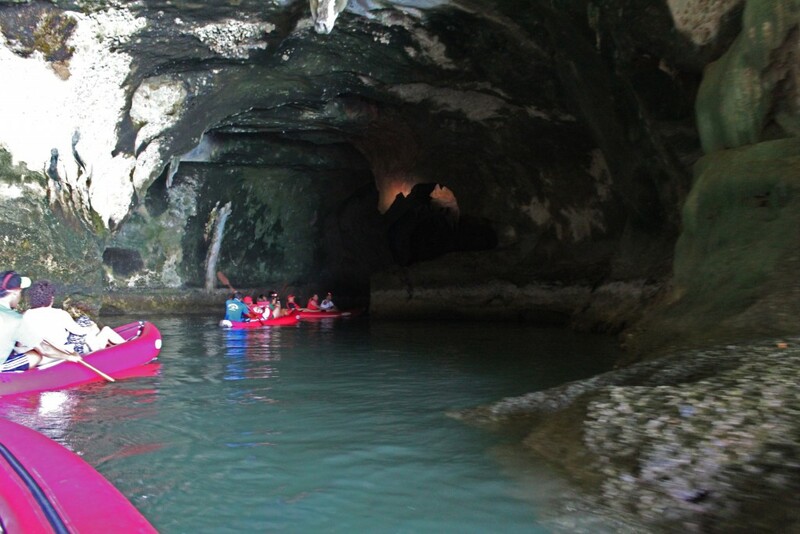 We saw dozens of bats hanging upside from the ceiling as we paddled deeper into the cave, then we turned around and paddled back. Unfortunately it was too dark for my camera to take pictures. Inside the bat cave looking back to the entrance. We saw many bats in the cave, but it was too dark for the camera without a flash and I didn’t want to scare the bats. 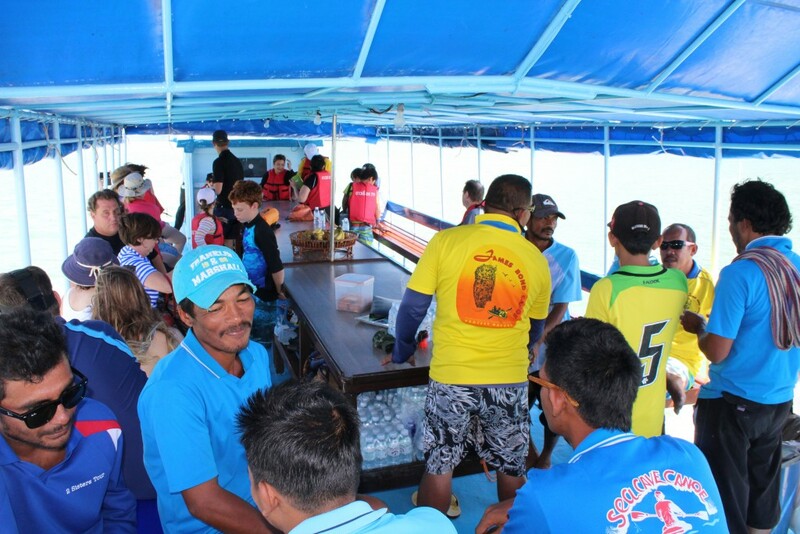 From there we headed off to another island, the crew serving us a very tasty lunch along the way. At Lawi Island we dropped anchor again and were able to go ashore to a nice beach. Janis took a canoe but I just jumped in and swam ashore. 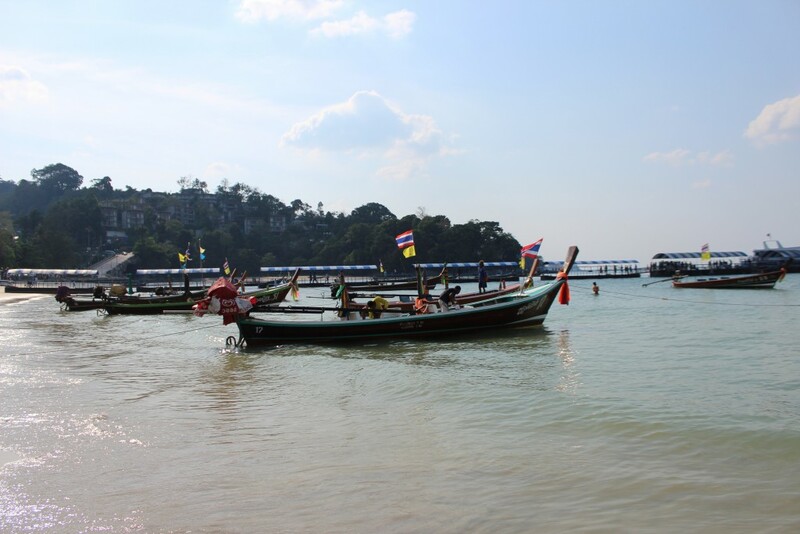 We enjoyed a pleasant swim and soaked up the sun for an hour and then back to the boat again. The beach where we stopped for an hour. Back on Phuket Island we took the long bus ride back to Patong, stopping at a cashew stand that I’m sure must give kick-backs to tour operators because almost every excursion available included a visit to the “cashew factory”. It was not a factory. It was a shop. I don’t know if these additional stops add anything of value to a tour. I could have done without it. But some people were buying so I guess it pays off for them. 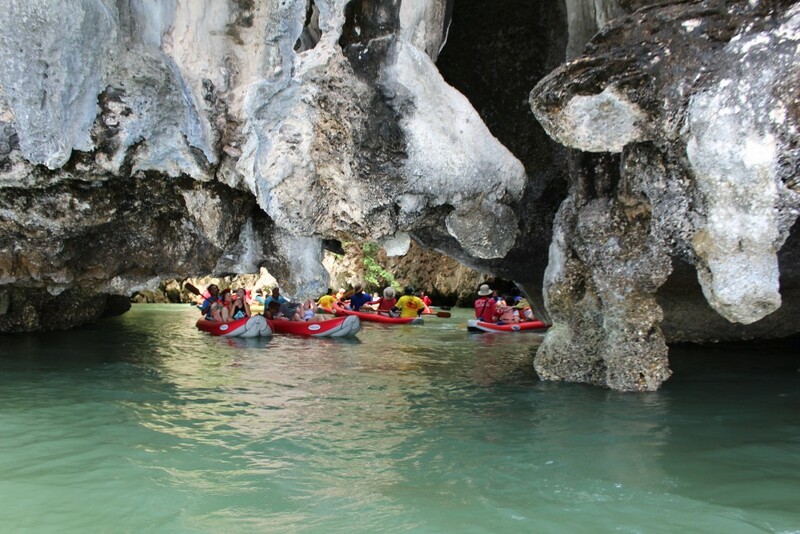 The sea cave adventure was by far our favourite excursion on our cruise – and the most expensive at US$149 a person. Sometimes spending a little more pays off in a big way. At 5:30 PM the cruise ship weighed anchor and we headed off back to Singapore. All in all, a great end to our voyage. 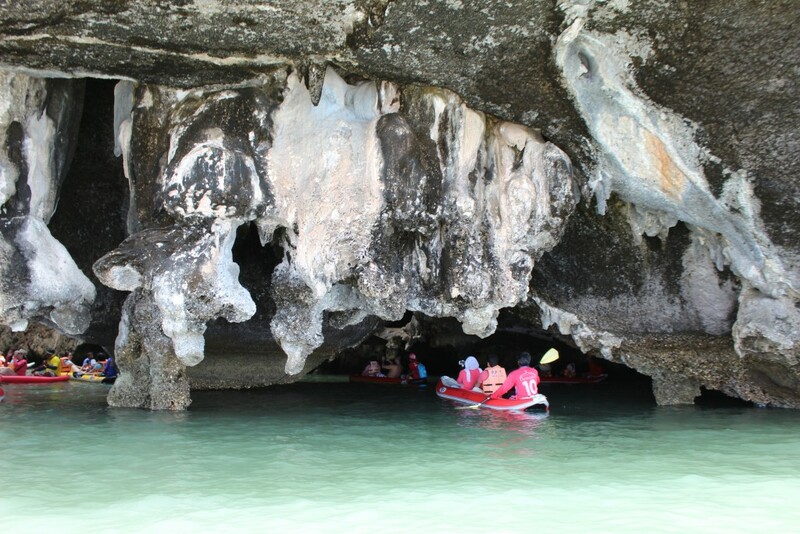 You’ll find additional photos of our sea cave adventure linked below. I’ll be adding an overview of our cruise as a whole next, with links to all ports of call and our extended visit to Singapore. Stay tuned!